I have great respect for George Harrison. 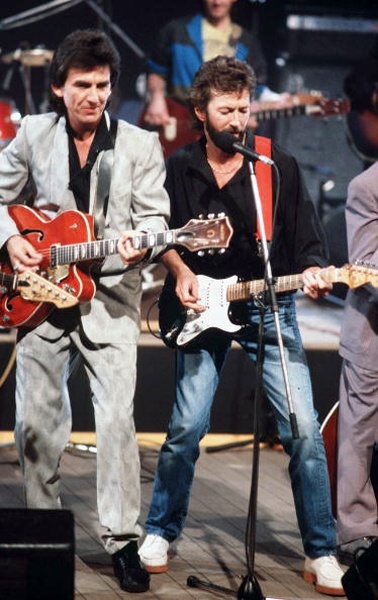 I clearly identified with John more than George during my formative years as i was somewhat radical and sarcastic as he was, but history shows that George became a very good songwriter and musician, even when compared to John and Paul. The “quiet Beatle” added the finishing touches to every Beatle song with a simple majesty that made him one of the premier guitarists of his time. I got all of these pictures and descriptions from other web pages online and tried to give credit when i could find that information. 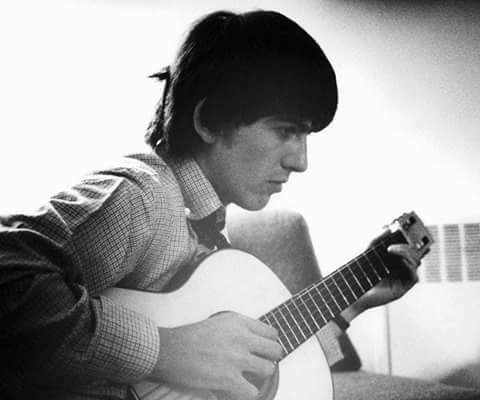 In 1956 George Harrison begun playing acoustic guitar. It was an Egmond 105/0, that also was called Egmond Toledo. 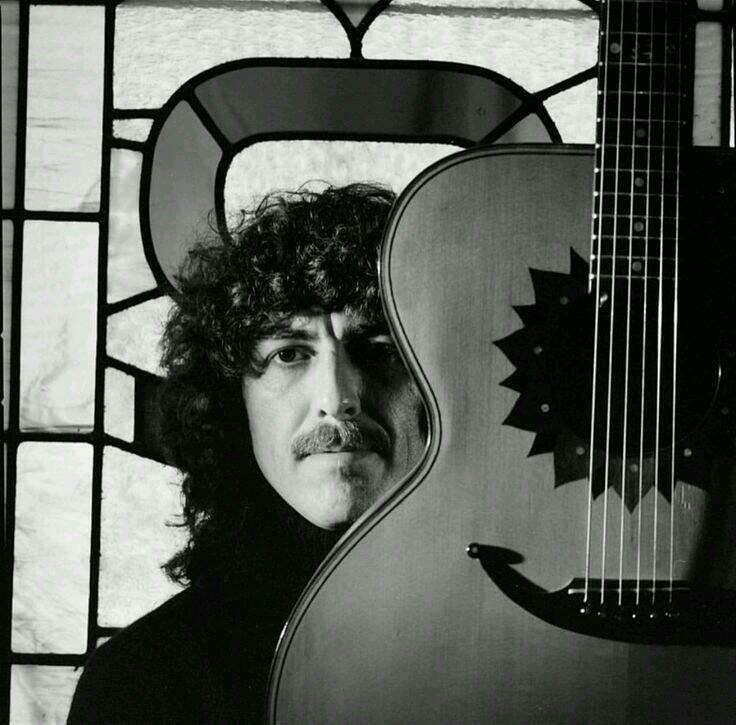 In the UK the Egmond guitars were marketed as Rosetti guitars, so the guitar that George Harrison had, was a Rosetti 276. 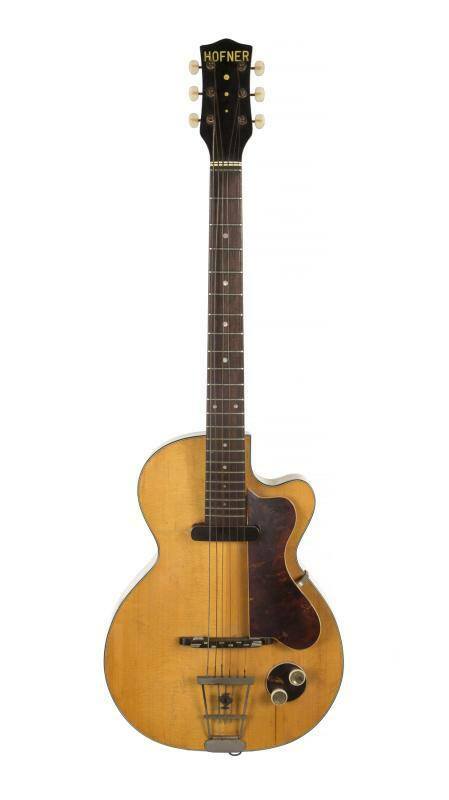 George Harrison’s first guitar — “a real cheapo” his parents gave him — has sold at auction for more than $469,200. The guitar was part of an annual Beatles sale by music memorabilia firm Cooper Owen, conducted Thursday at the Hard Rock Cafe in London. Bids were taken at the cafe, by phone and on the Internet. 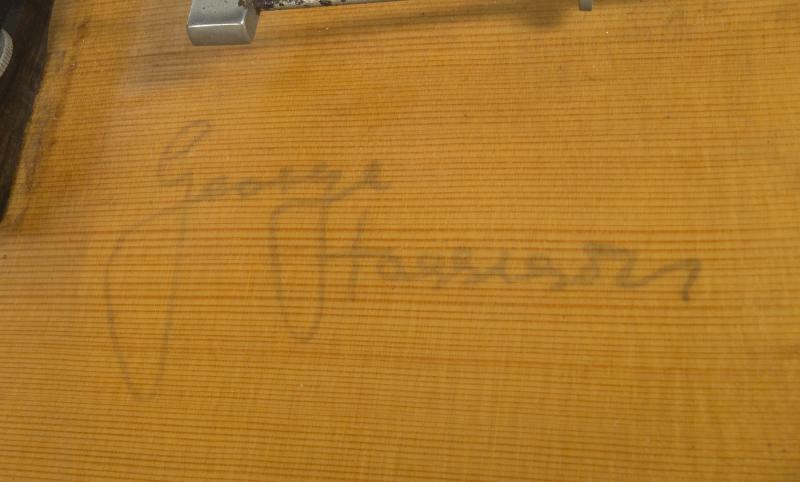 Harrison’s father purchased the guitar from a schoolmate of Georges, Raymond Hughes for $5.95. In The Beatles Anthology book, Harrison described it as “a real cheapo, horrible little guitar but it was OK at the time. A beginner’s guitar, once owned by Beatles guitarist George Harrison, has been discovered after having been stored in a cupboard for more than half a century. It is widely believed that Harrison’s earliest surviving guitar is an Egmond steel strung, Spanish style guitar which was advertised as “the cheapest model in our range”. 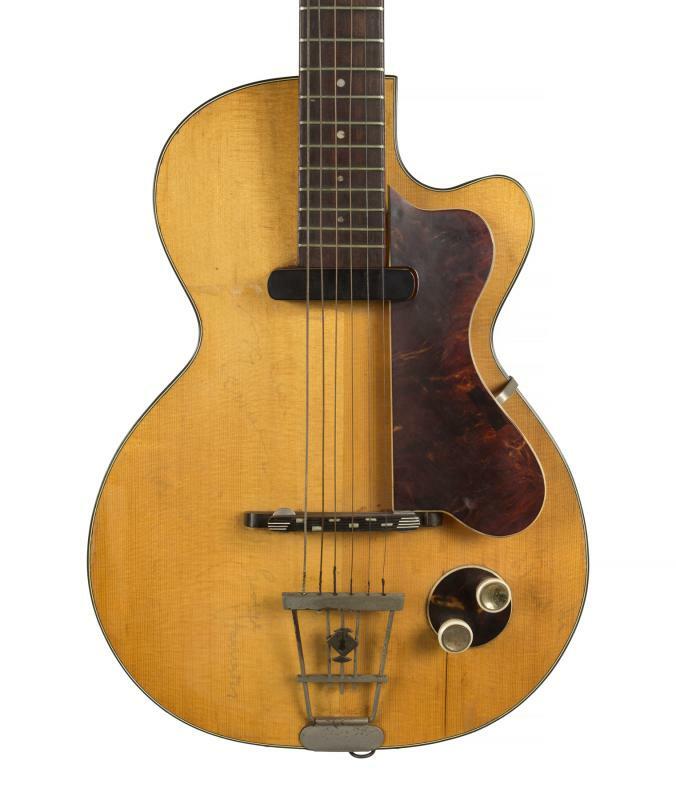 The Egmond guitar, minus its machine heads, was auctioned off in London during the mid 1980s, and thanks to an anonymous British owner was on loan to the Rock and Roll Hall of Fame in Cleveland between 1995 and 2002 before moving in 2003 to The Beatles Museum in Liverpool and is now worth an estimated $800,000. 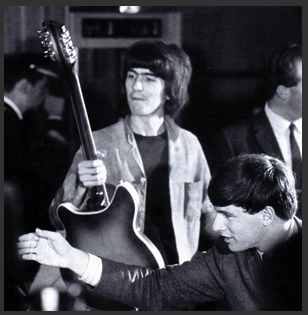 However another beginner’s guitar once owned by Harrison has emerged which may or may not pre-date the famous Egmond. Harrison’s first home was a basic two-up and two-down terraced house in Arnold Grove, Wavertree where he lived with his father Harold Hargreaves Harrison, a bus driver and former seaman, mother Louise, his brothers Harry and Peter, and sister Louise. When George was five years old, the family eventually moved to a new council house at 174 Macketts Lane, Speke and it was here that George developed an interest in learning to play the guitar. George’s first band went by the name “The Quarrymen”, a skiffle group founded by school friend John Lennon in 1956 with George joining in 1958 by Paul McCartney’s recommendation. 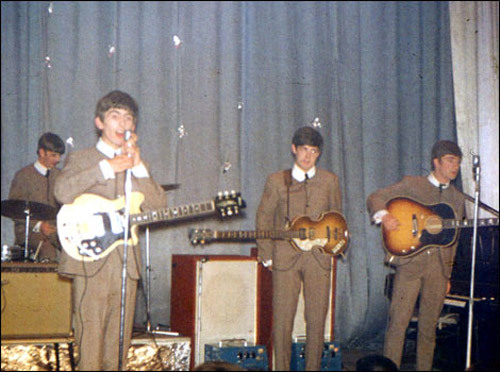 Despite Lennon initially not convinced about George, he was allowed to join the band at just 14 years old. 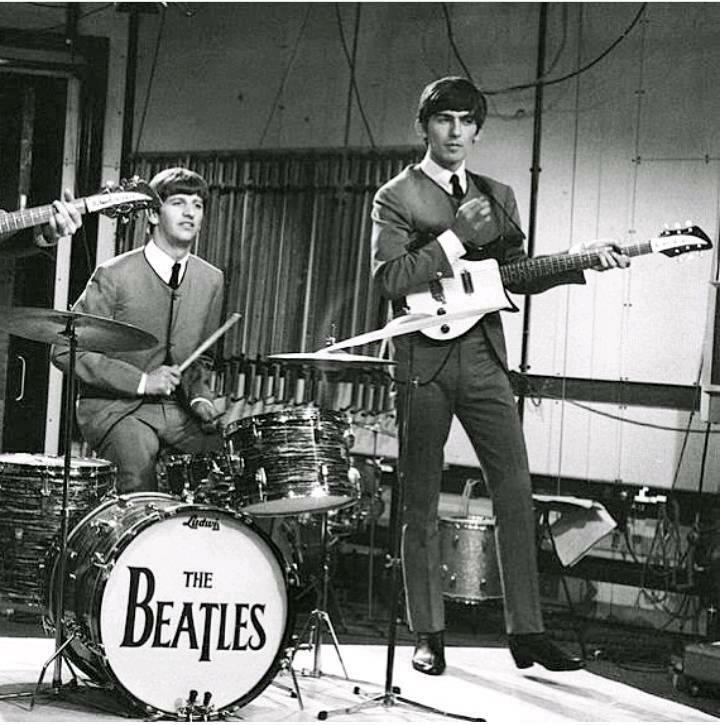 After a self-made recording of Buddy Holly covers, they moved from skiffle towards Rock and Roll causing all but John, Paul and George to leave and in 1960 they changed the name of the band for the final time to The Beatles. From 1962 to 1965, Harold Hargreaves Harrison and his family which included George Harrison lived at 174 Macketts Lane, Liverpool while another George called George Rawlinson lived just nine doors away at 156 Macketts Lane with his mother, Esther and his father, also called George. During this period, The Beatles enjoyed huge success and developed into arguably the UK’s greatest band. However, this came at a price as fans of the group soon learned that George’s home address was at Macketts Lane and many of them used to visit the road and hang around outside the Harrison home hoping to catch a glimpse of their idol. On other occasions, fans would simply turn up and ask where George lived and many of them were quite innocently pointed in the direction of George Rawlinson’s house because he was also called George. Eventually Harold Harrison and his wife Louise found the intrusion of the fans too much and moved into a new home that their son bought for them at Appleton near Warrington. 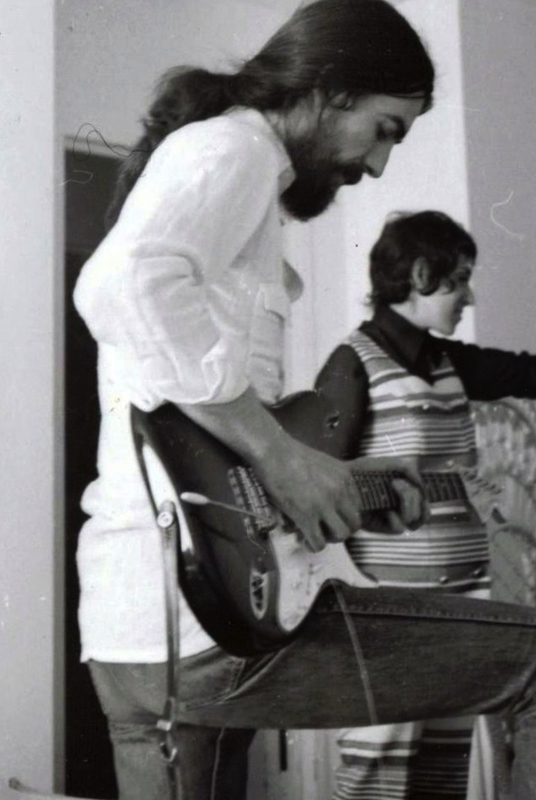 On moving day, the removal men turned up in a huge van to take everything out of the house and George Harrison’s mother Louise spotted George Rawlinson down the road and asked him whether he’d like her son’s old guitar that he used to practice on as child. “He won’t be needing it now” she said and George Rawlinson gratefully accepted and it’s been in his possession ever since. 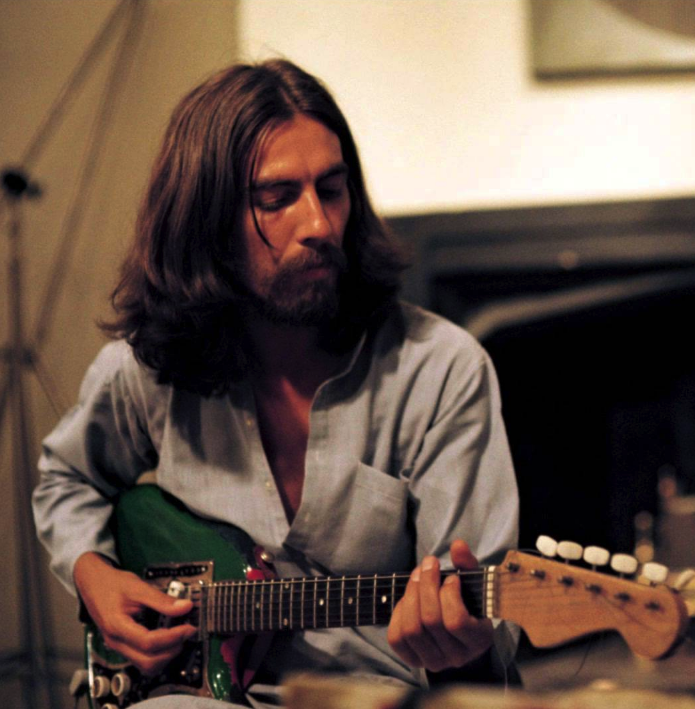 The guitar that was handed over to George Rawlinson was a very basic learning guitar which is believed to precede all other known guitars owned and used by George Harrison. This guitar was offered by Cheshire Auctioneers, The Auction Centre on Saturday 24th June. The Quarry Men at George’s brother Harry’s wedding reception at 25 Upton Green in Speke, Liverpool in December 1958. 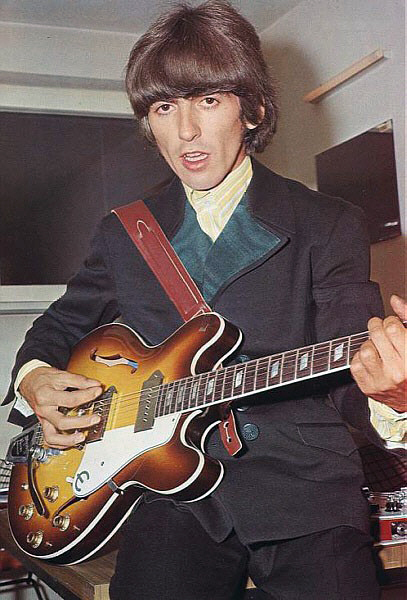 George is holding his 1958 Hofner President guitar. A welcome upgrade from his former guitar. 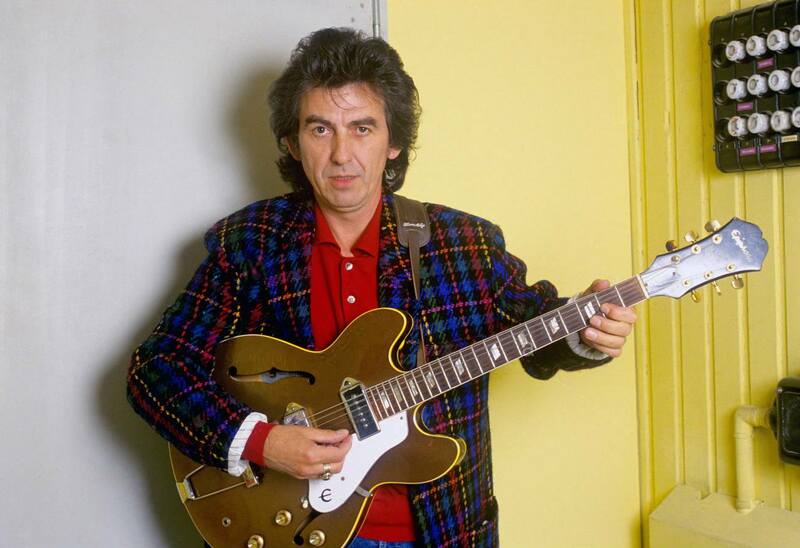 The story is that George swapped this guitar to Ray Ennis (of the Swinging Blue Jeans), for a Hofner Club 40. 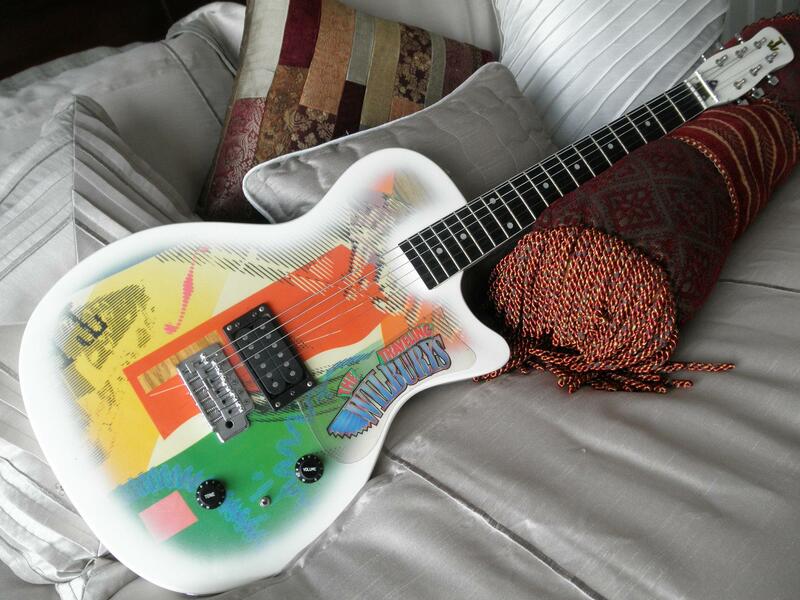 This guitar was recently given to the Harrison Estate by the last owner. Nice! According to one of Mike McCartney’s books, it was taken at Auntie Gin’s son Ian’s wedding. I don’t know who is right so i have included both versions. 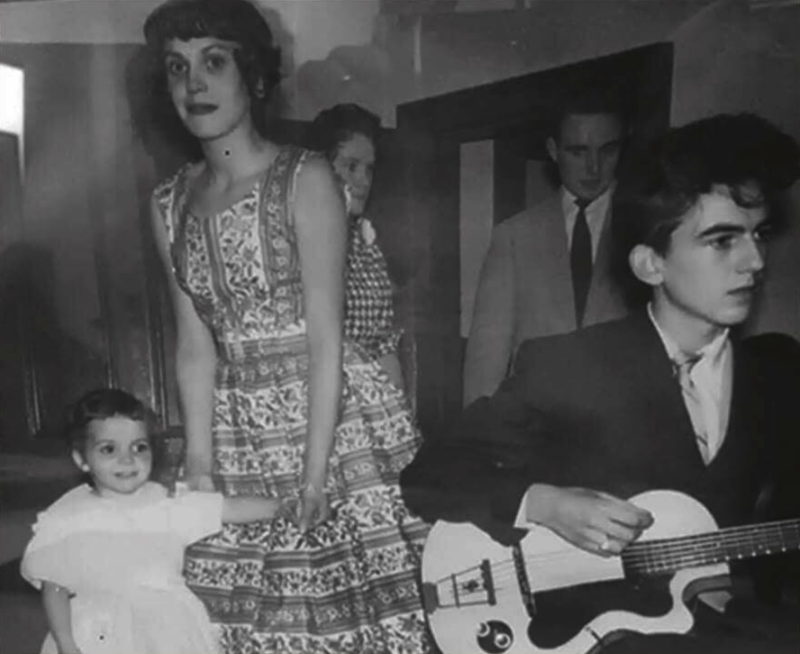 In 1959, George acquired this Hofner Club 40 (on the left in this photo) with this mom. It was slightly different than John’s. In the very early days of The Beatles, when they performed around Liverpool as The Quarrymen, the group had been transitioning from a skiffle band using acoustic instruments to a rock and roll band playing on electric instruments. 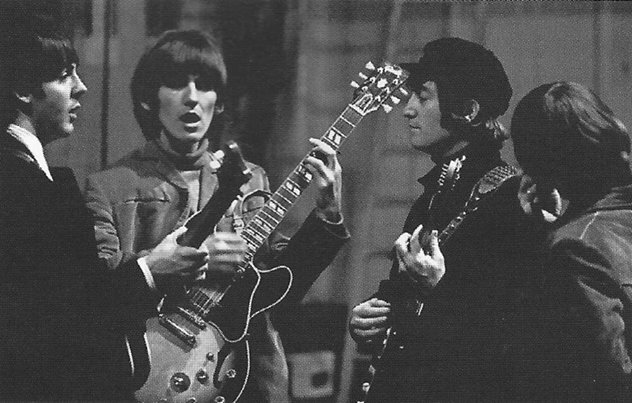 John Lennon, Paul McCartney and George Harrison all made the switch to electric guitar. 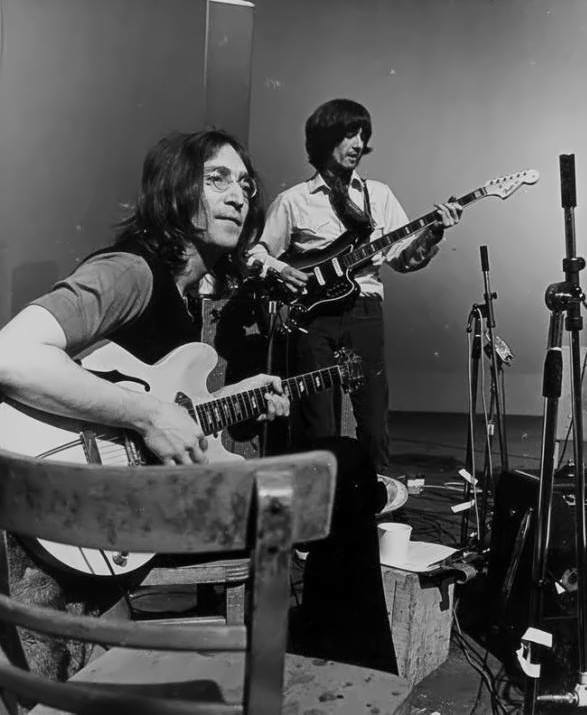 Lennon and Harrison were the first to acquire electric guitars, almost identical Hofner Club 40 models, and they were both excited about getting the pair, as Lennon later recalled in an early 1960s interview: “… But a short time later both George and I saw a Hofner Club 40 and we both thought it was the end.” Lennon got his at Hessy’s Music Shop in Liverpool on August 28, 1959, the famous story when his Aunt Mimi put £17 down on his first electric guitar. The summer of 1959 brought the opening of a new Liverpool hangout, The Casbah Coffee Club in Hayman’s Green, West Derby. It was a teenager’s social club that boasted live music, and it was run by Mona Best, whose son Pete would soon be a Beatle. John, Paul and George were offered a residency at the Casbah. Pete Best recalled that they put the deal to Lennon and McCartney, “They said, ‘Yeah, we’re going for it. Sounds great – our own club. We’ve got a residency!’ Then Mo asked what they were going to call themselves. 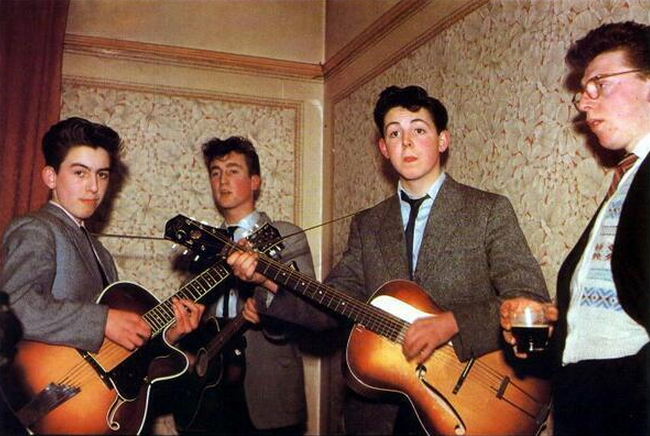 And John said, ‘Well, I had a band called The Quarrymen. How does that sound?’ She said that sounded great. So they took the stage on the opening night as a four-piece, with no drummer.” The Quarrymen continued after that opening night at The Casbah, playing every Saturday through to October. 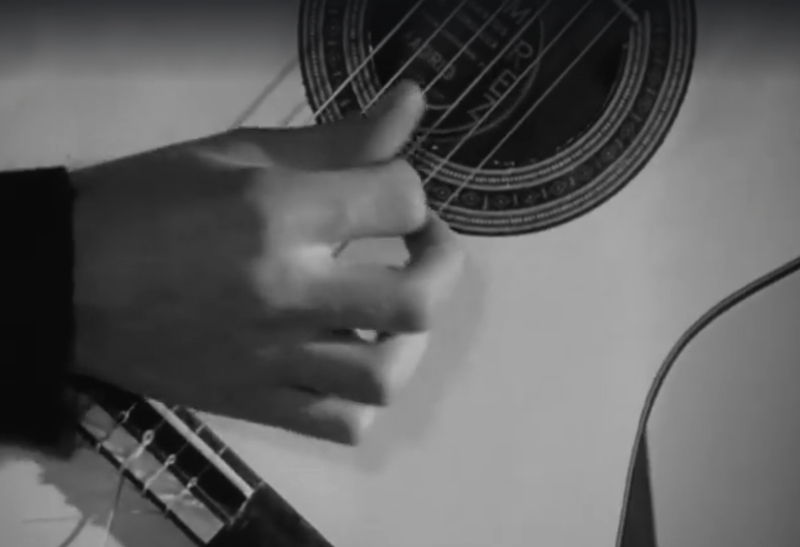 All of the performances by The Quarrymen in 1959 were without a drummer, and if they were questioned about the absence of percussion, the group cheerfully used the line about the rhythm being in the guitars. The fourth member of the group, also on guitar, was their friend Ken Brown. 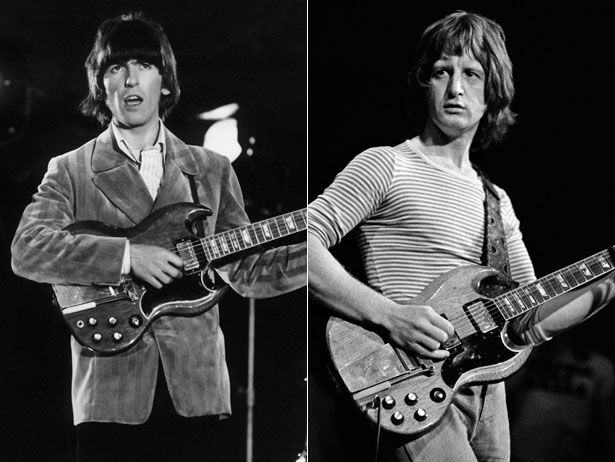 Some rare photos taken during these performances at The Casbah show the infancy of The Beatles with McCartney playing his Zenith guitar while Lennon and Harrison proudly play their first electric guitars, a pair of Hofner Club 40s. 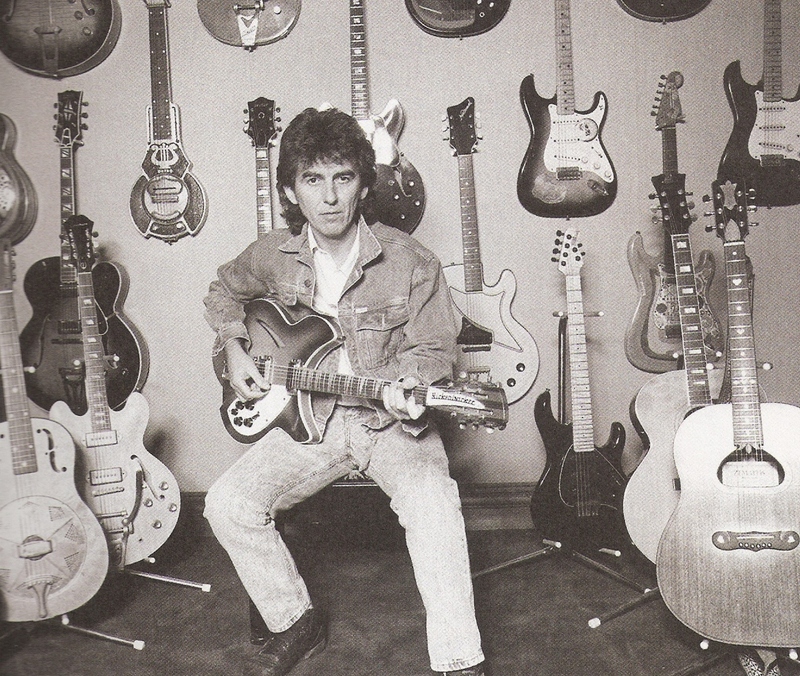 By 1961, as The Beatles became more popular, Harrison had acquired a number of guitars. 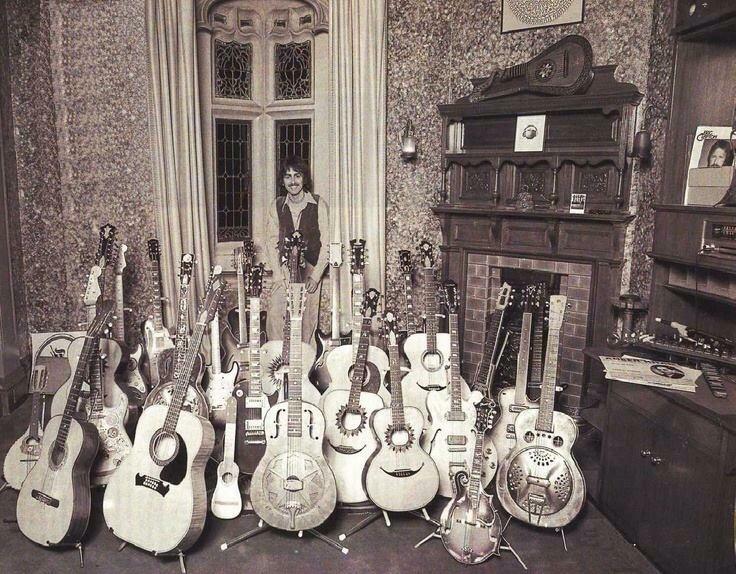 His love for his guitar collection was apparent in photos taken at his childhood home posing with his guitars. 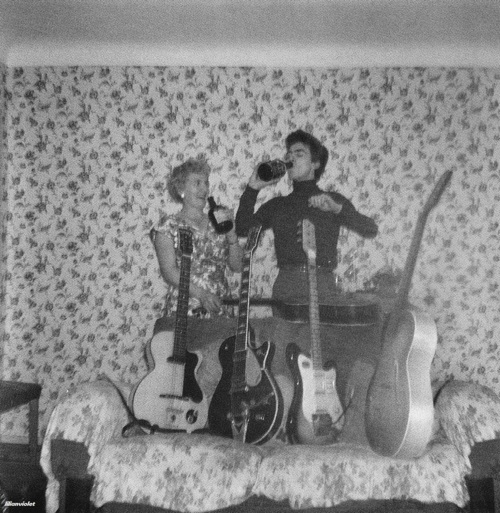 One of these wonderful home family photos was published on page 26 of The Beatles Anthology showing Harrison and his mother both drinking out of bottles of liquor with all five of Harrison’s guitars set up on display in front of them. 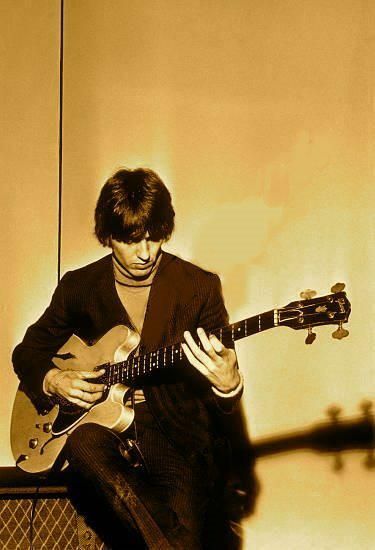 In this photo can clearly be seen Harrison’s first electric guitar, his Hofner Club 40. 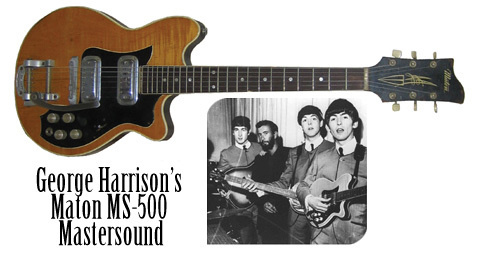 Years later, Harrison’s Club 40 was given away in a promotion for the 1966 Beatles tour of Germany. 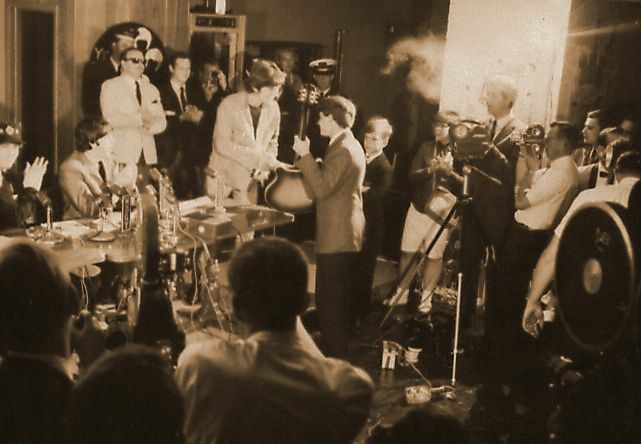 In 1965, Brian Epstein, The Beatles manager, was asked by the Star Club in Germany (a club at which The Beatles had played often in the early 1960s) for an autographed Beatles guitar that would be given away as a prize in a competition for the Best Beat Band of Germany in 1966, which would also promote The Beatles’ 1966 German tour. 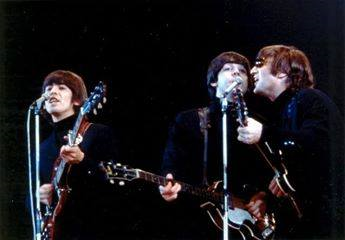 During The Beatles Christmas shows at the Hammersmith Odeon, London, in December 1965, Epstein persuaded Harrison to donate his Hofner Club 40 for the competition. 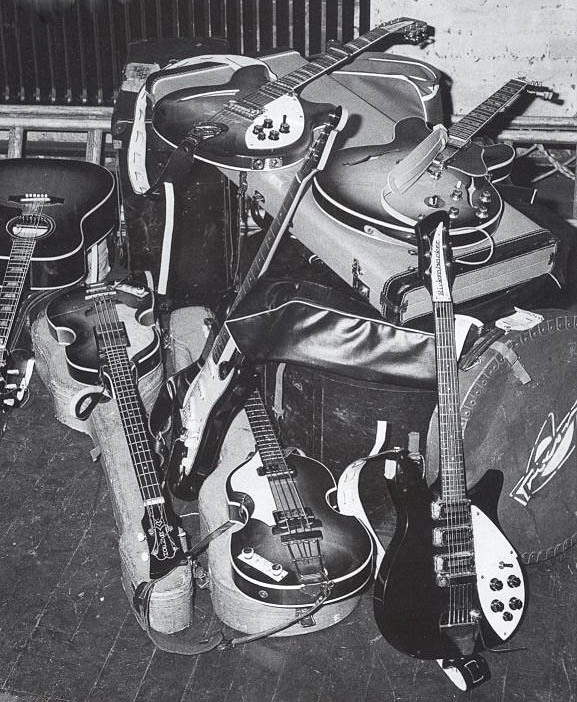 In the German tabloid Bild-Zeitung from mid-December 1965, it stated that a delegation of fans and Star Club officials—including the German Number 1 beat band at the time, The Rattles—brought the guitar back from a Beatles concert they attended at Hammersmith Odeon on December 8, 1965. The article includes a photo of the guitar. In 2003, after my Beatles Gear was published in an earlier edition, Frank Dostal, singer and guitarist of the 1960s German band Faces, contacted this author. 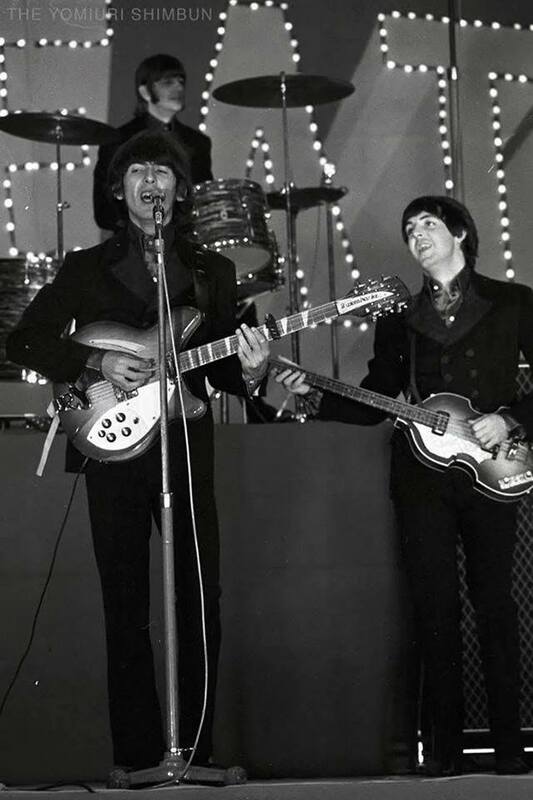 Dostal explained that his band Faces won the competition and was awarded Harrison’s Hofner Club 40 autographed by the four Beatles and that Dostal still owned the guitar. 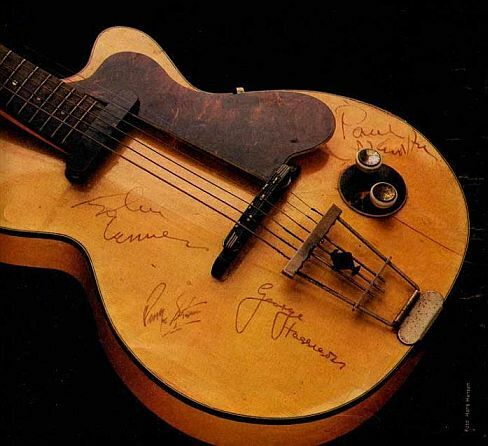 Frank Caiazzo, an expert on Beatles autographs, examined the guitar soon after and determined that the signatures on the guitar were not done by the four Beatles but by their road manager, Neil Aspinall, who by late 1965 would often sign the Beatles’ names on many souvenirs and promotional items. 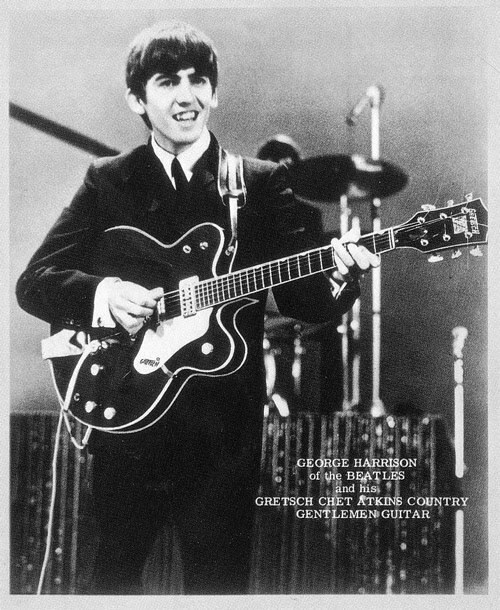 Nonetheless, the guitar was indeed George Harrison’s actual Hofner Club 40 guitar. Photos taken of the Faces with their winning prize Beatles guitar appeared in magazines in 1966. 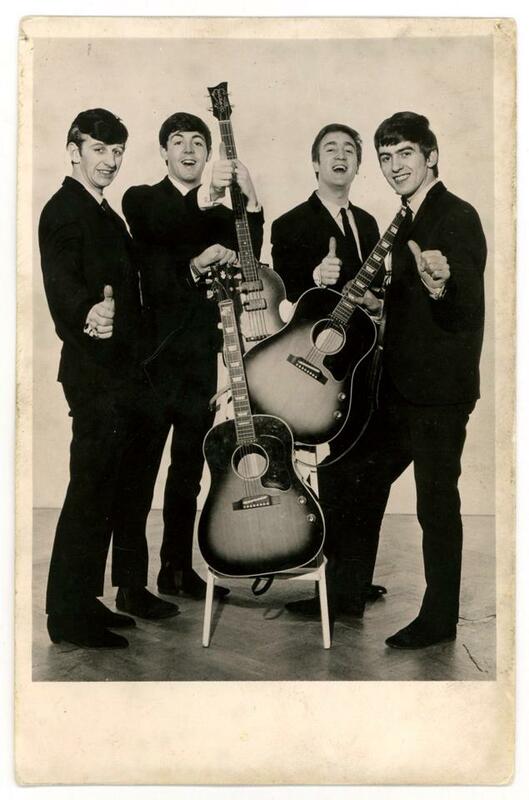 Later that year, Dostal visited The Beatles backstage during their Hamburg concert on June 26, 1966, to thank them personally for the guitar and brought a new Tubon keyboard as a gift. Photos taken of The Beatles backstage in Hamburg show Dostal giving Paul McCartney the Tubon keyboard. Dostal passed away in 2017. His widow, Mary Dostal, who was a member of the Liverpool girl group The Liverbirds, has decided to offer the guitar at Julien’s Actions. 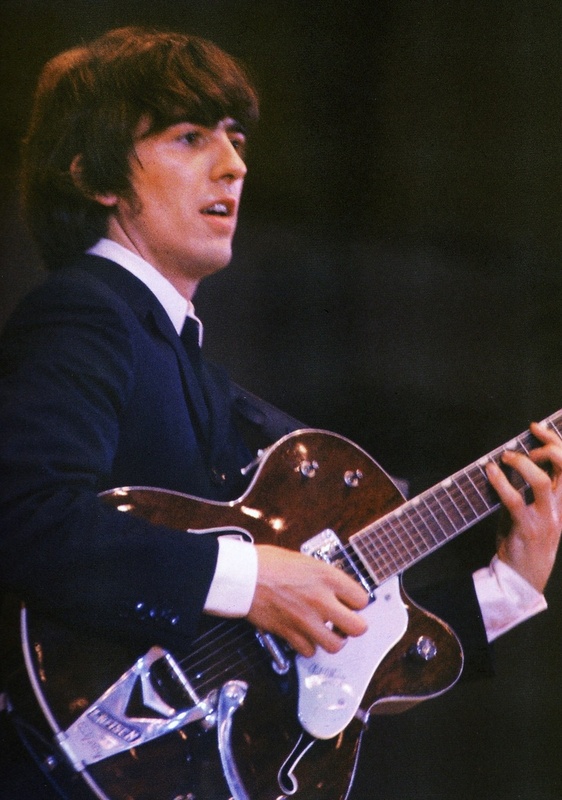 George Harrison’s Hofner Club 40 guitar is a small single-cutaway hollowbody instrument built with a spruce top, maple back, and sides in a natural blond wood finish with black body binding. The short-scale guitar has a 22-fret neck with an unbound rosewood fingerboard with dot inlays and is joined to the body at the 14th fret. The guitar has a Hofner trapeze “badge” style tailpiece, an adjustable floating bridge, a tortoise shell colored pickguard, one single-coil black “bar” pickup in the neck position and an oval style control panel with volume and tone “teacup” style knobs. The headstock is fitted with 3 on a side tuning pegs and features a horizontal Hofner headstock logo with three vertical dot inlays. 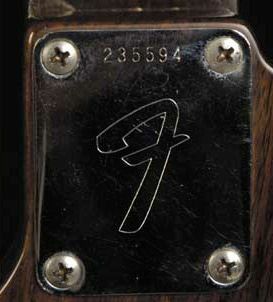 The back of the headstock is stamped with the serial number 244. The Futurama “was a dog to play,” he recalled in the Guitar Player interview (November ’87). In the Anthology book, Harrison recalls the day he found this instrument in Rushworth and Dreaper’s shop in Liverpool. 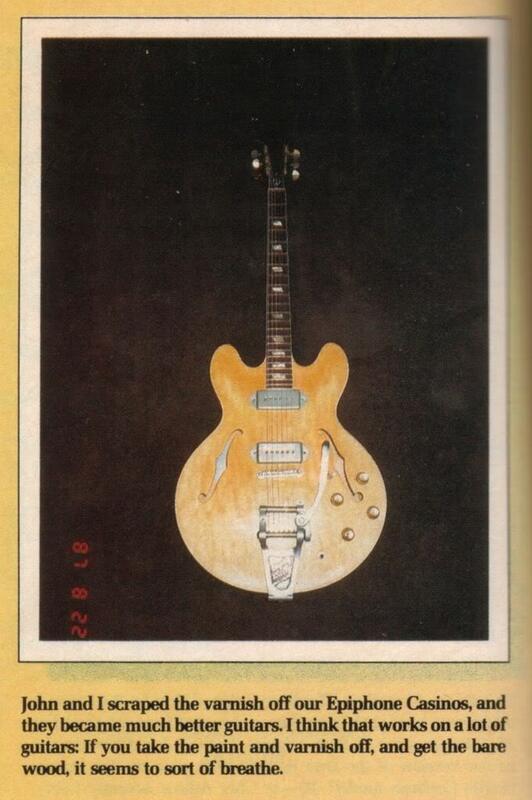 Records show that Brian Epstein eventually paid off the account on this guitar. What happened to the Futurama? In ’64 Harrison gave it to Beat Instrumental magazine to raffle off, but the winner decided he’d rather have the money, so publisher Sean O’Mahoney paid the man and kept the Futurama, and he still has it. Stats: Gretsch PX6128 Duo Jet, a late 1957 model, featured a solid body, “cloud” inlays, a Bigsby® vibrato, black finish with a silver pick guard, and two DeArmond pickups. 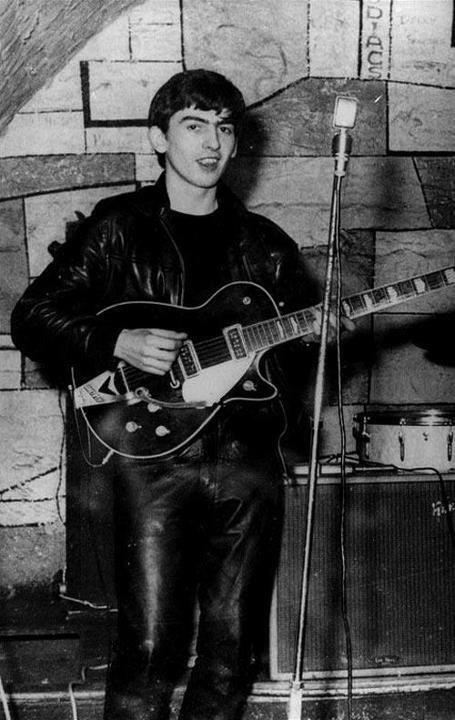 George bought it secondhand for £70 from a Liverpool cab driver a year earlier at age 18, in summer 1961. After acquiring the guitar, Harrison played it during the historic three-year period when the Beatles made their momentous transformation from local favourites to U.K. sensations to worldwide phenomenon. Harrison retired the Duo Jet in spring 1963 when he acquired other guitars including the Gretsch Country Gentleman® and Tennessean® models. 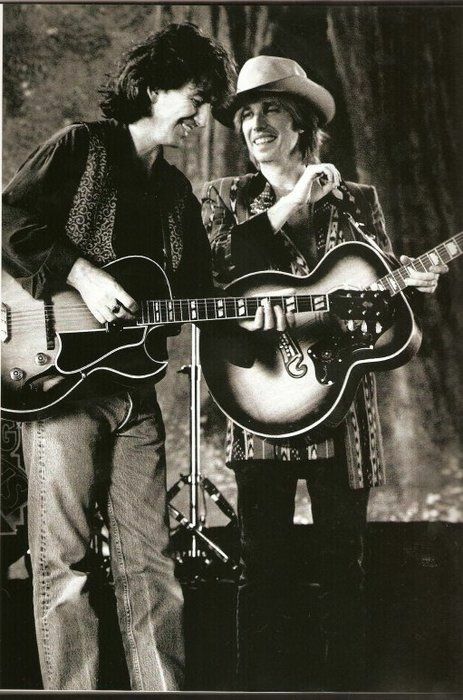 In the mid-1960s, he gave the Duo Jet as a gift to bassist and artist Klaus Voormann, a longtime friend of the band from the Hamburg days well known to Beatles fans as the designer of the seminal 1966 Beatles album Revolver, as well as the mid-’90s BeatlesAnthology albums. 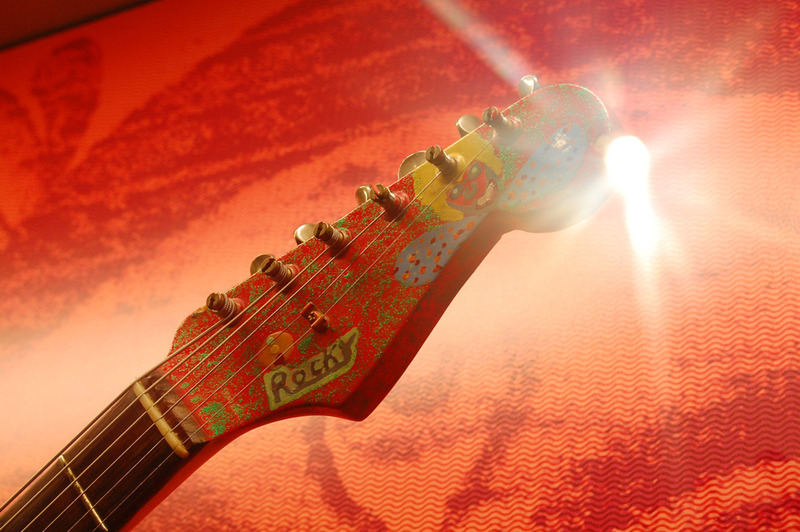 This guitar was originally shipped from the factory and was painted “Fireglo” Red. Purchased from Fenton Music Store at 601 South 10th Street, Mt Vernon, Illinois in the fall of 1963. It was painted black by store owner Lester “Red” Fenton at Georges request, to match John’s Rickenbacker. Only used extensively until early 1964. Note: I wanted to label this as the 420 because it has been well documented that the 420 had no vibrato (which this does not). The 425 model has a vibrato. John F Crowley noted that When Rickenbacker first introduced the 425 in 1958 it had no vibrato. 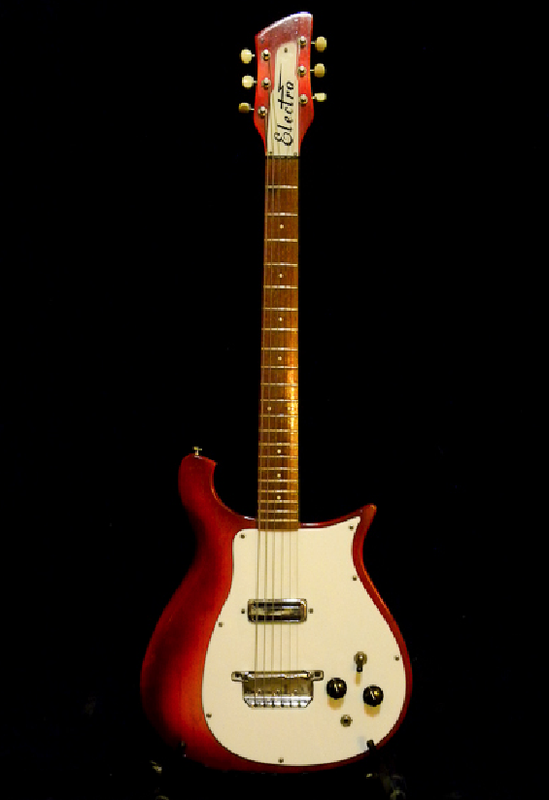 In 1965, Rickenbacker added the vibrato unit to the 425 and designated the vibrato-less 425 as the model 420. It has also been confirmed by Mr. John Hall (of Rickenbacker International Corporation), that this instrument was shipped by the factory, in error, as a Model 425 even thought it was in fact a Model 420, having no vibrato. 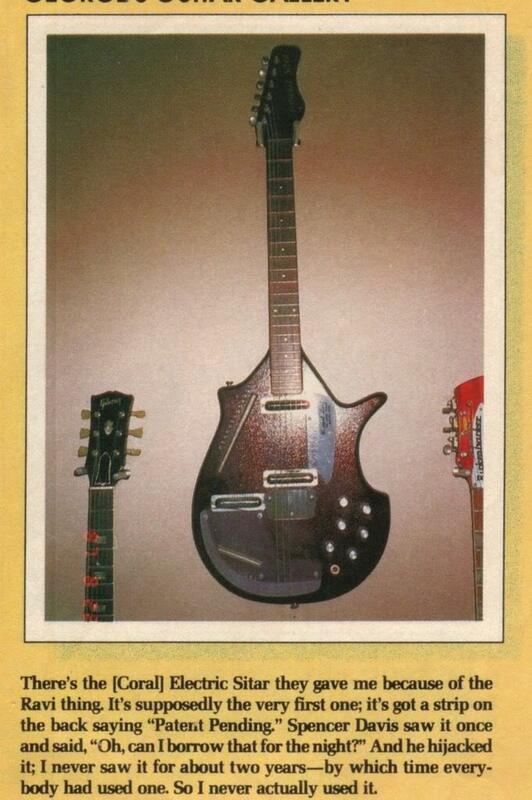 Interesting Note: This model was also an Electro ES-17 made by the Electro String Instrument Corporation. Designed by Rickenbacker co-founder George Beauchamp and assisted by Paul Barth and Harry Watson. The company known then as Electro String Instrument Corporation, added the Rickenbacker name to it instruments. In the 1950’s, the Electro name was dropped and Rickenbacker became the only brand banner, but the company chose to revive the Electro logo in the early 1960’s for use on 2 – 6 string solid body electrics. Many of the early examples bear the name Electro. Credit: 2,000 Guitars – The Ultimate Collection. 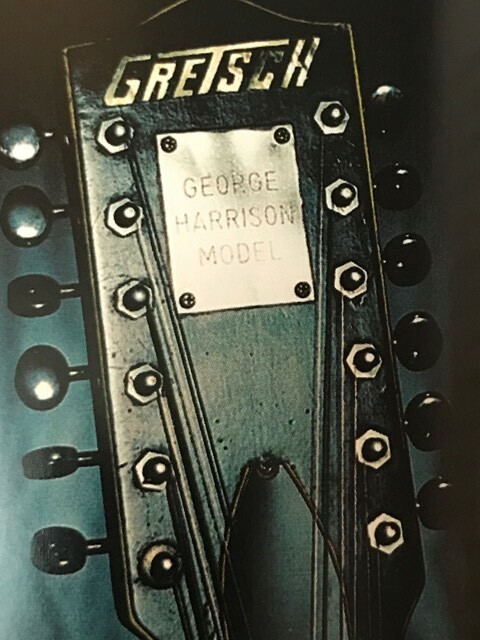 Harrison gave this guitar to George Peckham, a mate from Liverpool (he played in Earl Royce and the Olympics, and later as rhythm guitarist for the Fourmost) who had become cutting engineer for Apple and rhythm guitarist for a new band, Matchbox. 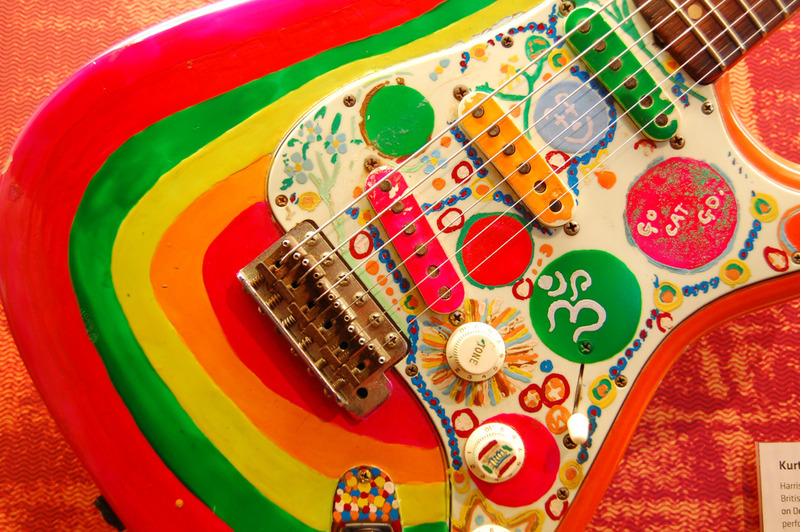 Harrison learned the band was about to appear on “Top of the Pops” but Peckham had no guitar, so Harrison loaned him “Rocky,” his psychedelic-painted Fender Stratocaster. 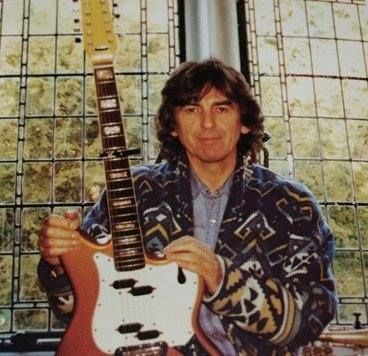 When Peckham returned it, Harrison asked him if he wanted a guitar, and offered him the 425 calling it a “great rhythm player.” Peckham kept it until September 1999, when he put it up for auction it at Christie’s. 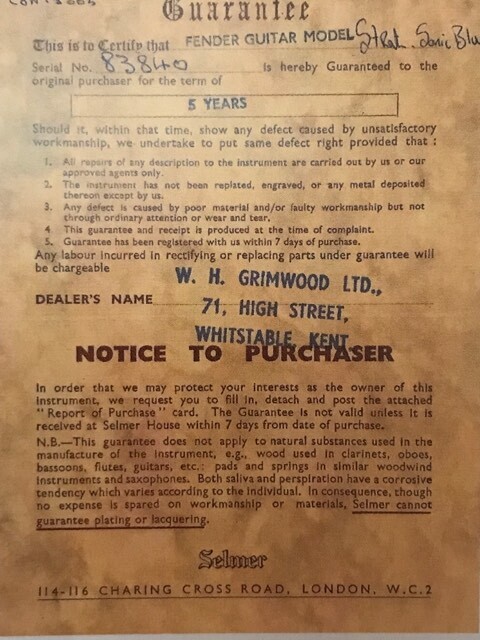 All though the auction was posted as completed, for some reason the high bidder rescinded his bid, and the auction house brokered a sale to another party for £56,500 (about $90,000). 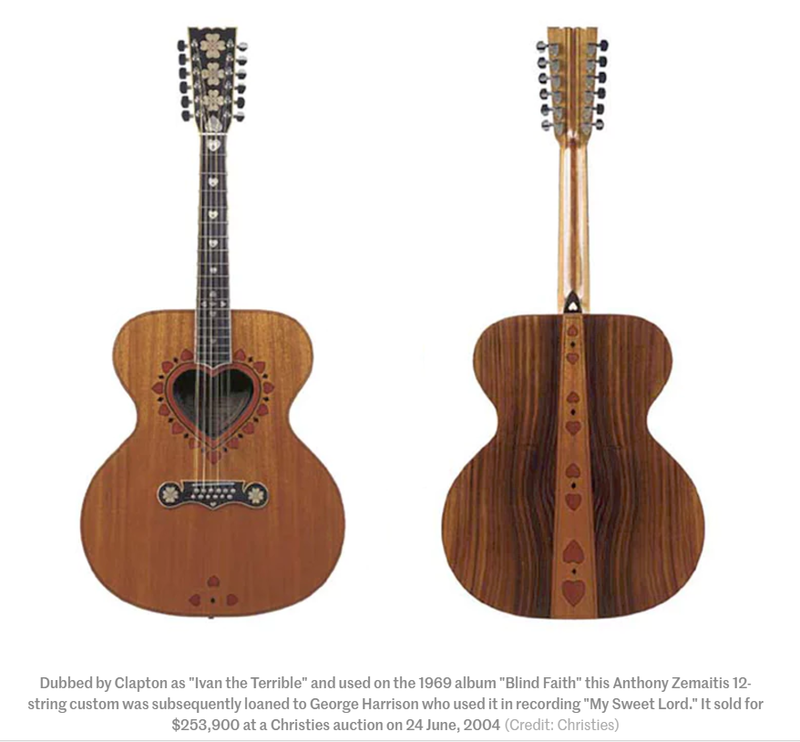 Christie’s records are confidential, but soon after the sale, the Rock and Roll Hall of Fame received this guitar on indefinite loan from one Sharon Mineroff, who reportedly was apprehensive about keeping it in the house. So there it sits in Cleveland, not that far from where Harrison found it. Harrison modified his Rickenbacker 420 by adding another pickup and a switch. Rickenbacker made a two pickup version of this same body style. It was known as the Rickenbacker 450. Note that Harrison’s guitar does not have the same control layout as a model 450. A 1962 Rickenbacker 425, owned by George Harrison and believed to be the guitar he used on ‘I Want to Hold Your Hand,’ will go up for sale at auction this week. The instrument is expected to sell for somewhere between $400,000 and $600,000. 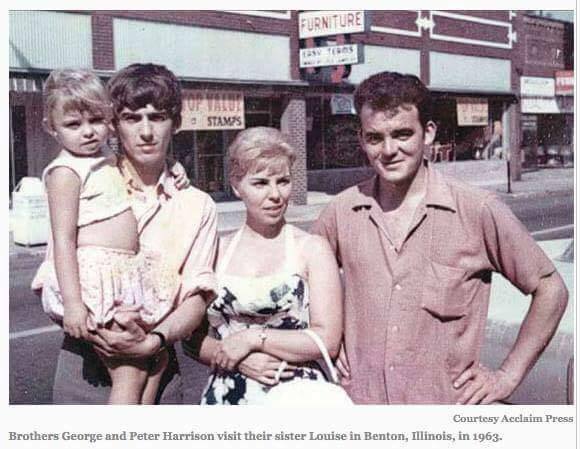 Julien’s Auctions, which specializes in celebrity memorabilia, says that Harrison bought the guitar at Fenton’s Music in Mount Vernon, IL, when he took a two-week vacation to visit his sister. 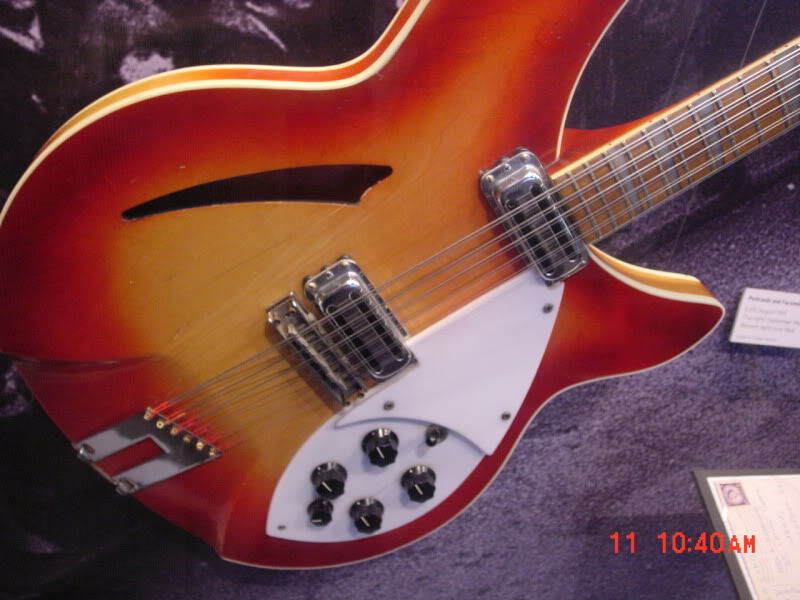 Although originally produced in the Fireglo finish, Harrison asked the store owner to match John Lennon‘s black Rickenbacker. It seems that Harrison only played the guitar for a few months. He used it on two high-profile TV apperances — ‘Ready Steady Go!’ in October (embedded above) and ‘Thank Your Lucky Stars’ in December — and a tour of Sweden. 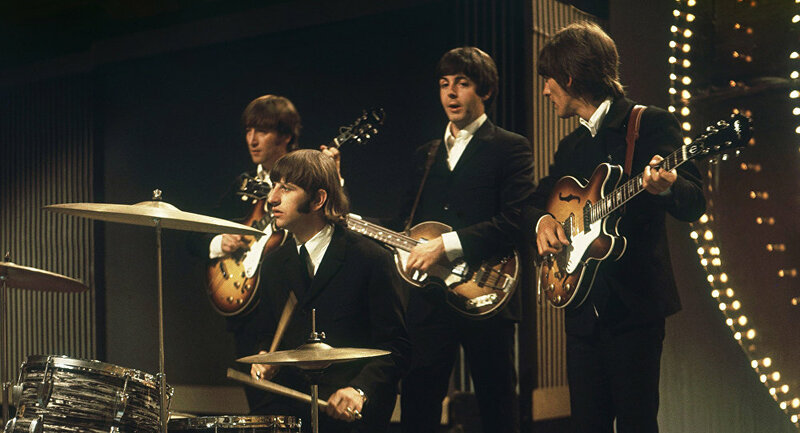 By the time the Beatles landed in America, he had switched back to the Gretsch Chet Atkins Country Gentleman that he played on ‘The Ed Sullivan Show.’ However, during that first Beatles trip he was given a gift by Rickenbacker president Francis C. Hall, the second 360/12-string model ever made. 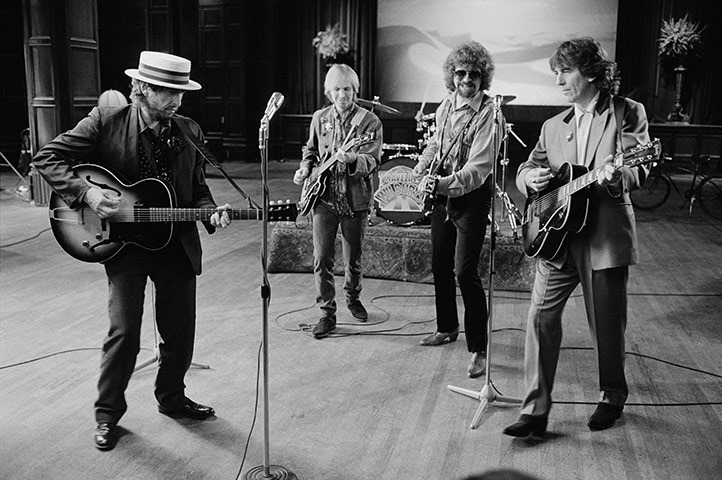 Harrison would popularize the guitar in the film ‘A Hard Day’s Night,’ which famously inspired the Byrds to purchase the same instrument. 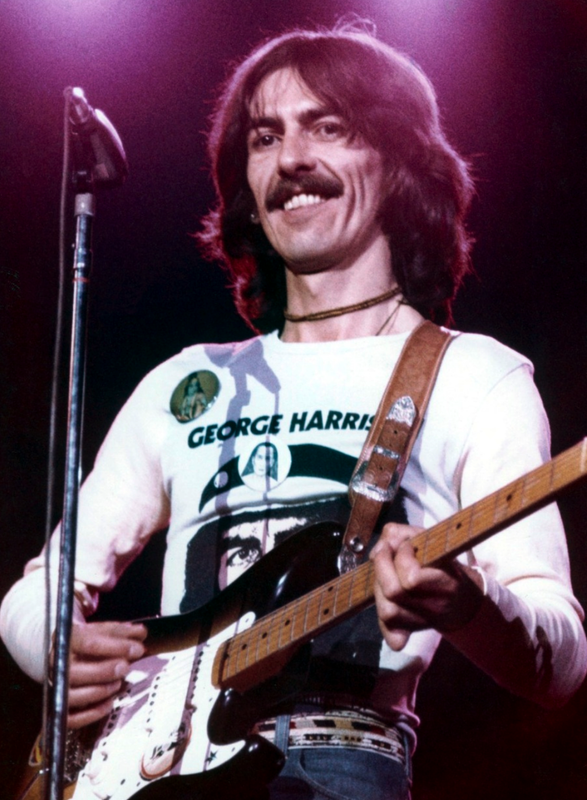 Harrison eventually gave the 425 to George Peckham, who played in Liverpool band the Fourmost, under the condition that it never be modified. 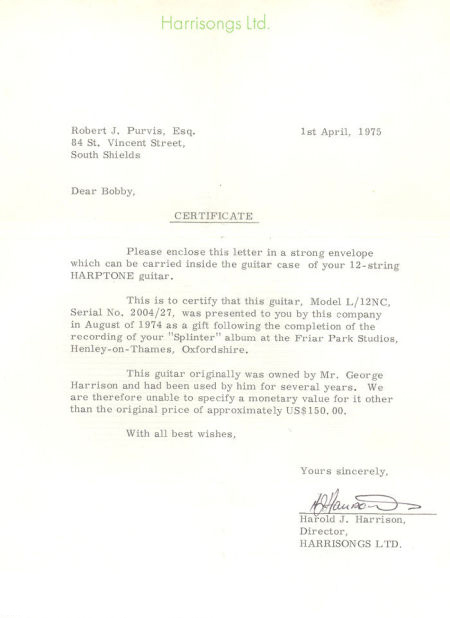 The auction comes with letters from Harrison’s office — one of which was signed by Olivia Harrison — and Peckham that confirm that the guitar had belonged to Harrison. The auction will take place Saturday, May 17. This guitar was borrowed by George Harrison from Barratts of Manchester while Harrisons first Gretsch Country Gent was being repaired. The guitar can be seen shows in photos from shows at the Grafton Rooms, Liverpool, on 12 June and the Winter Gardens, Margate, in early July. This guitar eventually found its way into the hands of Roy Barber, rhythm guitarist for Dave Berry’s backing band The Cruisers who swapped his Fender Stratocaster for the Maton at Barratt’s store and was told by the owner it was the one recently used by Harrison. Barber stopped using . . . the guitar several years later and for 20 years it lay abandoned in its case in the attic of his home in Totley, Sheffield. 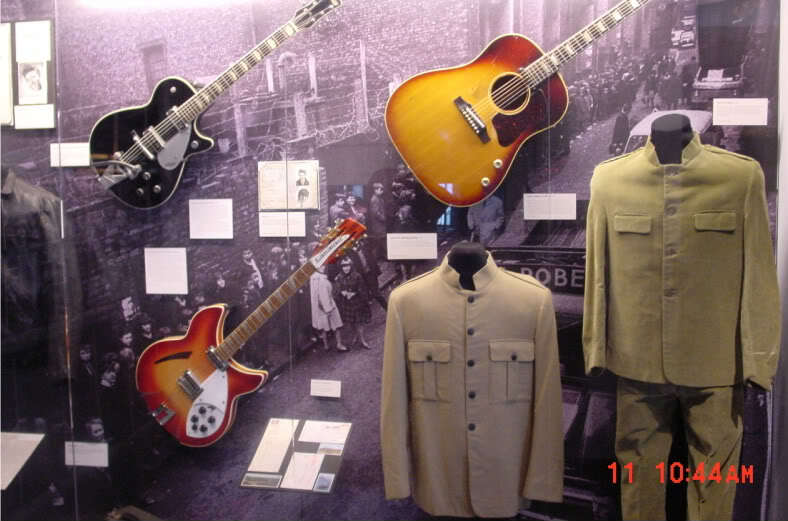 After Barbers death the guitar was exhibited at the National Centre for Popular music in Sheffield UK and was eventually sold to a private collector at auction in November of 2006. 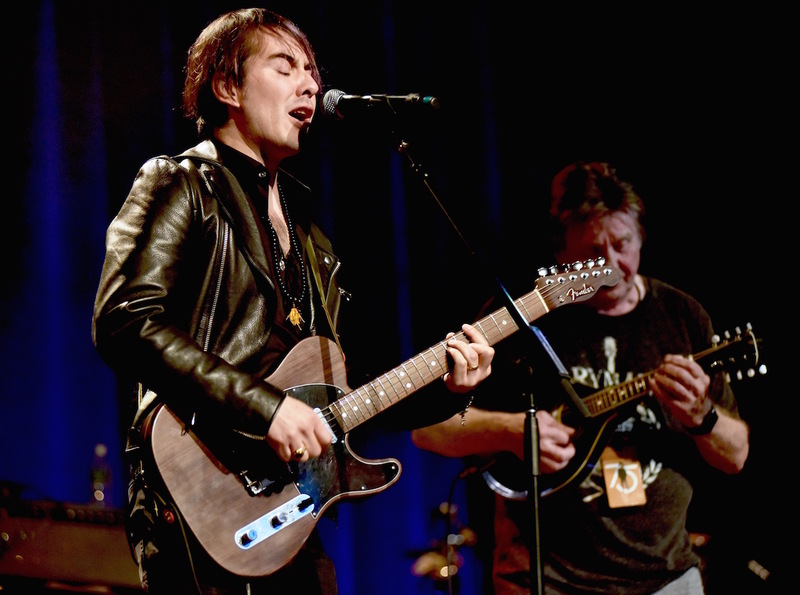 This guitar was auctioned off by it’s owner at Julien’s Auctions on May 16, 2015 for $485.000. The new owners name was not announced. Purchased in April/May 1963 for £234 at Sound City in London. Back in England, the group attended the July 29th royal premiere of Help! held at the London Pavilion cinema on Piccadilly Circus. Next on the agenda was to prepare for another American tour. So the day after the premiere, the group held a private rehearsal on the stage of the Epstein-run Saville Theatre in London. Here the group ran through songs for two important upcoming television programs as well as their imminent US tour. The first of the TV shows, on the following Sunday, was Blackpool Night Out for British ABC. After the Saville Theatre rehearsals the group travelled up to the Lancashire town, just north of Liverpool, but during the journey an incident occurred that depleted the group’s instrument collection. The colourful story is told by Beatles’ chauffeur Alf Bicknell. There then followed some complicated and, for Bicknell, agonizing moments as he re-traced their steps and searched for the missing Gretsch. “We found it,” he remembers, “which was quite a surprise to everybody. We found a piece here and a piece there and pieces all over. The guitar and its case were smashed to bits. I’m convinced it was the big truck we passed that ran over it. We never even bothered to pick it up, but just left it there lying in the street, because by now we were pushed for time. Nobody blamed me after that – nothing more was said about it. 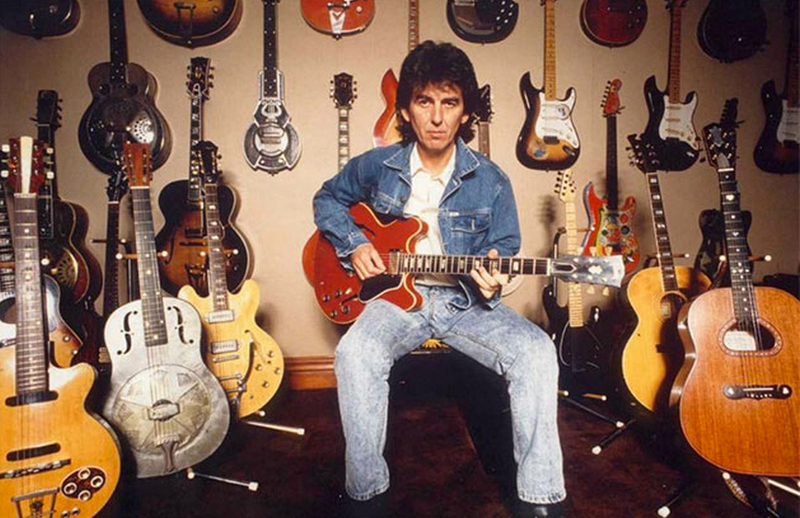 It just turned out to be one big joke.” The guitar lost was Harrison’s first Gretsch Country Gentleman, with the dual “screw-down” mutes, which by this time was carried only as a spare. 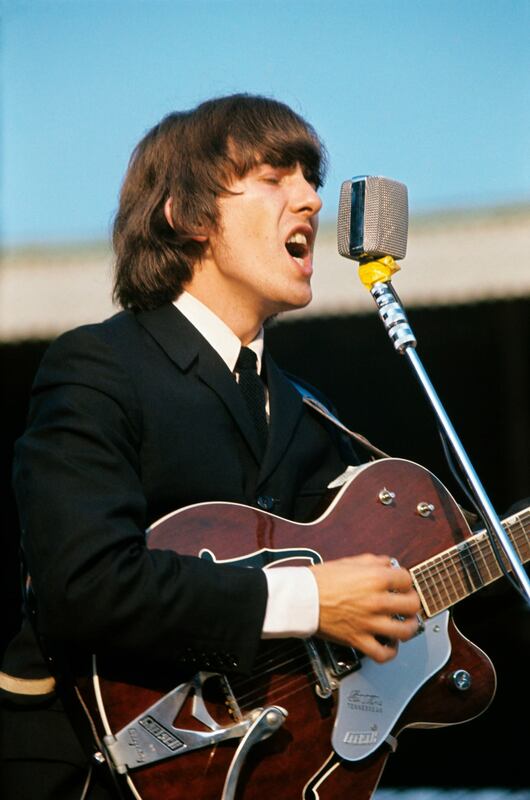 The guitarist’s favoured Country Gentleman, his second, with dual “flip-up” mutes, managed to survive with Harrison throughout the remainder of 1965. 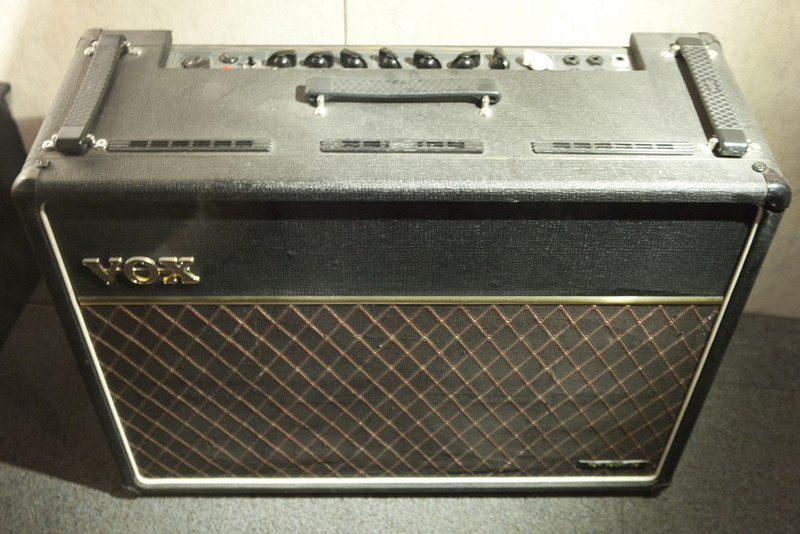 One of Georges VOX AC30 Studio amps on display. 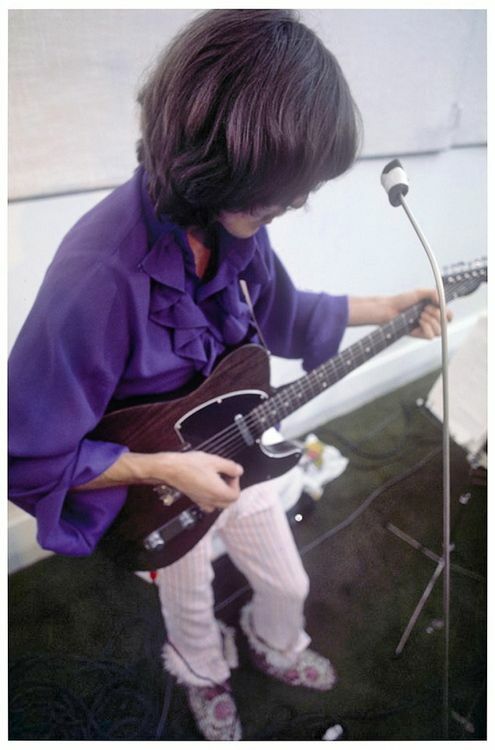 When his first Gent went back to Sound City in London for repairs, they gave Harrison this one, identical to his first except for the mutes, which were flip-up rather than dial-up, and Harrison came to prefer it. Seen on the Sullivan shows and used on the ’64 U.S. tour, this was the guitar for the Beatles’ first flush of worldwide success. What happened to this guitar? 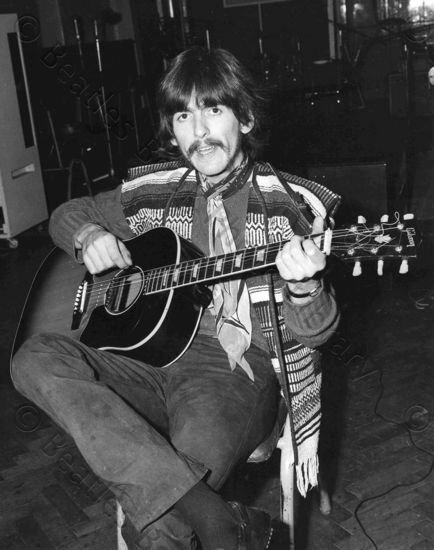 Brian O’Hara of The Fourmost, interviewed by Andy Babiuk, said Harrison gave him the Country Gent during a studio visit at Abbey Road and that he (O’Hara) remembers trading it for something or other. In the ‘90s, Gretsch re-introduced the 6119 as the Tennessee Rose and also utilized the Electrotone body with the painted F holes. 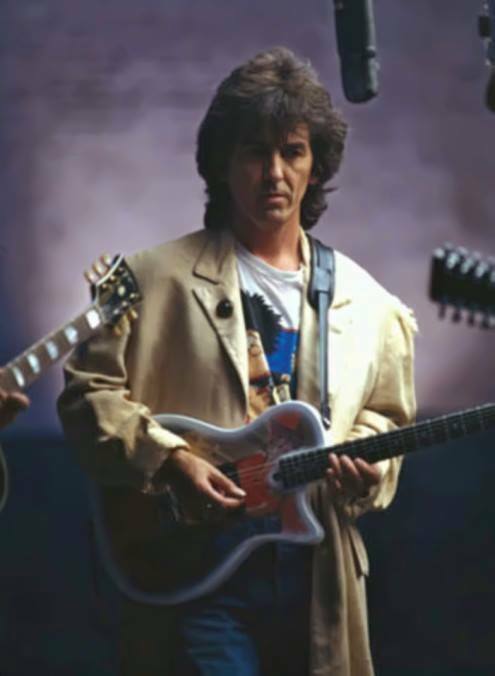 I watched the First Shea Stadium concert and noticed that George used his 1962 Gretsch Tennessean exclusively that night! Lot # 1224 Sold for $179,200.00 at Julien’s Auctions. Fees included in the price. 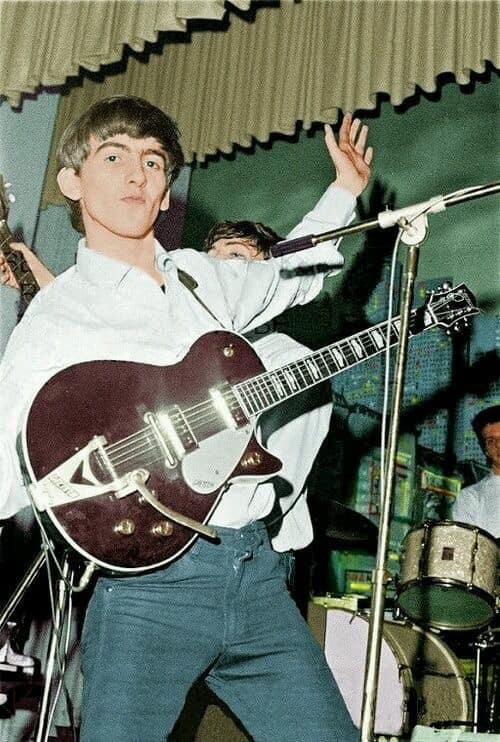 I was sure this was the guitar George used at the Shea Stadium concert, but Klaus pointed out that it was not the same guitar that Ringo was given as it did not have the white bindings around the f hole, which i never noticed. 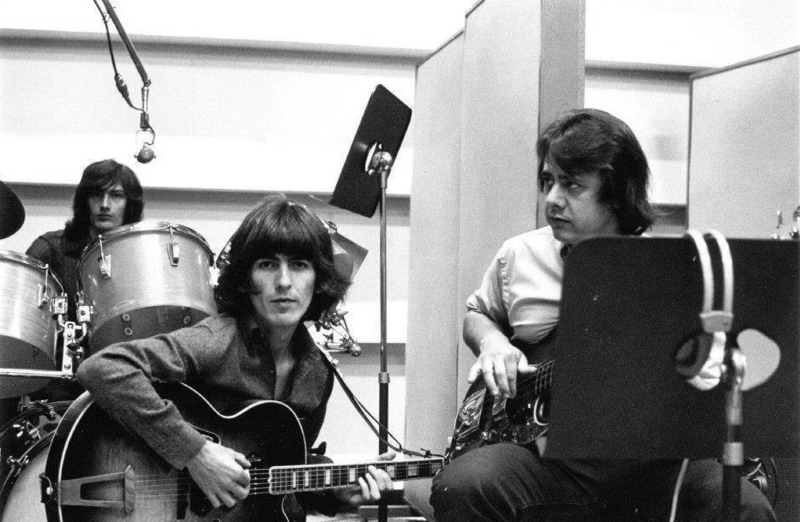 John and George mix up their acoustic guitars. 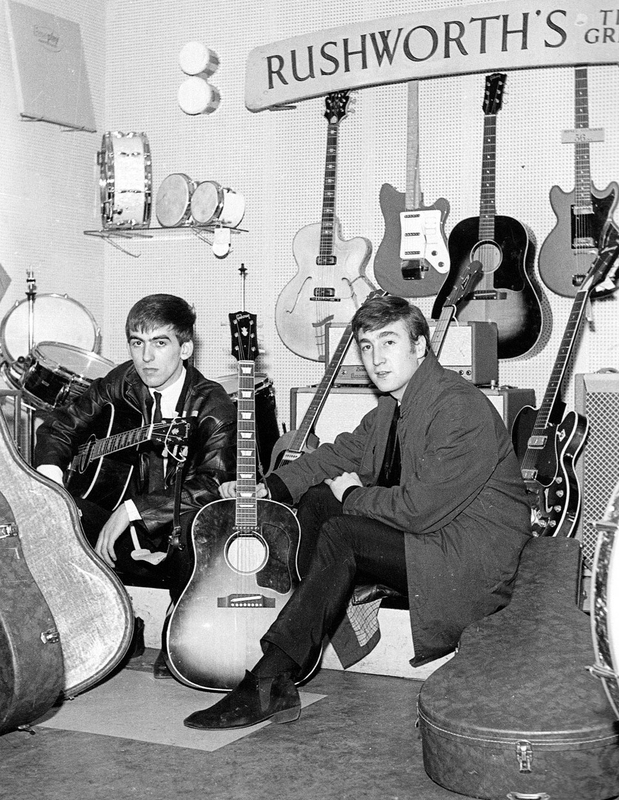 In 1962, the Beatles ordered two Gibson J-160E acoustic-electric guitars from Rushworth’s – one of the few shops in Liverpool where US-made instruments were available at the time. Lennon and Harrison had to order the guitars from a catalogue and wait for them to be delivered to the store from the US. Converted to US currency, the total credit price noted for Lennon’s J-160E (and presumably Harrison’s too) was around $450 then or around $3,200 in today’s money. 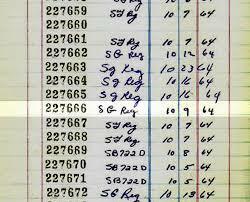 The original Gibson shipping record indicates that the guitars were shipped from the factory on June 27th 1962. The purchase receipt reveals that Brian Epstein, the Beatles’ manager, paid for the guitar in full a year later. 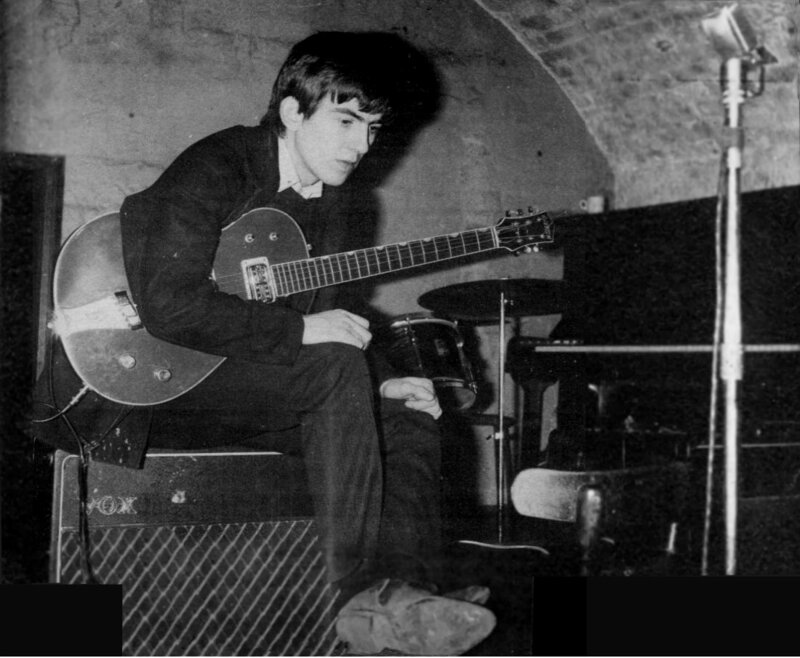 George’s guitar was stolen at the 1963 Finsbury Park Xmas show – John thought it was his that was stolen. He acquired a replacement in 1964. 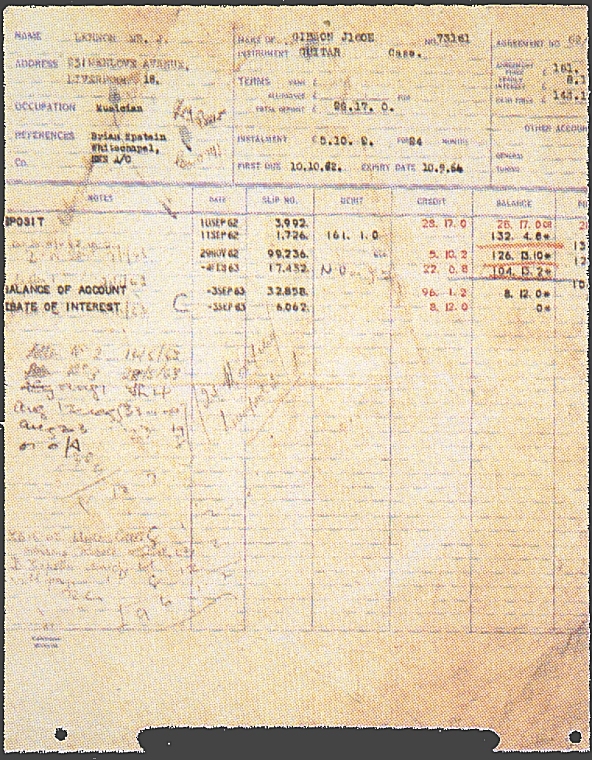 The original Rushworth’s account sheet clearly shows the serial number for this guitar was purchased on John’s account. 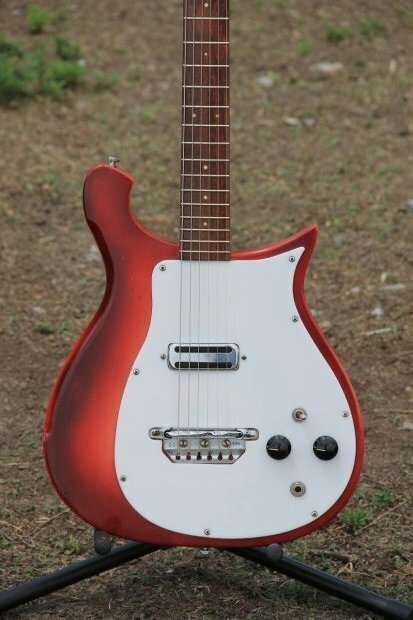 Interesting Note: This is the ONLY Beatle guitar that was played on every Beatles album. Gibson J160 E acoustic was found! 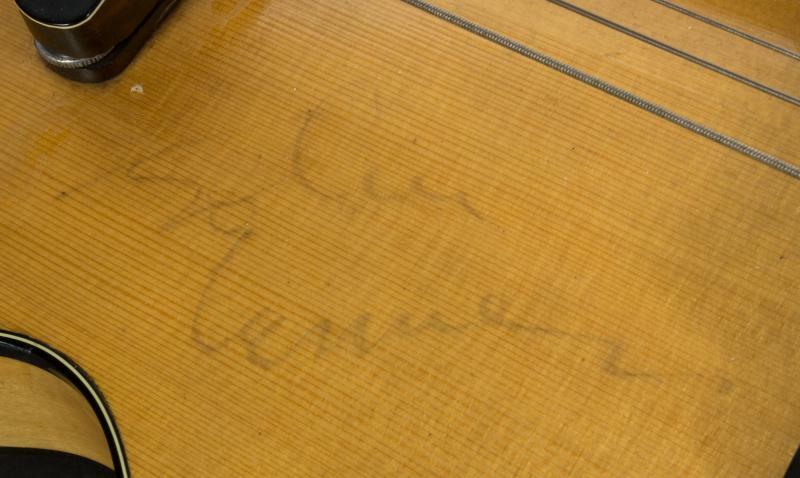 The guitar had been lost for more than 50 years and represents a rare and significant instrument in both Lennon’s, Harrison’s and the Beatles’ history. 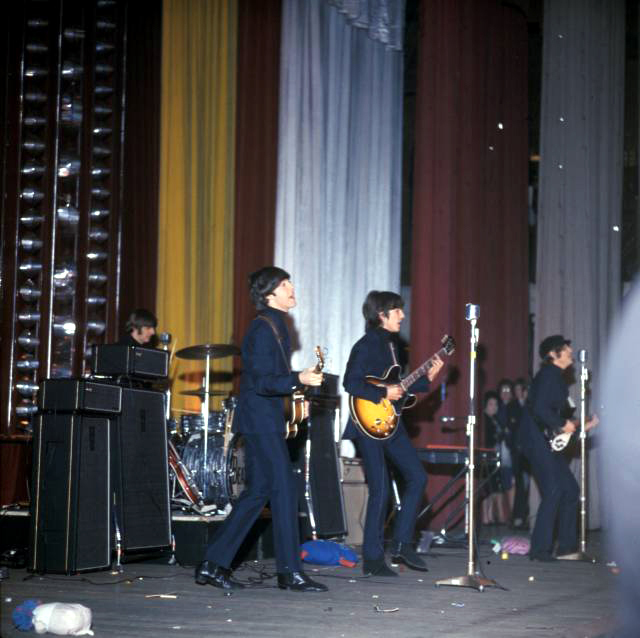 Julien’s Auctions in Beverly Hills will offer it in the Icons & Idols: Rock n’ Roll auction on November 6 and 7, 2015. Lennon and fellow Beatle George Harrison ordered Gibson J-160E acoustic-electrics from Rushworth’s Music House in Liverpool, and received them on September 10, 1962. 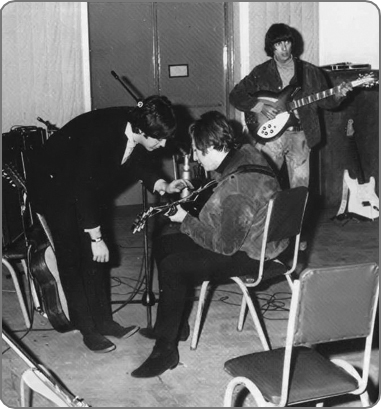 The next day, the Beatles returned to London to record the songs for their debut single, “Love Me Do” and “P.S. I Love You.” It’s presumed that Lennon and Harrison used their J-160Es on these recordings. 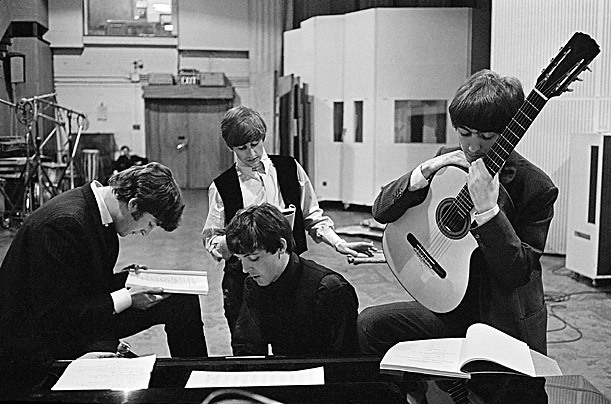 Lennon undoubtedly used the guitar on other Beatles recordings through 1963, including “This Boy” and select tracks on their first two albums,Please Please Me and With the Beatles. 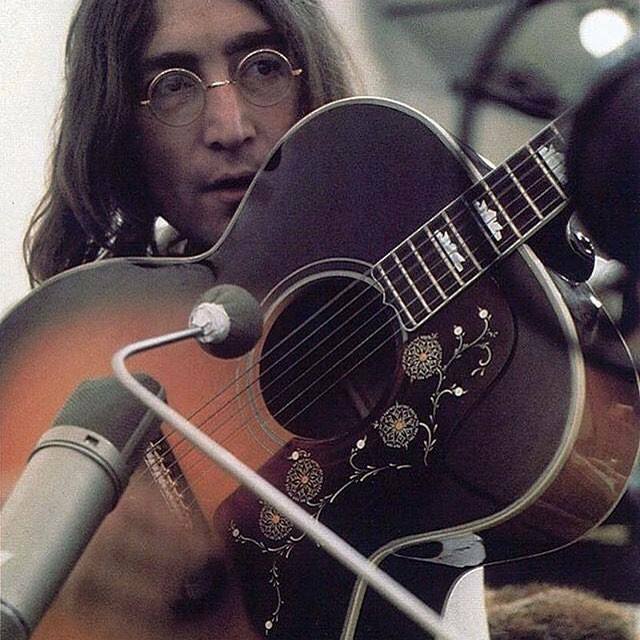 Lennon was fond of the J-160E and used it when songwriting, as well as for recording and performance. 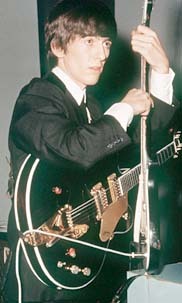 He reportedly used it to write numerous early Beatles hits, including “Please Please Me,” “From Me to You,” “She Loves You,” “I Want to Hold Your Hand” and “This Boy.” Lennon and Harrison also used their J-160Es to mime their performances in the videos for “I Want to Hold Your Hand” and “This Boy,” recorded on November 22, 1963. 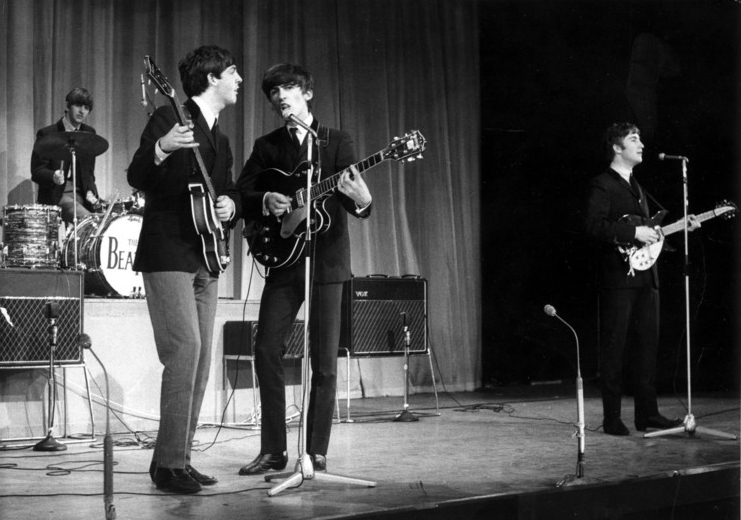 In December 1963, Lennon thought it was his J-160E that was stolen while the Beatles were performing their Christmas show, a variety stage production featuring themselves and other groups, at the Astoria Cinema in Finsbury Park, London. The show ran for 16 nights, from December 24, 1963, to January 11, 1964. 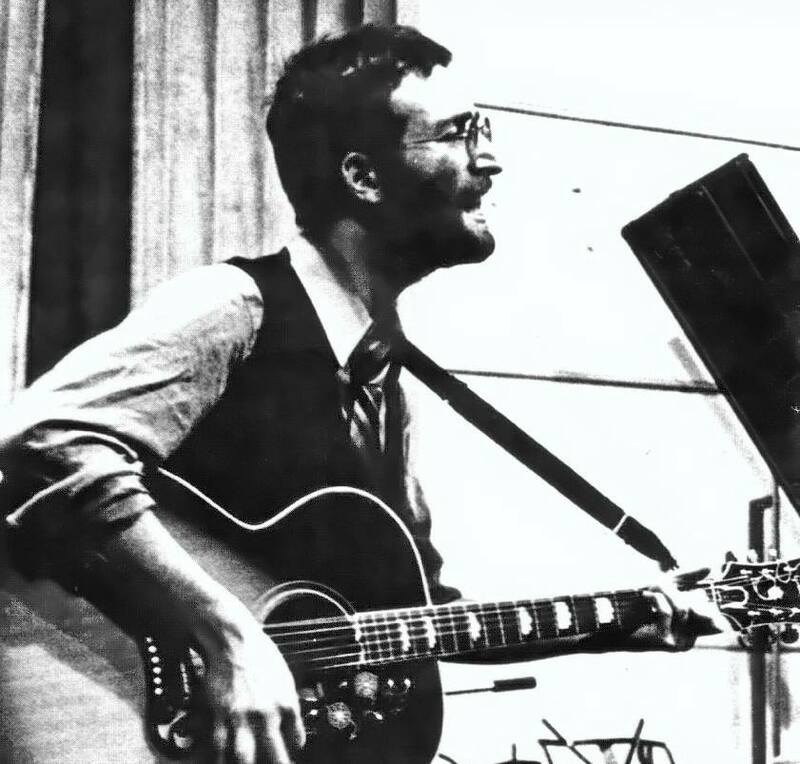 Shortly afterward, Lennon replaced the J-160E with a 1964 model that he continued to use over the years. 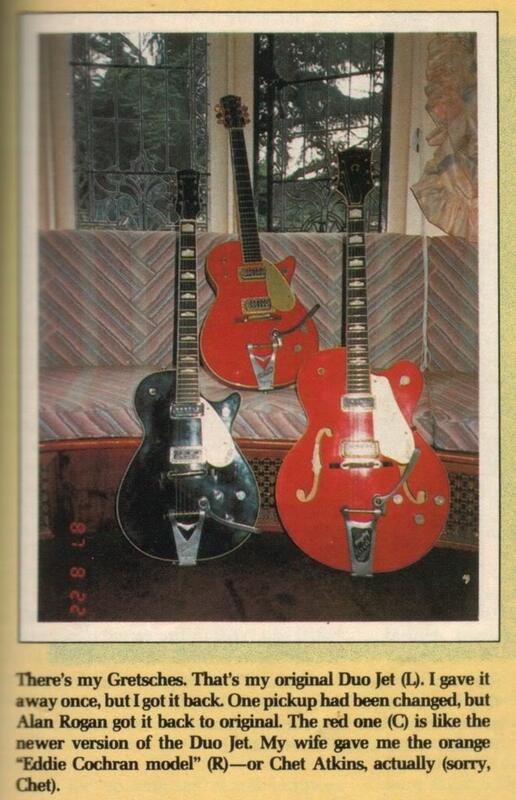 Interestingly, Lennon’s first J-160E got switched with Harrison’s at some point after the guitars were purchased. 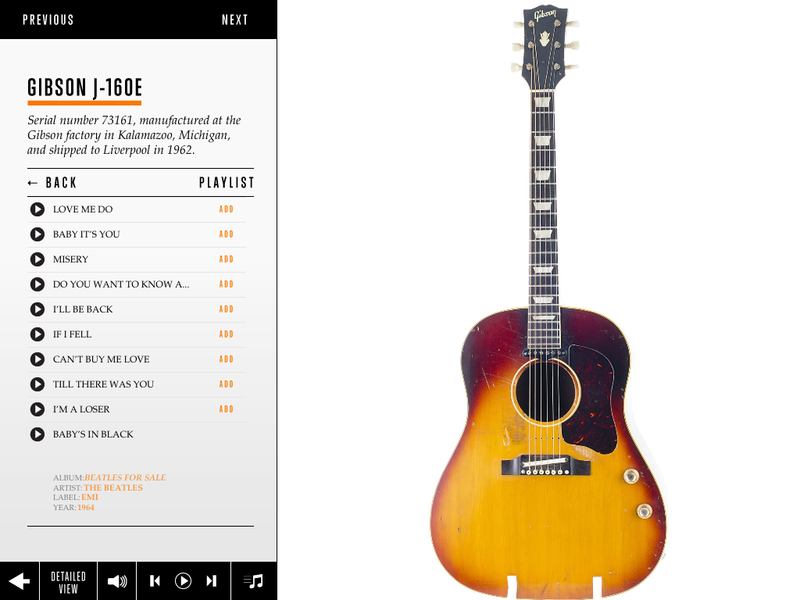 The J-160E in Harrison’s estate has the serial number of the guitar sold to Lennon, meaning that, technically speaking, it was Harrison’s jumbo, not Lennon’s, that was stolen. 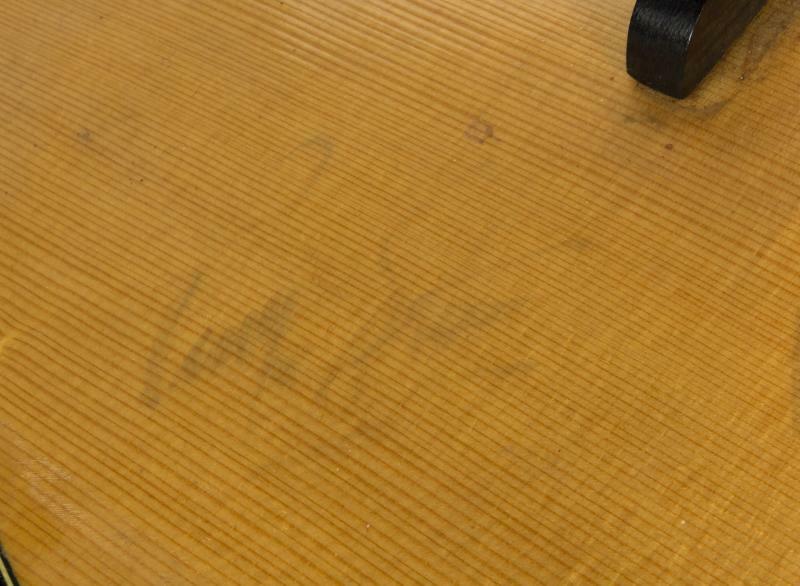 Some 50 years later, the stolen 1962 jumbo turned up in a second-hand shop in the U.S. A buyer named John McCaw purchased it, and the guitar’s authenticity was confirmed by Beatles gear expert Andy Babiuk. 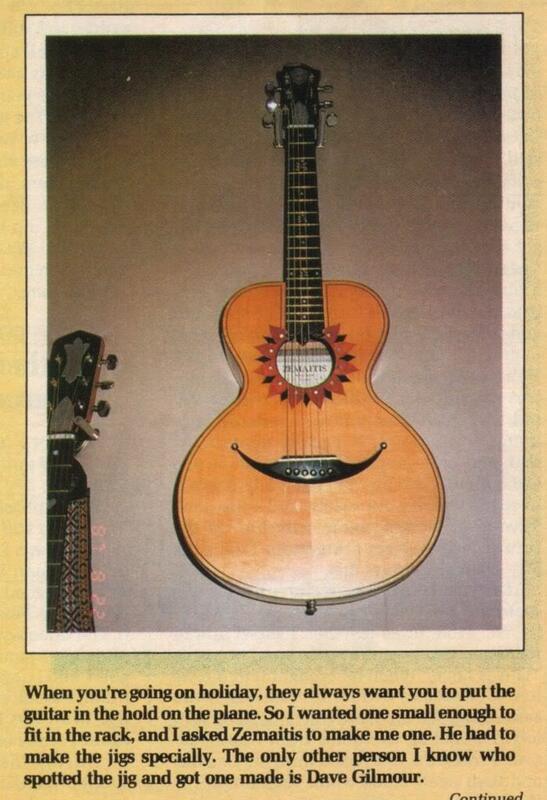 Beatles Gear labels this as a Ramirez Rondalla. As far as i’m concerned, Beatles Gear is the leading authority on “Beatles gear”. I’m leaving both descriptions on this guitar. 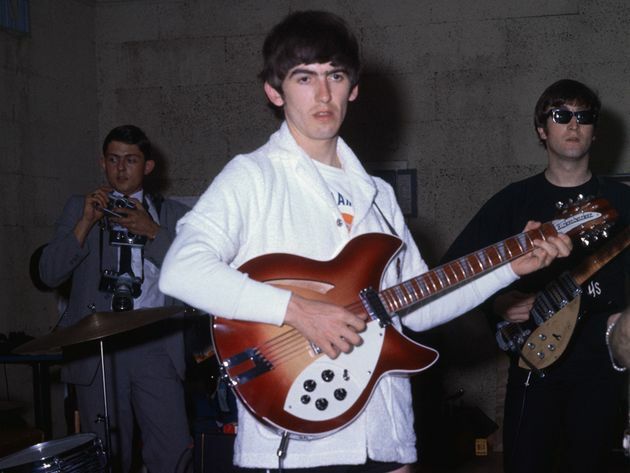 George Harrison´s first 360/12 was the second Rickenbacker twelve string ever made. The prototype had somewhat different features. The most significant difference between the two is the manner in which they are strung. The first twelve string manufactured had a conventional twelve string setup. 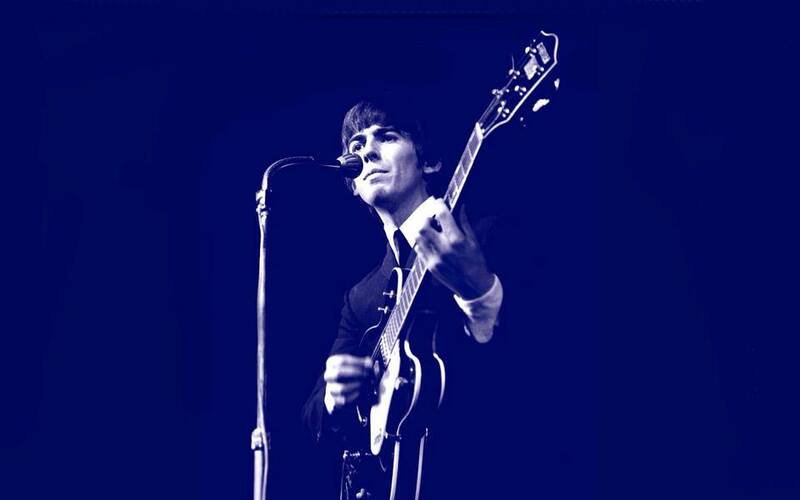 On George´s guitar, the octave counterparts to the four lower strings, were reversed with the octave strings occurring second in the string pairs. It was the first Rickenbacker strung in this manner. 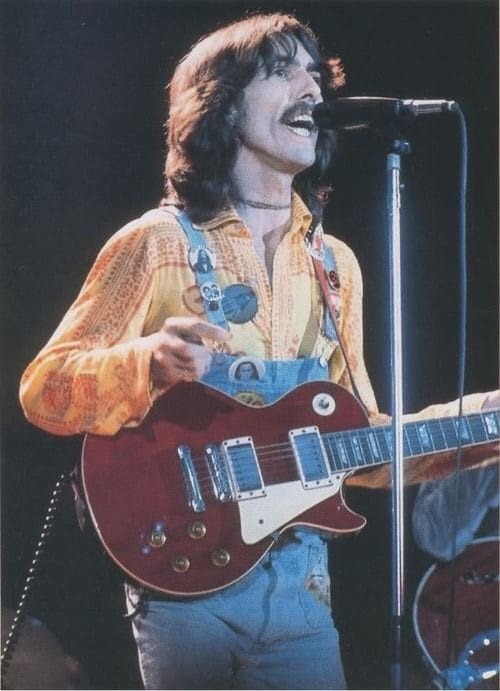 While Harrison’s 12 string was the second one made, nonetheless, it had the distinction of being a prototype for all subsequent instruments as far as the manner in which they would be strung.George Harrison´s guitar had a crescent sound hole, triangle inlays, trapeze tailpiece, double white pick guards and black control knobs. The colour is FireGlo. This model is available in a reissue version, the model 360/12V64. 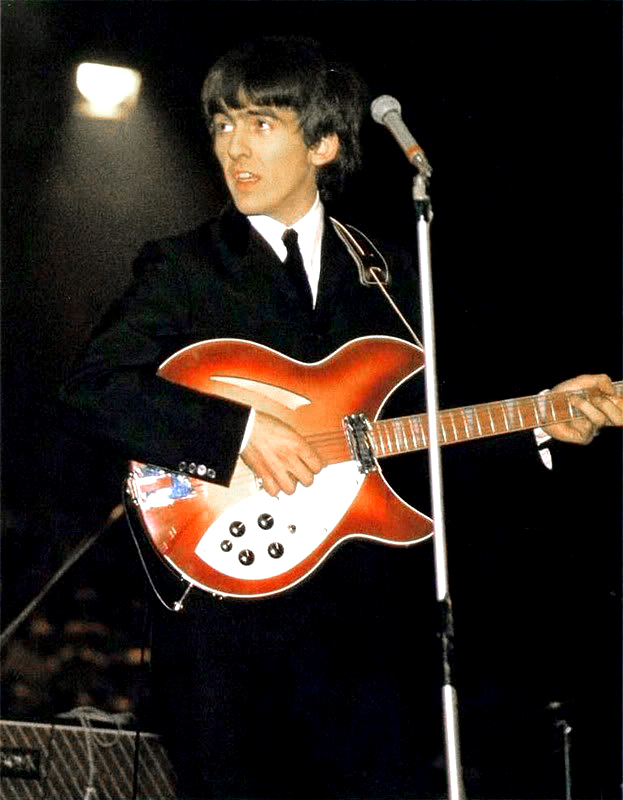 George´s second Rickenbacker twelve string got lost shortly after the Candlestick Park concert on August 29 1966.The exact date of its disappearance and its current whereabouts remains unknown. This new model 360/12 had rounded cutaways and checked binding on the back. Five chrome-top control knobs and an “R” tailpiece. 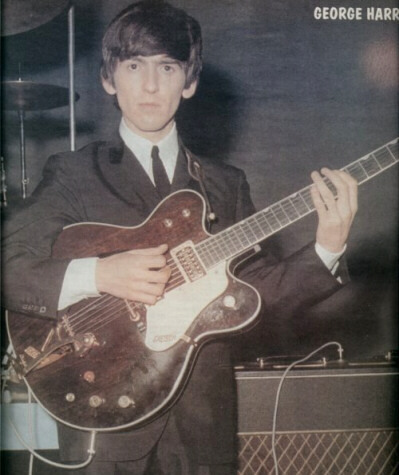 When George received this guitar he “retired” his first from stage performances. 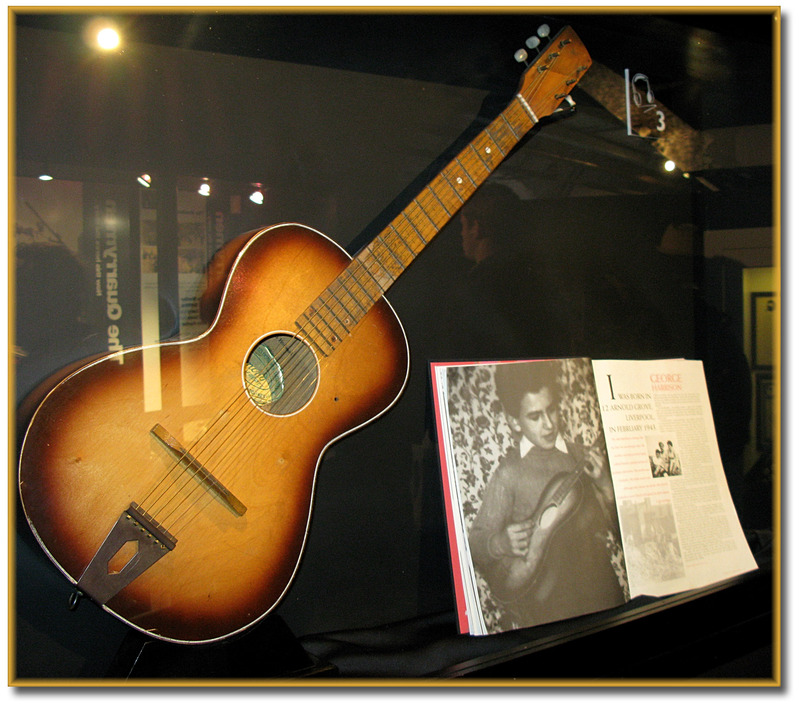 The first recording in which this guitar was used was “If I Needed Someone”, recorded on October 16 1965 (first take). 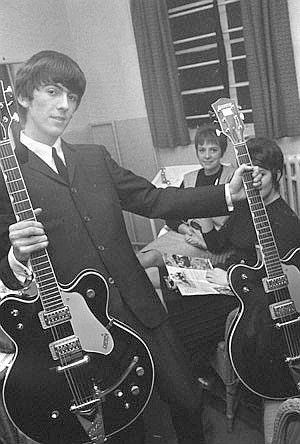 John and George had matching 1962 Epiphone ES230TD Casinos. George’s has a Bigsby Tail Piece, John’s did not. George’s Casino with sunburst sanded off. 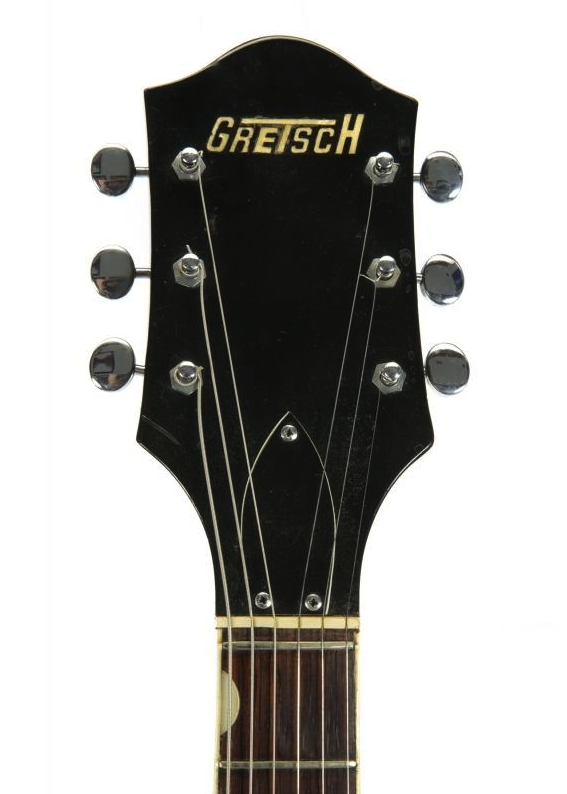 The one-of-a-kind Gretsch “George Harrison Model” 12-string guitar, given to George by Gretsch in 1964. 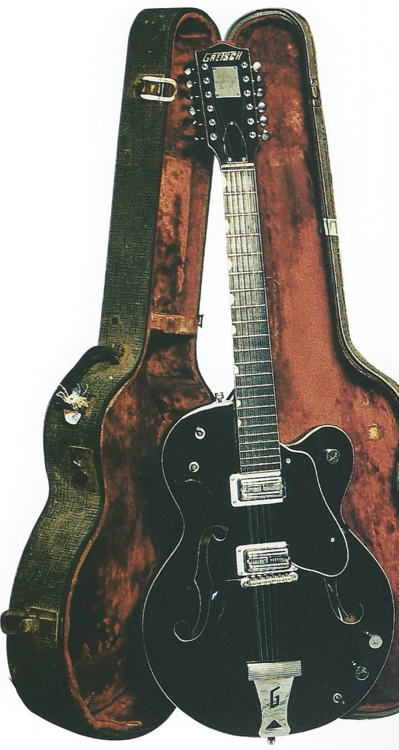 Gretsch made him a 12-string version of his 6128 – but he didn’t like it. The neck was too wide and the action was bad. It was on one of the dates of that British tour that it was delivered, possibly in London. But that guitar was a dog to play. 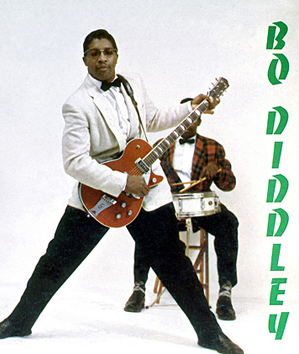 It wasn’t like his Rickenbacker 360/12, which was almost as easy to play as a six-string. 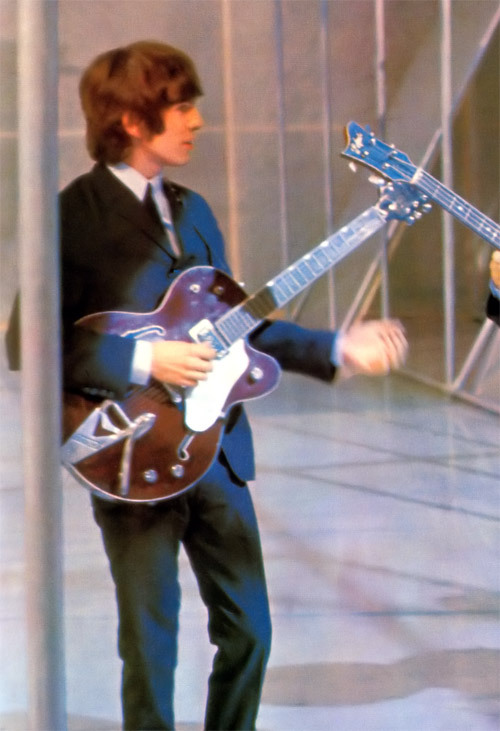 George gave the Gretsch 12-string to John St John, the lead guitarist in Sounds Incorporated, who were also on that tour, backing Mary Wells.” – Colin Manley, quoted in Beatles Gear. On Tuesday November 23rd at Twickenham film studios the group filmed their promos for ‘We Can Work It Out’, ‘Day Tripper’, ‘Help!’, ‘Ticket To Ride’ and ‘I Feel Fine’. 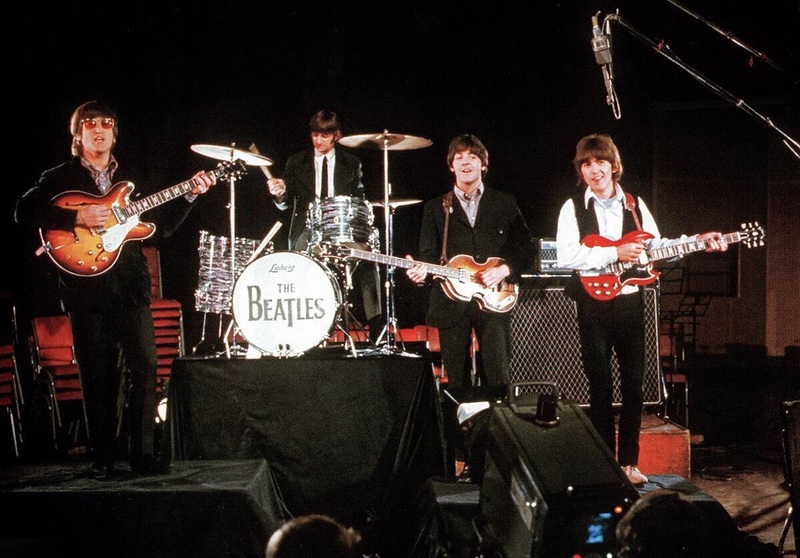 Three members used their familiar instruments: McCartney the Hofner bass, Lennon his Rickenbacker 325, and Starr the 22-inch-bass Ludwig kit with new number-six logo drum-head. But a new guitar was evident. 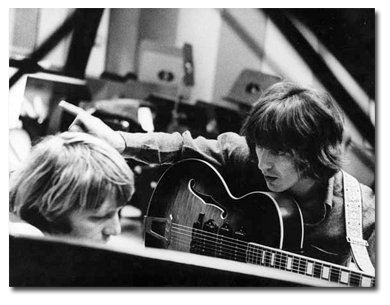 Harrison had a sunburst Gibson ES-345. Gibson’s ES-345TD double-cutaway hollow body guitar was in effect an upscale version of Joe Brown’s 335 that Harrison had tried out back in 1962. The 345 had a six-position Varitone rotary switch for choosing different tonal settings, and all the metal fittings were gold-plated. 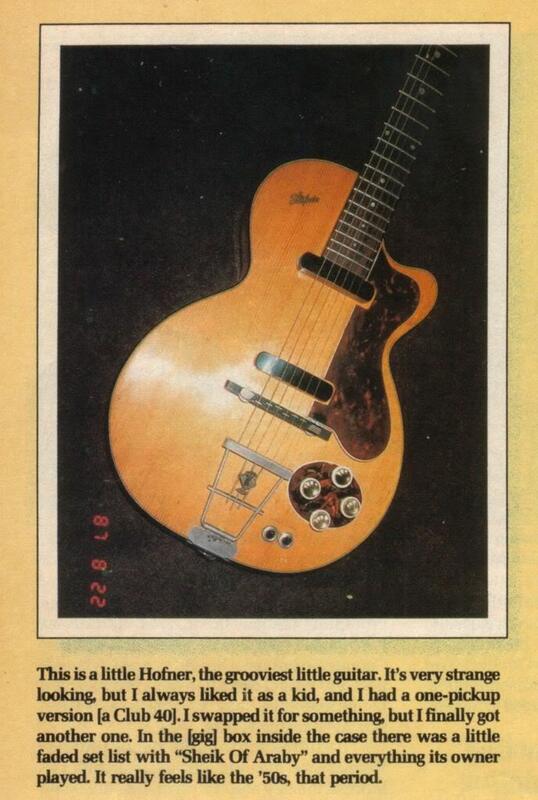 A sunburst 345 then cost £236/5/- (about $660 then). 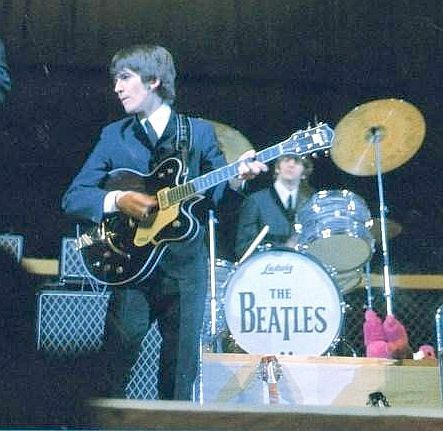 Harrison used his new Gibson only for the filming of these promo clips, and later again this year during the last UK Beatles tour. 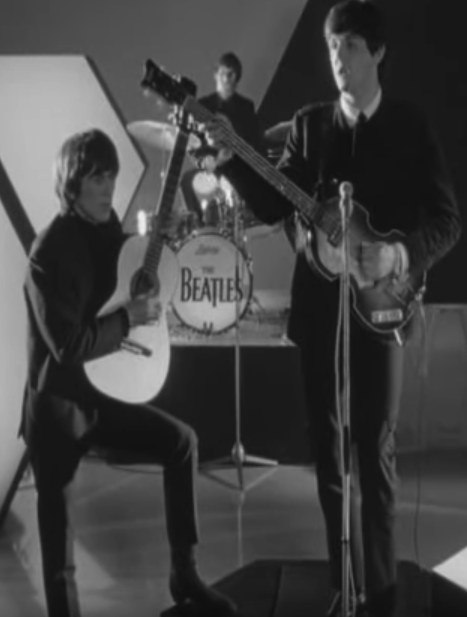 George plays this guitar in the Day Tripper video. 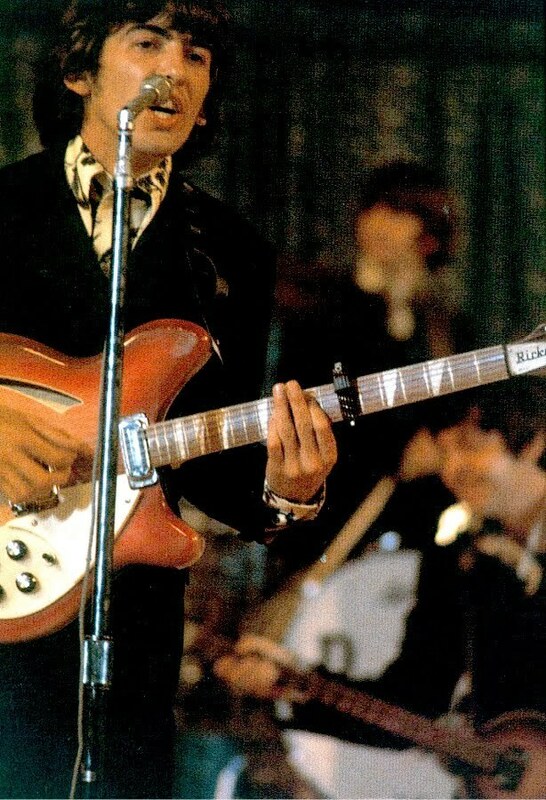 In 1966, George Harrison acquired a Gibson SG Standard 1964-model, which he can be seen playing in the photograph above. He used it as his main guitar during the Revolver sessions and it remained one of his favourite guitars through into 1968. George gave this guitar to Pete Ham of BadFinger. 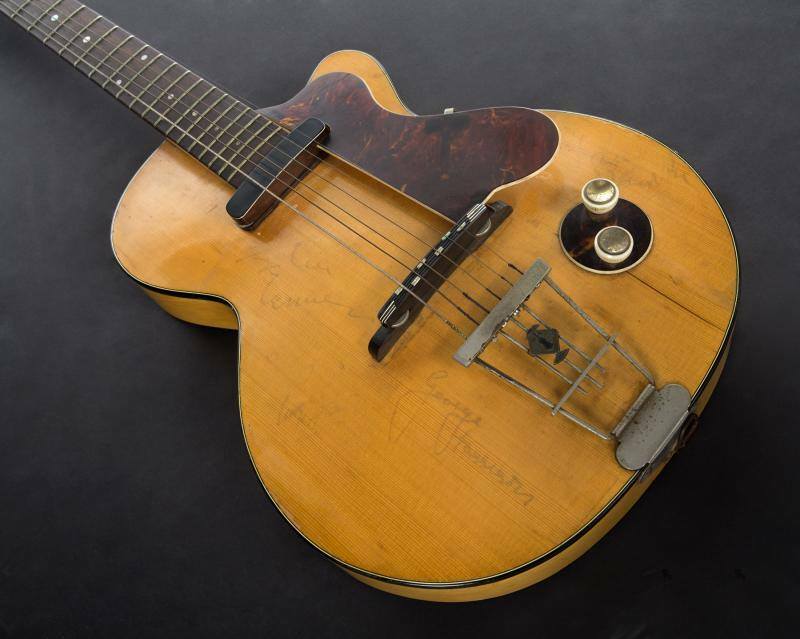 NEW YORK – A guitar played by George Harrison of the Beatles was sold for $567,500 Friday, topping the bill at what auction house Christie’s said was its biggest ever sale of show business memorabilia. The Gibson SG electric guitar, played by Harrison from 1966-1969, was the star attraction among over 400 lots, ranging from guitars and clothing to scraps of paper signed by stars. 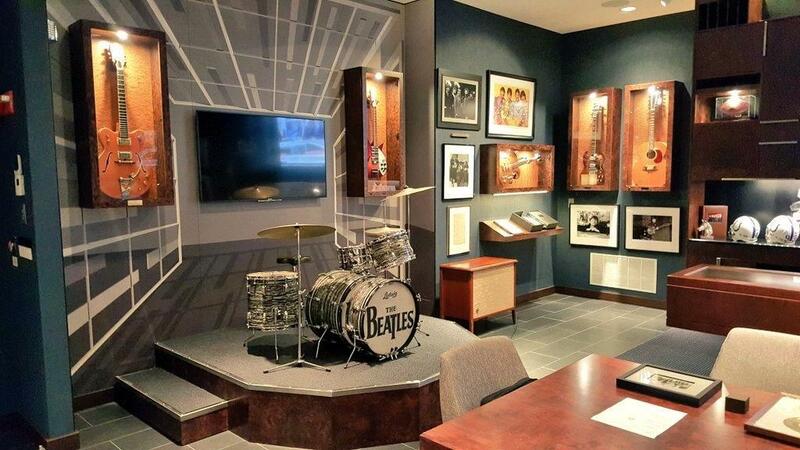 The guitar, which had a pre-sale estimate of $500,000, was used while recording the Beatles’ “Revolver” album. John Lennon also played it on what is commonly known as “The White Album”. Harrison gave the guitar to Pete Ham of Badfinger and after Ham’s death in 1974, it was stored away for 28 years by his brother John Ham. The guitar was found during preparations for a Badfinger retrospective at the Hall of Fame in 2002. 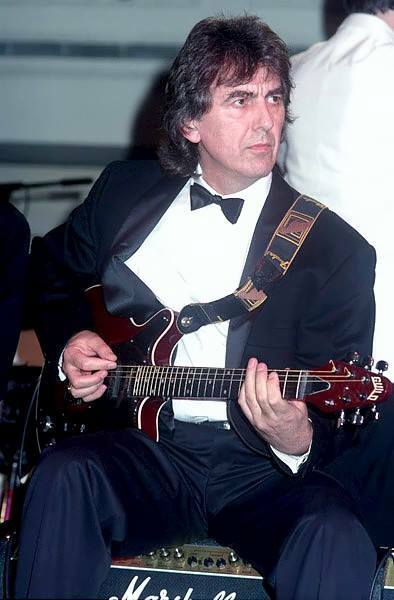 George Harrison’s SG was purchased for $567,000 at a Christie’s auction in 2004 by Colts owner Jim Irsay. Irsay also owns the Vox Kensington prototype guitar made for the Beatles in 1966 and John Lennon’s 1963 Gretsch 6120 Guitar. 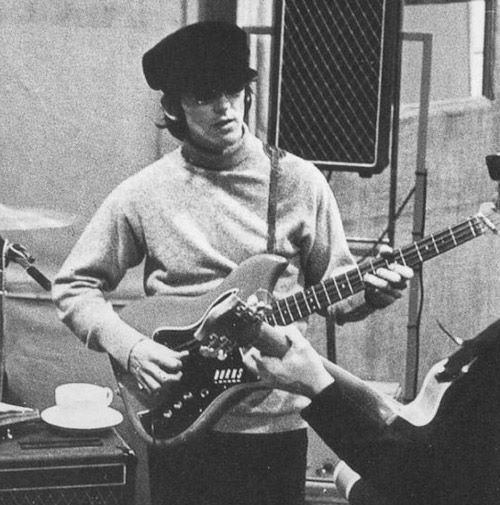 George Harrison briefly played a Burns Nu-Sonic Bass in mid-1966 during the recording of ‘Revolver’. 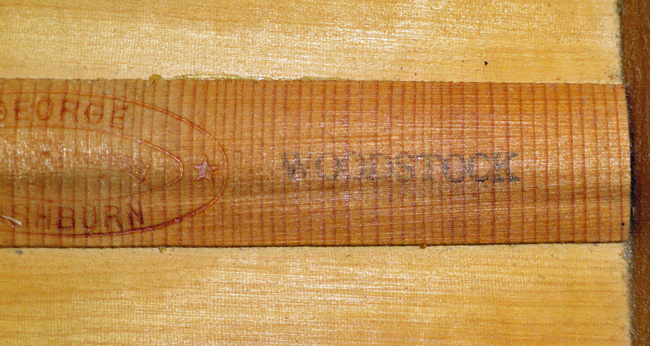 The faded “Grimwoods: The Music People; Maidstone and Whitstable” sticker on the headstock. 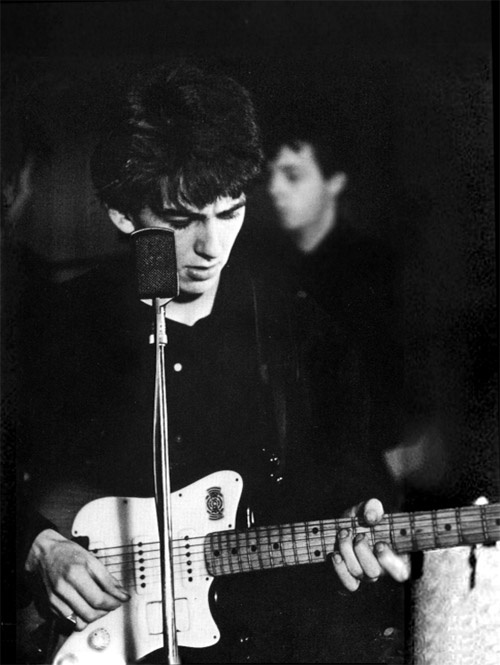 George’s 1961 pre-CBS Stratocaster – Tremolo model with Rosewood fingerboard. 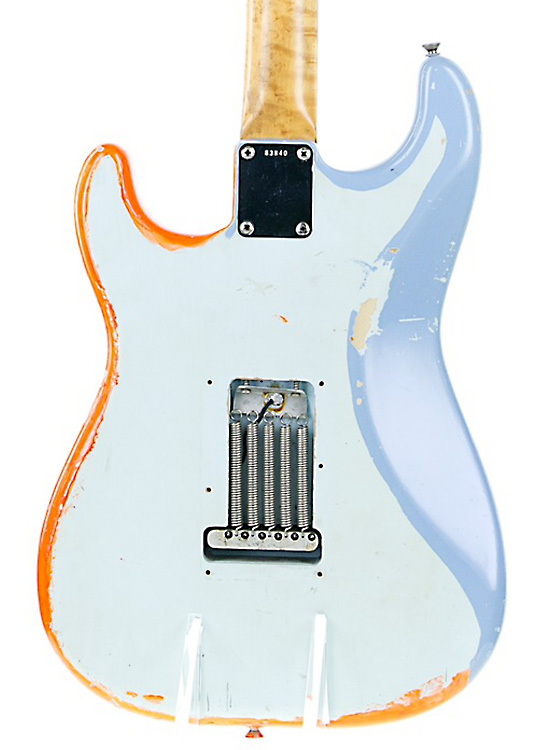 In 2011 someone that saw George’s Strat in his exhibit at the Grammy Museum in Los Angeles, determined that his Strat is actually Daphne Blue. Played on “You’re gonna loose that girl” and Nowhere Man some other Rubber Soul’ sessions. George painted it psychedelic and called it ‘Rocky’ for ‘All you Need is Love’, ‘Magical Mystery Tour’ and ‘I am A Walrus’. 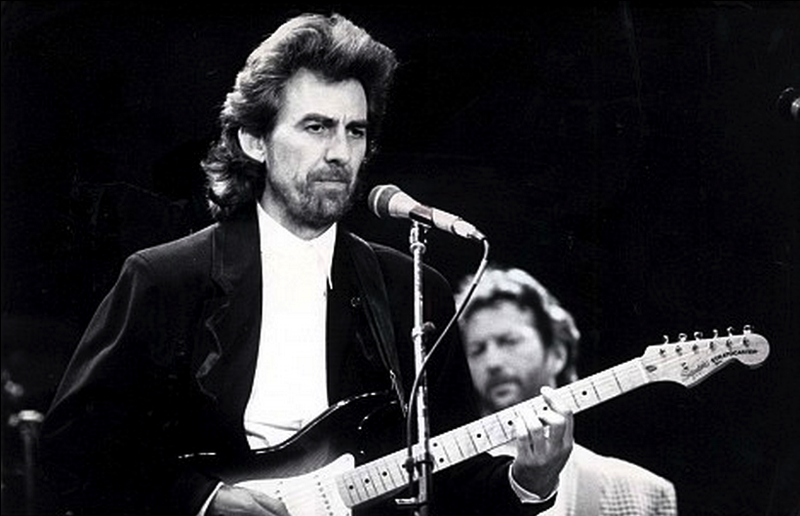 John and George’s Strats…together in the same picture. Clapton playing Rocky on Stage. 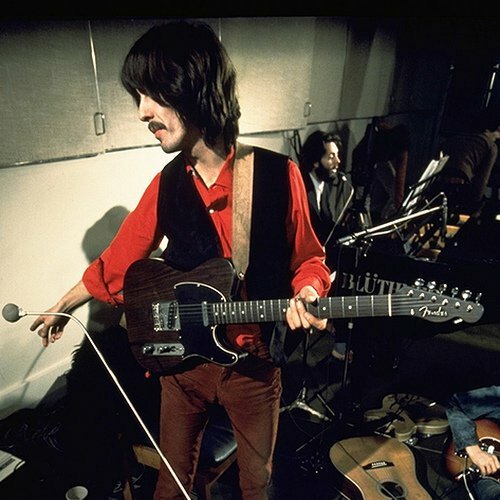 George’s 1969 Rosewood Telecaster (rosewood pancake with maple middle) which given to him by Fender (one of only two made at that time) George played on ‘Let it Be’ sessions and ‘the rooftop’ concert. 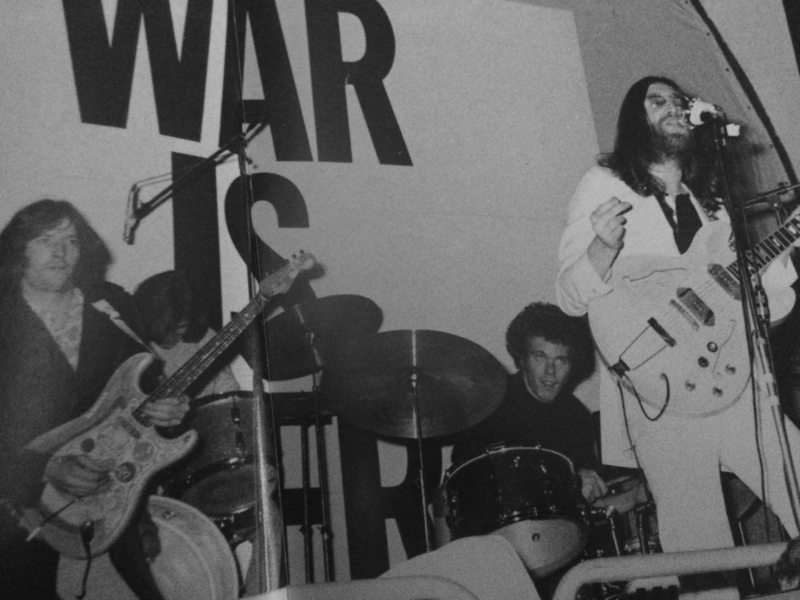 George playing “Rocky” with Delaney and Bonnie and Eric Clapton in Copenhagen 1969. 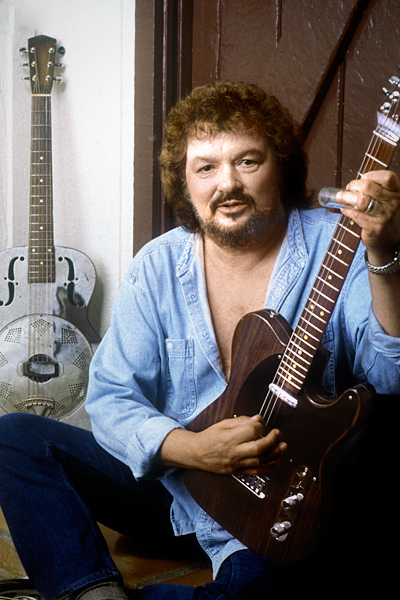 Delaney Bramlett is playing the 1969 Rosewood Telecaster that George gave him. 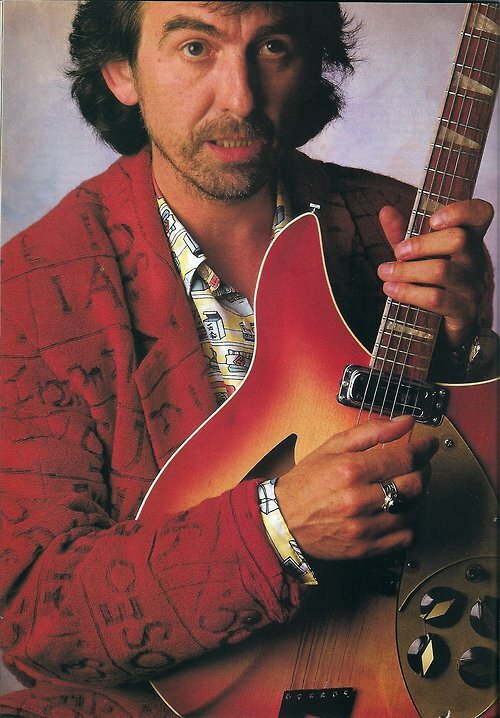 Some time in 1999, Bramlett put the guitar up for sale in the States through Dave Kyle , an expert dealer in famous and vintage guitars (including the fabulous leather-inlaid Waylon Jennings Telecaster®). 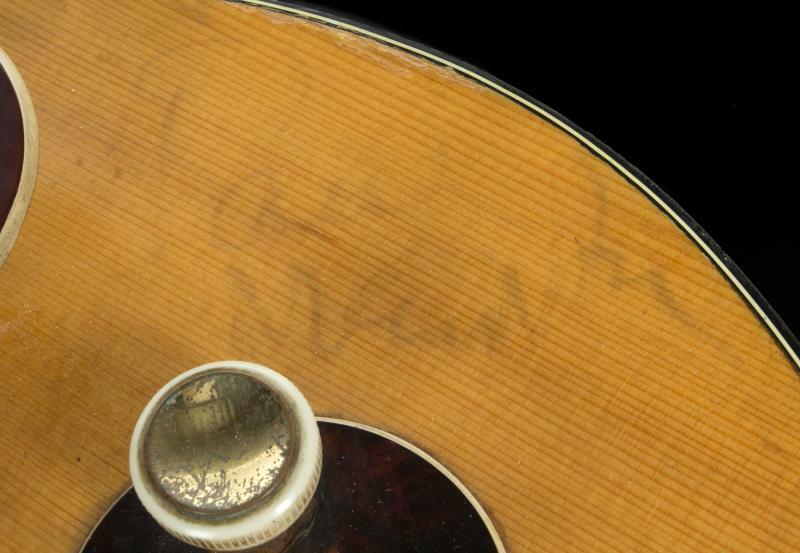 Bramlett later withdrew the Rosewood Tele®, putting it up for auction instead. The date for the auction was set for August 19th, 1999 at Bonham’s auction house in London. Although it was expected to raise £200,000 (320,000 Euros), the Telecaster® failed to reach its reserve price and was taken off the block when bids topped out at £100,000 (160000 Euros). According to guitar dealer Dave Kyle, who has had the privilege of playing and examining the guitar, “The Harrison/Bramlett Tele® was also pretty well worked over. It had been routed for Humbucking pickups, which were gone by the time I saw it and had what looked to be the original pickups back in place. 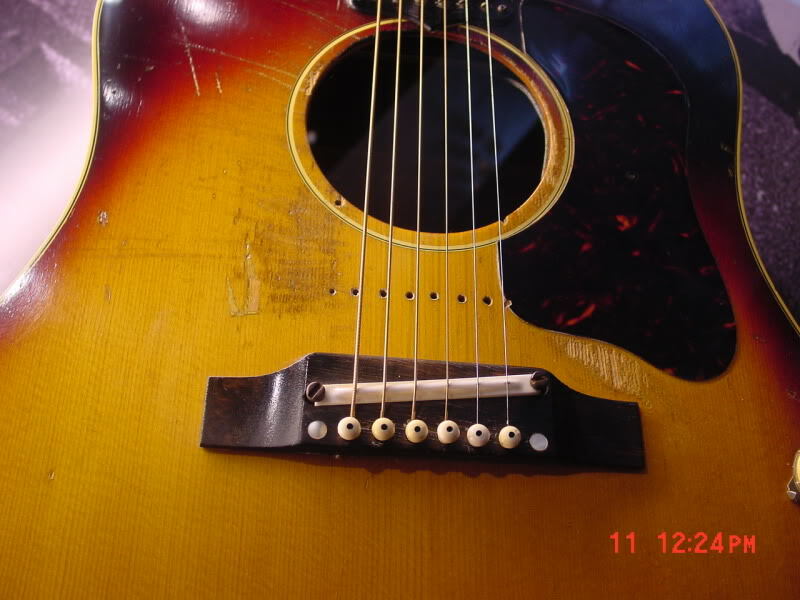 The back of the neck had been sanded off but the fretboard still had the original finish”. 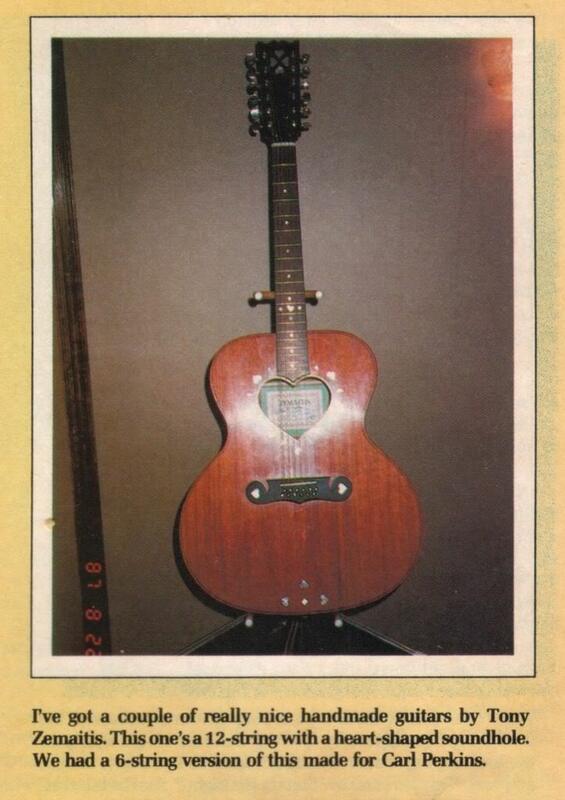 On Saturday, September 13, 2003, the guitar was put up for sale by Bramlett at Odyssey Auctions in Hollywood. The winning bidder paid $434,750. Although the identity of the West Coast collector was not revealed, rumours persist that the bidder was none other than U.S T.V actor Ed Begley, Jr. who was apparently bidding on behalf of George Harrison’s widow Olivia Harrison, who now owns the guitar. 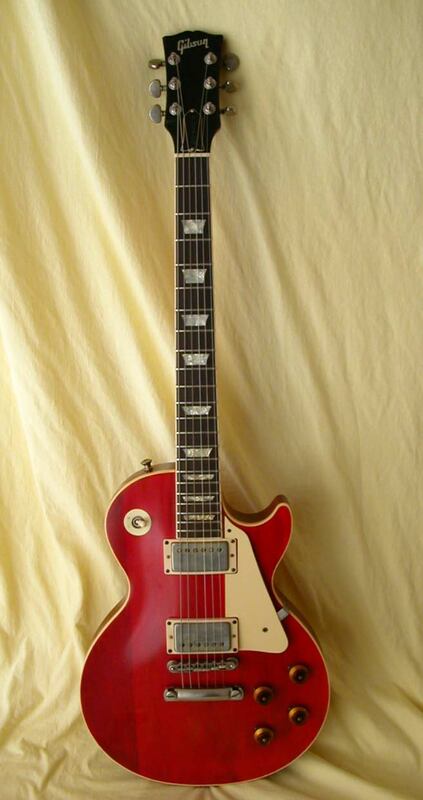 Lucy was originally a “Goldtop” Les Paul Model with humbucking pickups, a combination only produced in 1957 and part of 1958.Gibson records show that serial number 7-8789 was shipped from the Kalamazoo factory on December 19, 1957. By 1965 the guitar was owned by John Sebastian of the Lovin’ Spoonful, who traded it to Rick Derringer of tour mates The McCoy’s for an amplifier to replace one which had blown. By around 1966 the guitar’s original gold finish was looking very worn, and Derringer’s father continually ragged him about it. “So I figured that since we didn’t live far from Gibson’s factory in Kalamazoo, the next time the group went there I’d give it to Gibson and have it refinished. 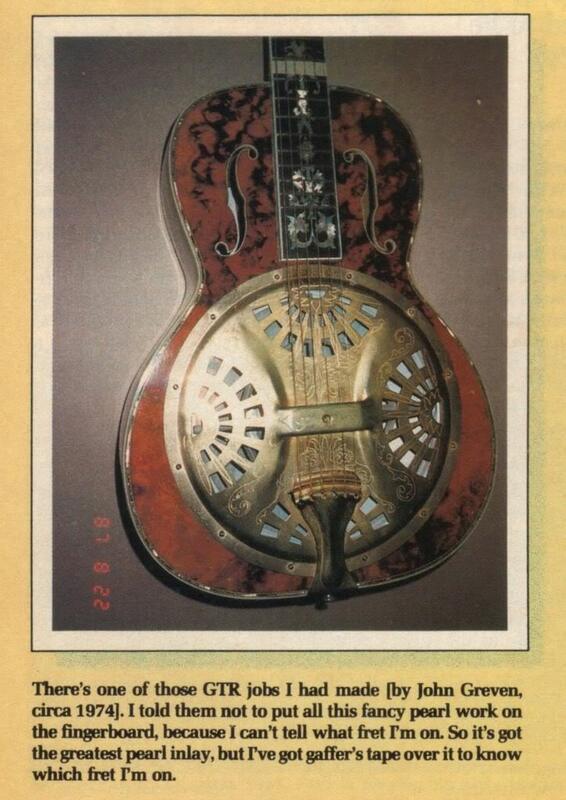 I had it done at the factory in the SG-style clear red finish that was popular at the time.” However, he wasn’t happy with the instrument when he got it back: it “just didn’t feel the same … it had changed into an altogether different guitar.” Derringer therefore sold it to Dan Armstrong’s guitar shop in New York. The guitar had only been in Armstrong’s shop for a few days when it was purchased by Eric Clapton.Clapton did not play this instrument much. His principal guitars in 1966-68 being his psychedelic 1964 SG, a 1964 ES-335, 1963 or 64 Gibson Reverse Firebird (which replaced his SG as his favourite Cream guitar) and a sunburst Les Paul he bought from Andy Summers. In August 1968 he gave it as a present to his good friend George Harrison. Harrison dubbed the red guitar “Lucy,” after redhead comedienne Lucille Ball. 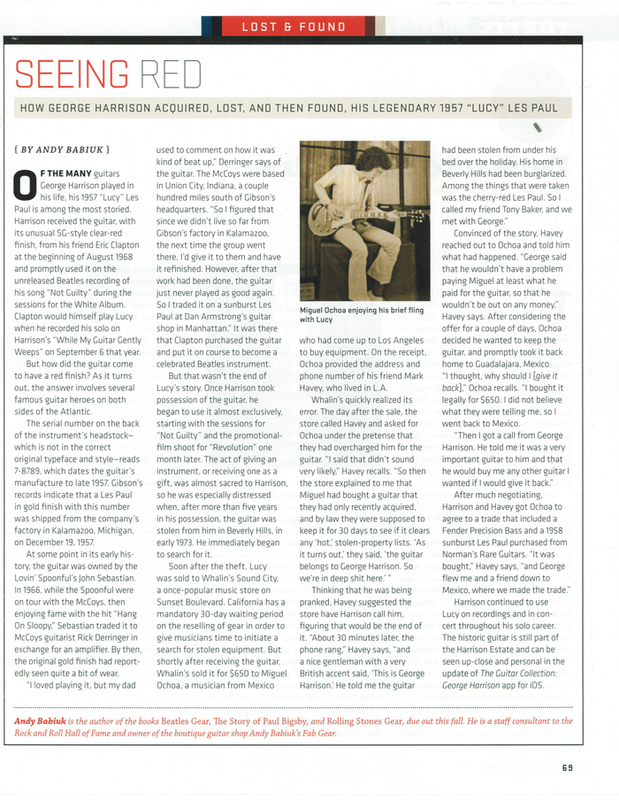 Harrison and The Beatles were at the time recording what would become The Beatles (the White Album), and had been working for several weeks on “While My Guitar Gently Weeps.” Harrison had been unable to record a lead track for the song he was satisfied with; moreover Lennon and McCartney were dismissive of it and “didn’t try very hard.” Therefore Harrison, knowing that his bandmates were on good behaviour around guests, invited Clapton to come into EMI Studios on September 6 and lay down a lead track, telling him “you don’t need to bring a guitar, you know I’ve got a good Les Paul you can use.” Clapton laid down the track in a single take; but later stated that he was so high at the time he doesn’t remember it at all. 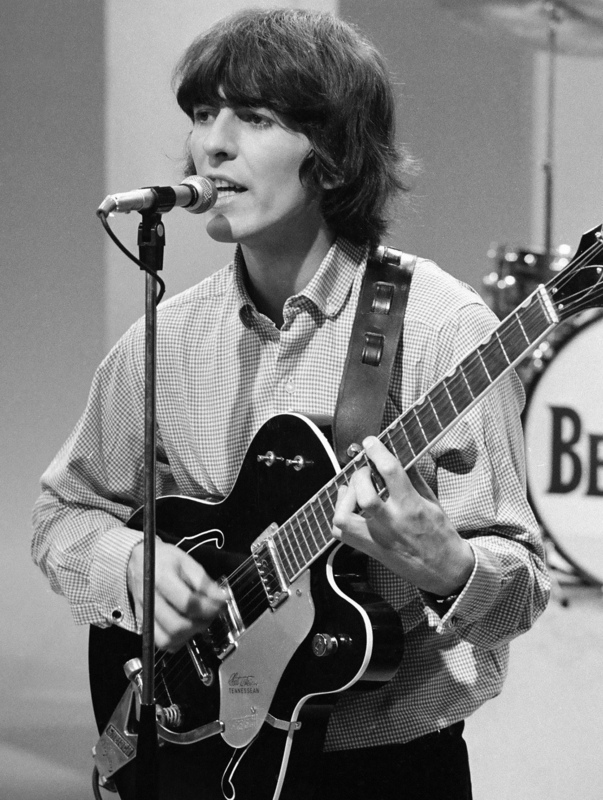 Harrison continued to play Lucy as one of his principal guitars for the remainder of his time with The Beatles; it can be seen in the promotional video for “Revolution” and the documentary Let It Be. In 1973 Lucy was one of the items stolen in a burglary at Harrison’s home in Beverly Hills. The thief or an intermediary sold it at Whalin’s Sound Cityon Sunset Boulevard in Hollywood; owner George Whalin promptly resold it (in violation of the statutory 30-day waiting period) to Miguel Ochoa, a musician from Guadalajara, Mexico. When the red guitar appeared on a police stolen-property bulletin Whalin called Ochoa’s contact number, his friend Mark Havey. 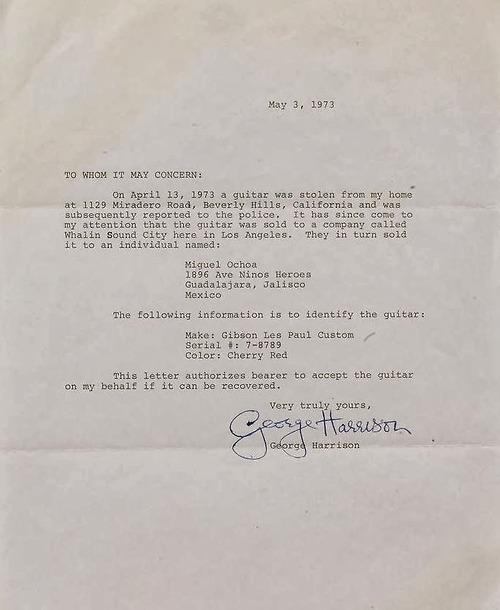 This began a lengthy negotiation which resulted, ultimately, in Harrison (via Harvey) trading Ochoa a Les Paul sunburst and a Fender Precision Bass for the return of Lucy. Harrison would later refer to the incident as a “kidnapping.” Harrison kept Lucy until his death in 2001. 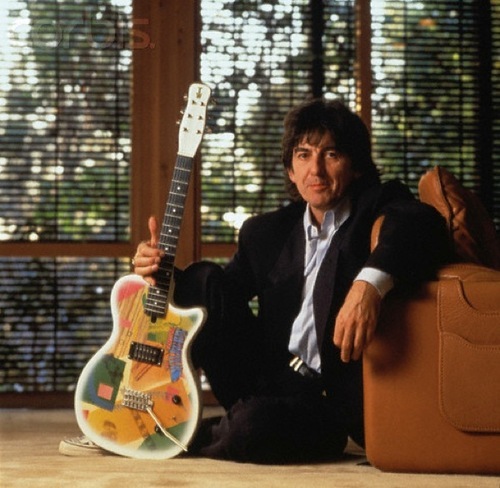 The guitar is still owned by the Harrison Estate today. 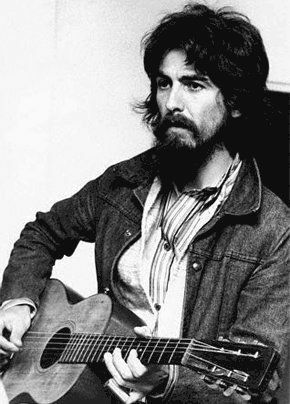 Harrison upgraded to a Vintage Sunburst Gibson J-200 Jumbo (which Lennon used on “Two of Us” and other acoustic tracks on Let It Be). 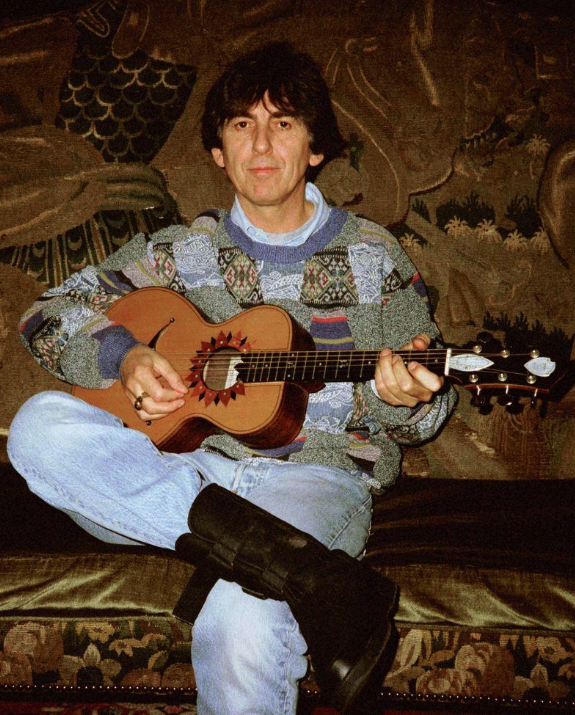 The Beatles’ George Harrison himself was keen a fan of the J-200 – he “upgraded” from the Epiphone acoustics he previously favoured to record The Beatles, a.k.a. 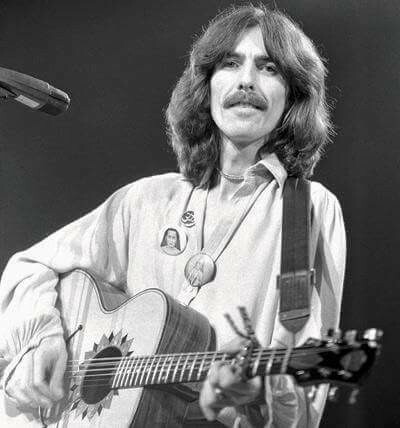 “The White Album.” “For You Blue,” “Here Comes the Sun,” “While My Guitar Gently Weeps”, “Long, Long, Long” and “Piggies” all feature Harrison playing one of his Gibson J-200s. 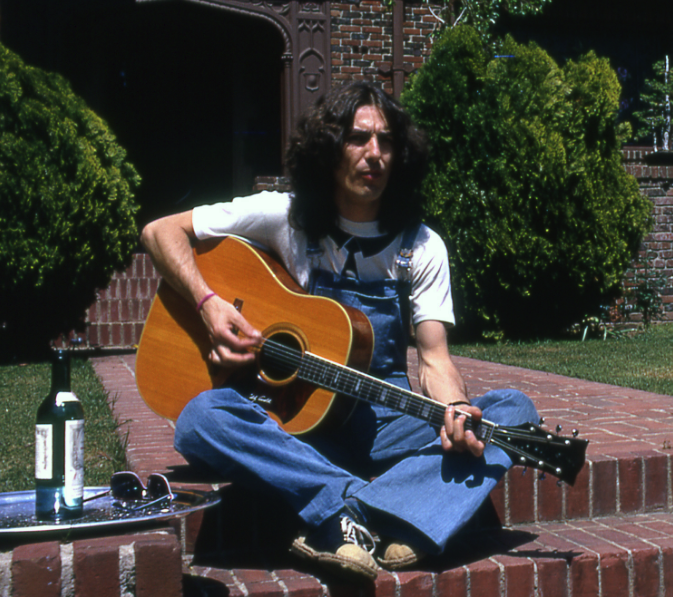 Harrison also composed most songs for his solo debut, All Things Must Pass, on a blonde Gibson J-200. 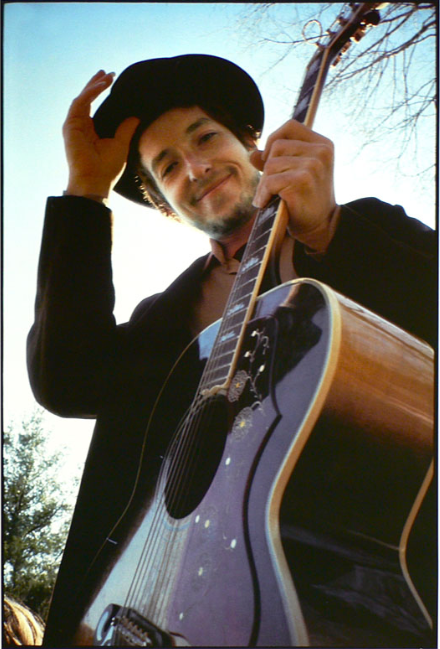 Is this the same guitar pictured on Nashville Skyline? There is so much discussion online about whether this is actually the same guitar pictured on the Nashville Skyline cover. 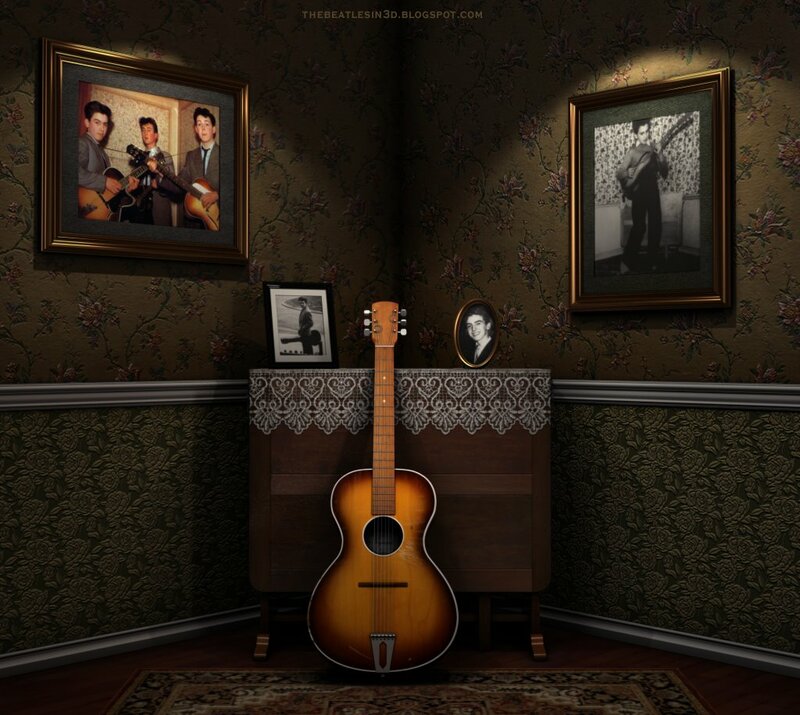 The guitars in the pictures are identical right down to the way the strings are wrapped, so maybe it is the same guitar. I don’t know for sure. 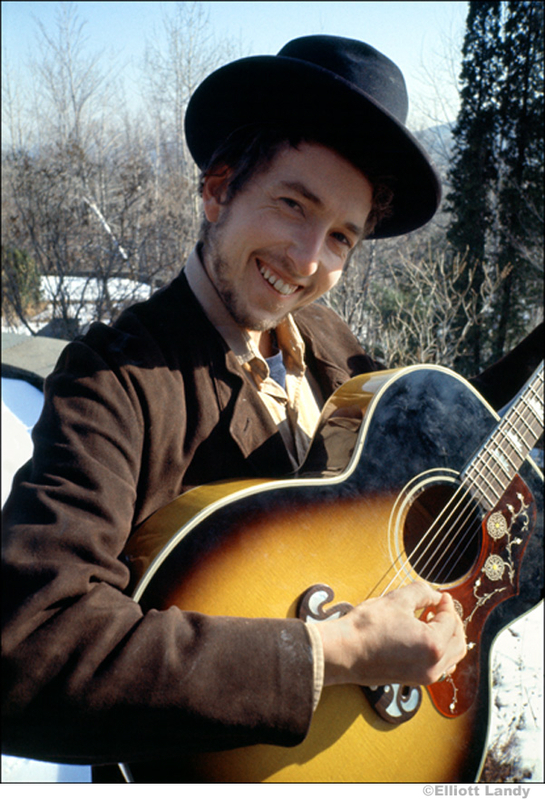 Bob Dylan, at his Byrdcliffe home, Nashville Skyline photo sessions, Woodstock, NY, 1969. 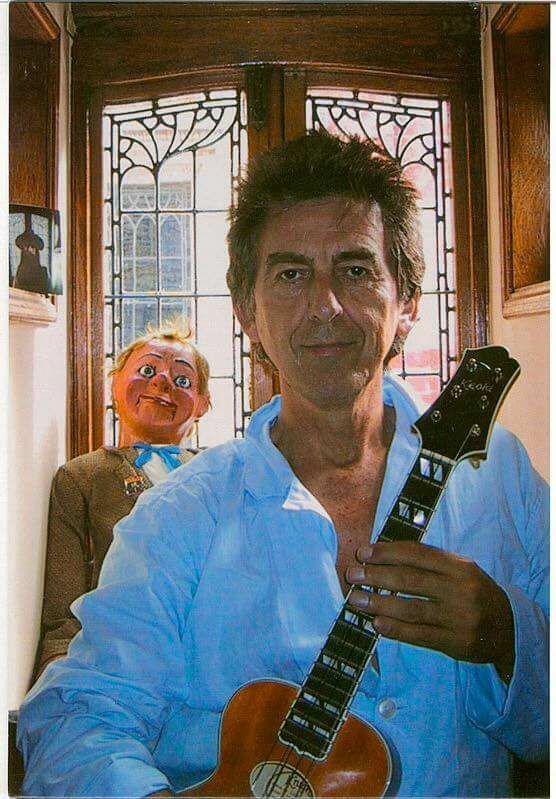 In the picture with Paul Simon, George is playing a Martin D-35S. The “S” designation is for “slotted headstock”, a feature on their 12-fret models. – Courtesy of ChrisDB. Thanks Chris. 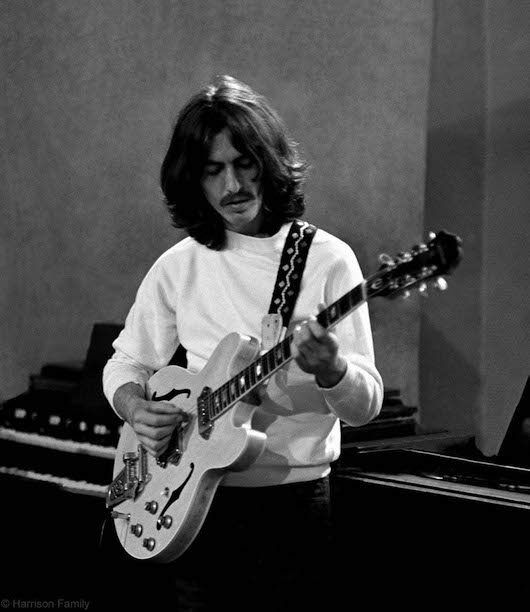 George playing a 3 pickup Gibson ES-5 at the Jackie Lomax sessions in 1968. 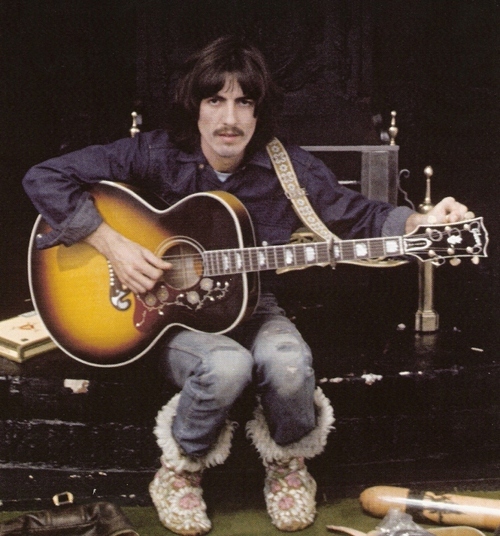 George Harrison produced the sessions for fellow Liverpudlian musician Jackie Lomax, recording Harrison’s song Sour Milk Sea. The song was recorded at Abbey Road over three days, on 24-26 June 1968, as well as a Lomax song, The Eagle Laughs At You. 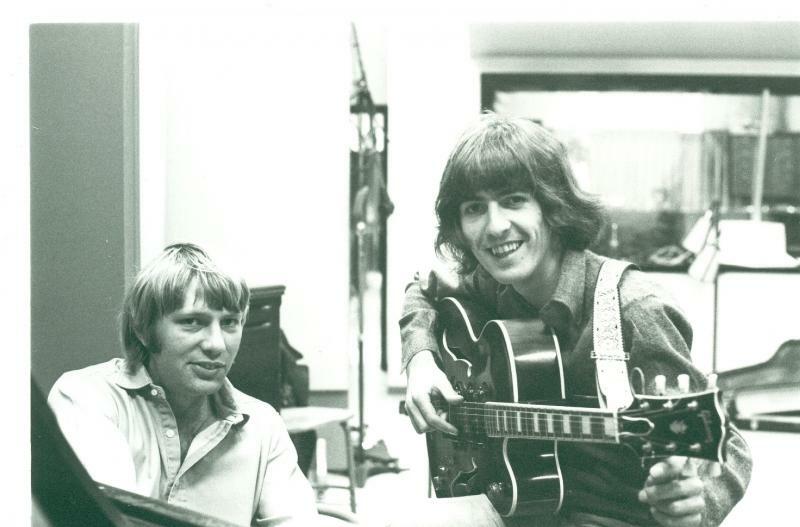 Harrison produced the songs and played acoustic guitar, with McCartney on bass, Starr on drums, Eric Clapton on guitar and Nicky Hopkins on piano. The Eagle Laughs At You featured Harrison and Clapton playing rhythm and lead guitar alongside Lomax, but no other Beatles. 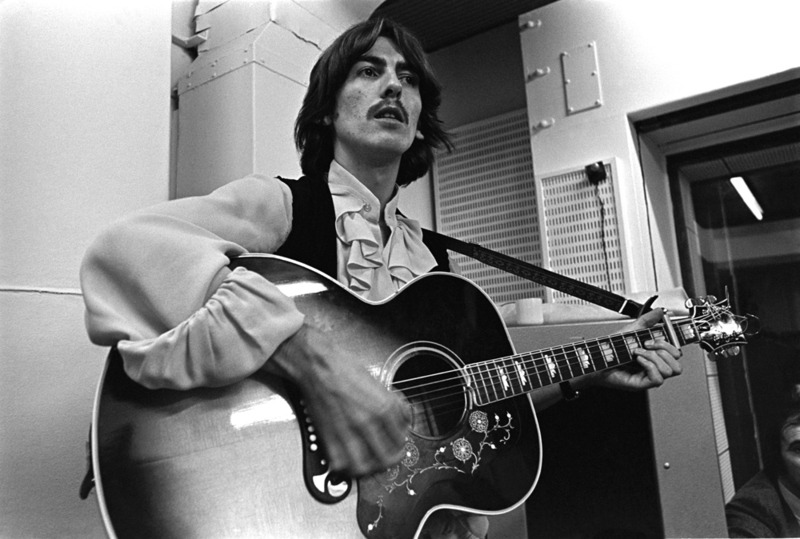 George Harrison received this guitar prior to recording The Beatles’ ‘White Album.’ While there is currently no evidence that it was used on any Beatles recording, it was used by George and members of Badfinger on the sessions for George’s All Things Must Pass LP set and by Badfinger member Tom Evans at Madison Square Garden during the Concert For Bangla Desh charity shows. 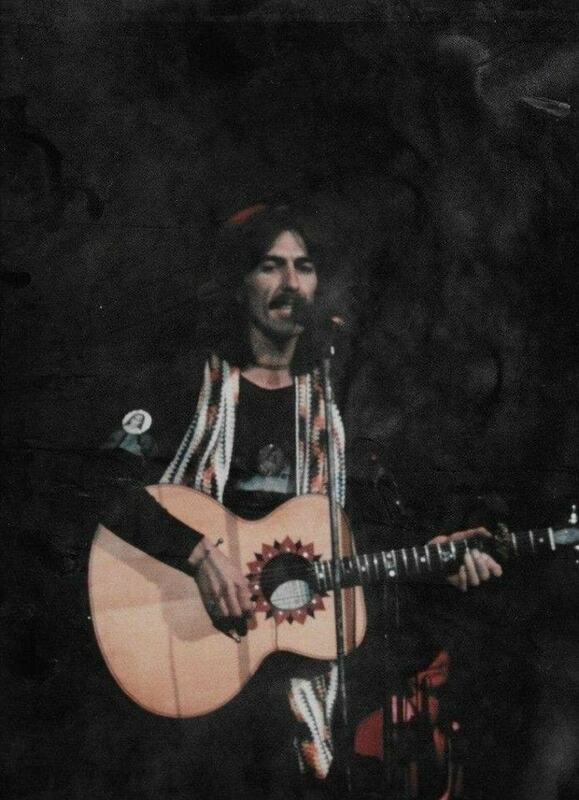 In 1974, George gave the guitar to Bob Purvis, a member of the band Splinter. 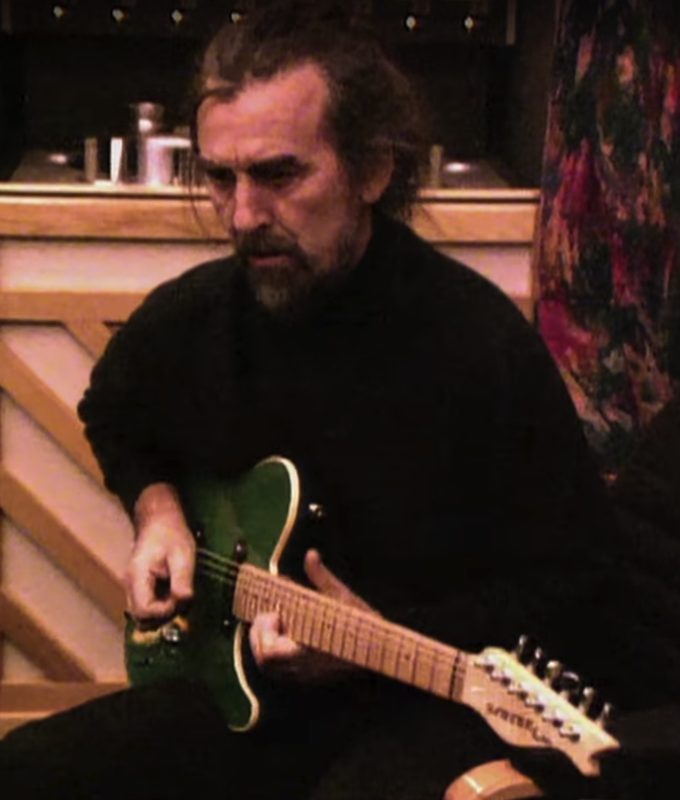 George produced Splinter’s debut LP, ‘The Place I Love,’ and played this guitar during those sessions. 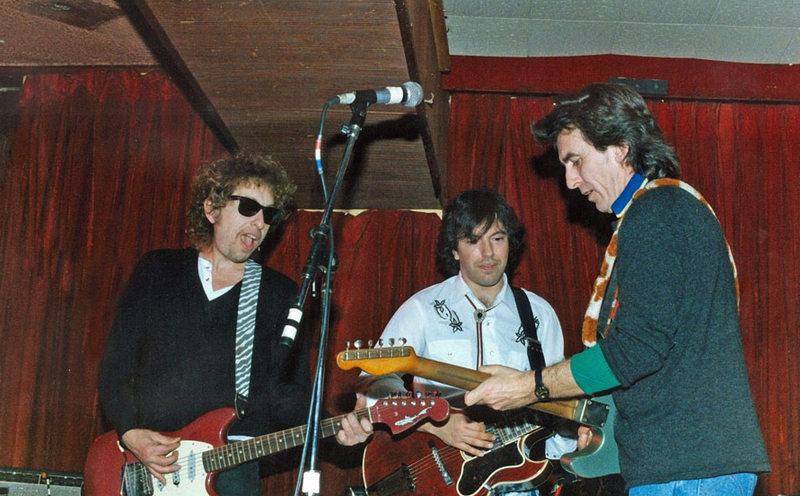 The original tuners were replaced some time before George gave the guitar to Mr. Purvis. An endpin mini-jack and Barcus Berry pickup were professionally installed in the mid to late 1970s. Harptone’s instruments were built in Newark, New Jersey, from 1966 until the mid-1970s. 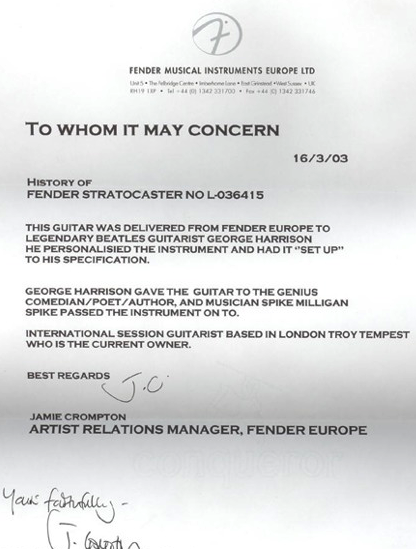 This instrument comes with a letter of authenticity on Harrison’s letterhead. 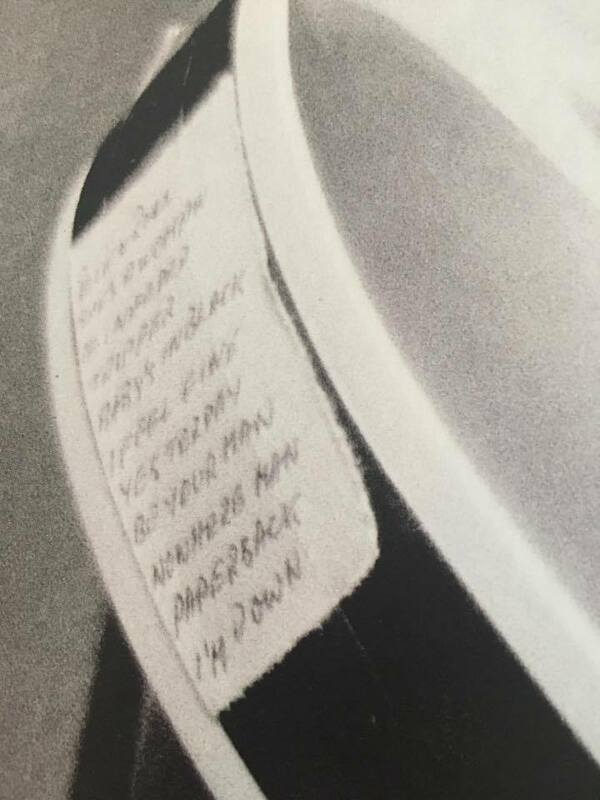 Purchased by Colts owner Jim Irsay from Heritage Auctions. Fender Stratocaster with Dark Hose Logo Sticker. 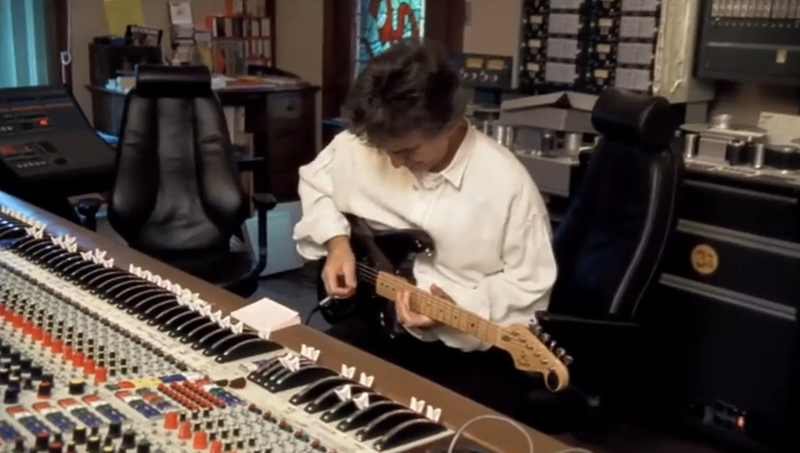 The story of the Strat Clapton gave Harrison is somewhat more convoluted. 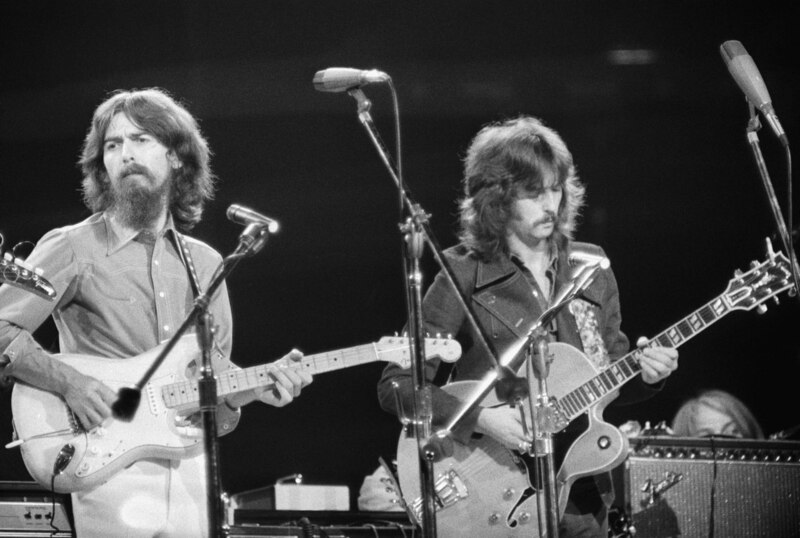 Harrison and “Slowhand” were close friends up until Harrison’s death in 2001, and over the years, Clapton gifted Harrison a number of different guitars. 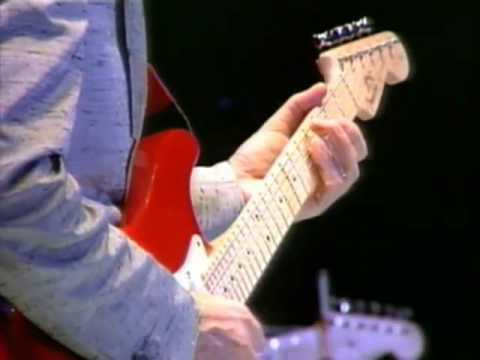 As far as the Strat from Sho-Bud is concerned, it’s believed that the guitar Clapton gave Harrison is likely the same one the former Beatle can be seen playing at The Concert for Bangladesh. 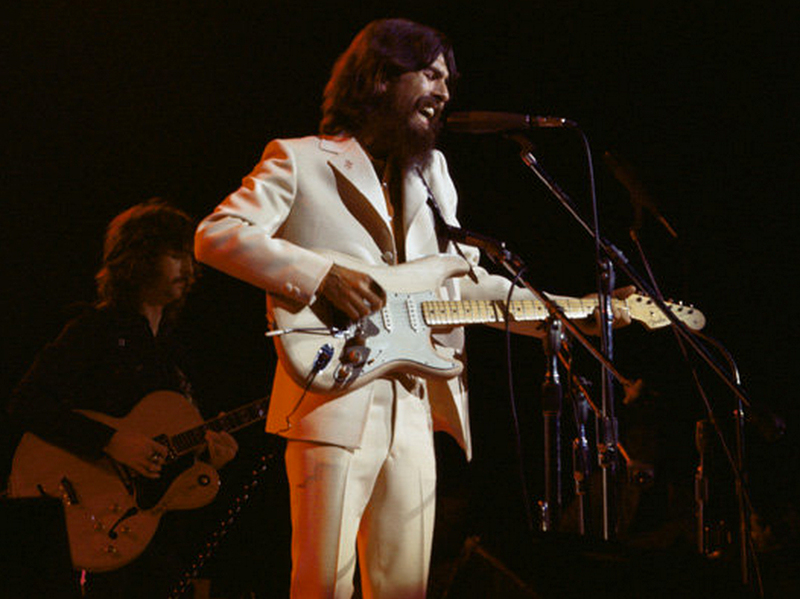 While some accounts suggest the Strat Clapton gave Harrison was a sunburst one, the Bangladesh guitar was stripped to the wood; meaning it possibly could have had a sunburst finish at some point. 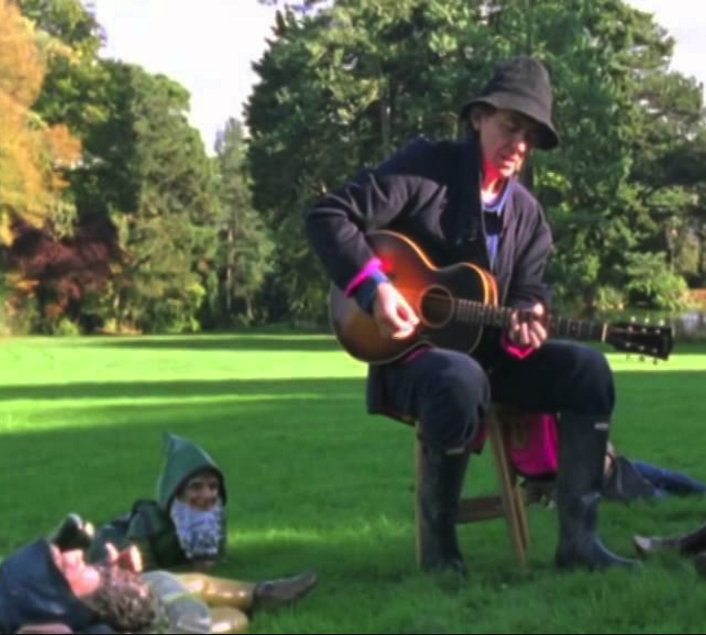 Harrison later passed that particular guitar on to his friend, Spike Milligan, or did he? George says that he gave a “stripped to the wood” Stratocaster to Spike Milligan. 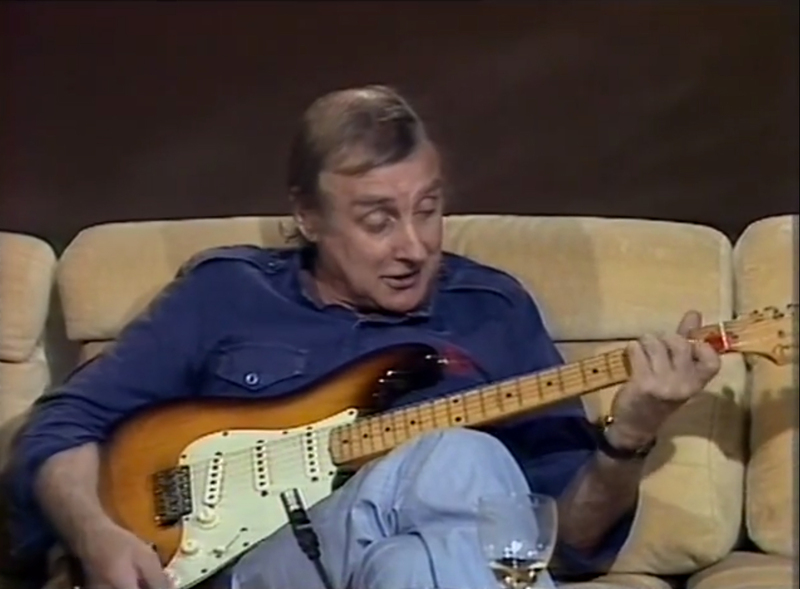 Spike Milligan, on an Australian TV show in 1985, shows his sunburst Fender Stratocaster given to him by George Harrison. 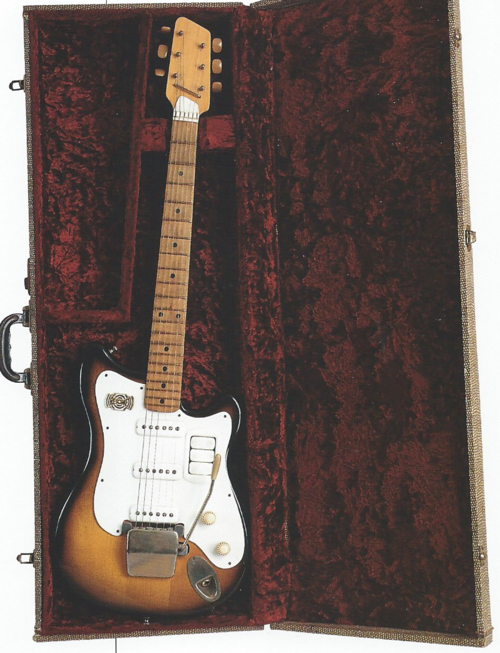 The Fender Stratocaster guitar, which Harrison gave to his late friend Spike Milligan of The Goons, sold for about $25,500. 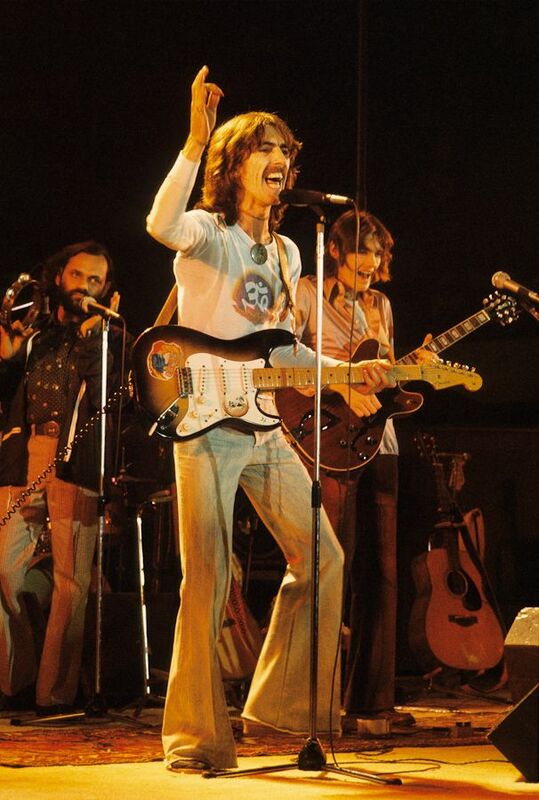 It’s clear that George gave Spike the sunburst Strat from Sho-Bud that Eric Clapton gave him in 1970 and not the stripped to the wood Strat shown in the Concert for Bangladesh. 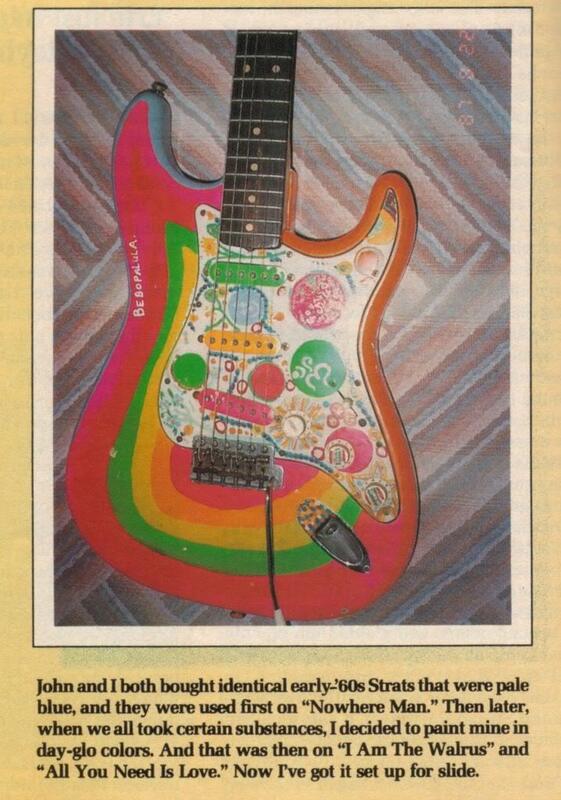 Having said that there is always the possibility that the Strat was refinished? Just guessing. What do you think? Lets not confuse another Strat that was auctioned off at Heritage Auctions in 2004 and again in 2006 by Cooper Owens with the sunburst Strat from 1970. This one was a black Fender Squier Stratocaster, Serial No. L-036415, given as a gift from George Harrison to Spike Milligan. 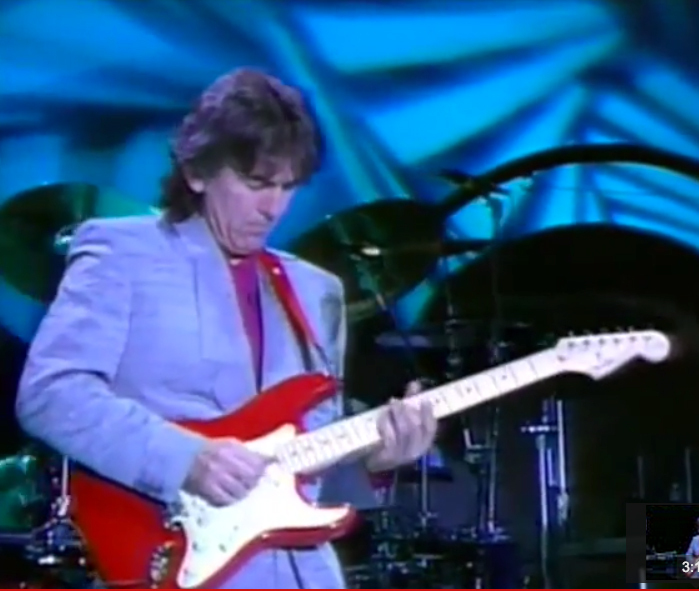 George playing “While my guitar gently weeps” on a Fender JV (Japan Vintage) Export “Squier” Strat with Clapton. 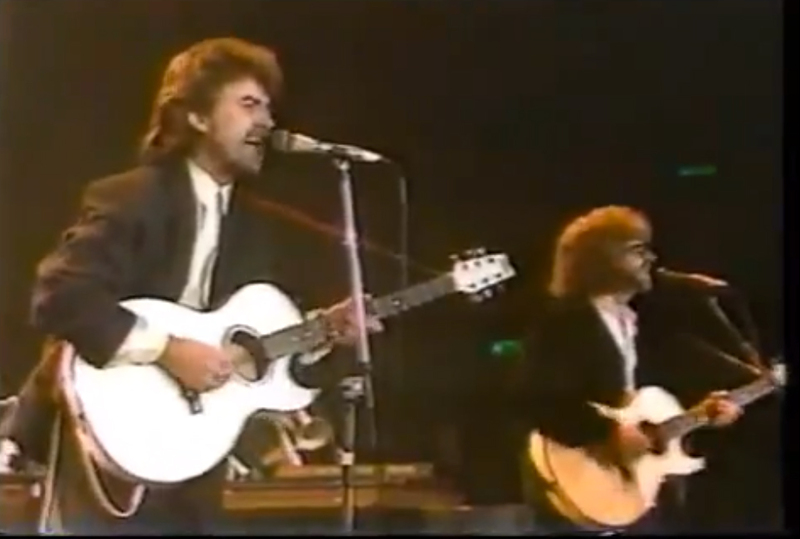 George and Jeff Lynne played identical Washburn EA-20 Acoustics. They were used for “Here Comes the Sun” Check YouTube for the videos. 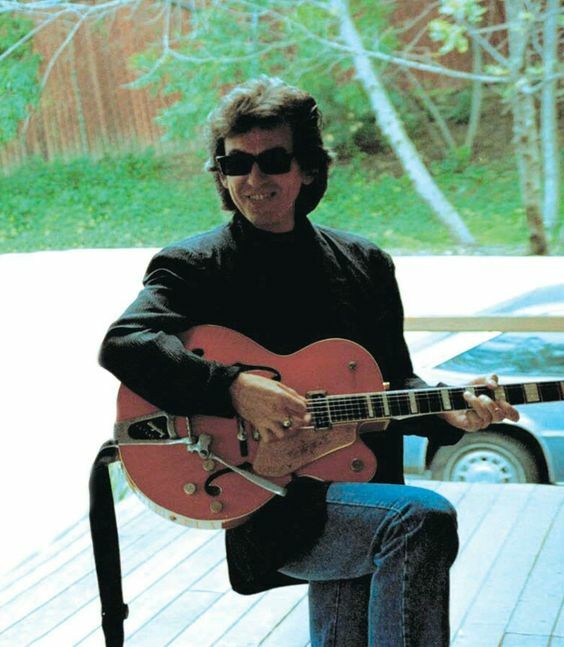 The 1988 Gretsch TW300 guitar, along with George playing it for the ‘Handle With Care’ promo video. 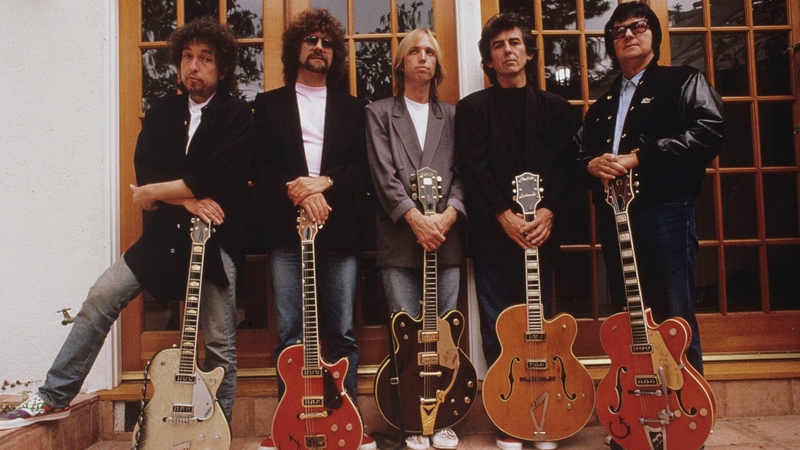 The Wilburys – Jeff Lynne, George Harrison, Tom Petty, Roy Orbison and Bob Dylan – would be photographed with their namesake guitars and provide their signatures (or to be more precise, their alias’s signature). Meanwhile Gretsch would build up some operating capital from the ‘collectibles’. In all, six TW models were created, all featuring Wilbury-themed graphics on the front and the stars’ ‘signatures’ on the back. They were cheaply made in Korea, and bear no resemblance to any other past or current Gretsch. Truth be told, they were sort of a Danelectro/Tele hybrid. A few collectors hoarded them thinking they would eventually be a goldmine, but that looks unlikely. Gretsch made a ton of them, and they were always low-priced promotional guitars. The Fender Electric XII was a purpose-built 12-string electric guitar, designed for folk rockers. This model was designed by Leo Fender but unfortunately it was not very popular and was discontinued around 1969-70. 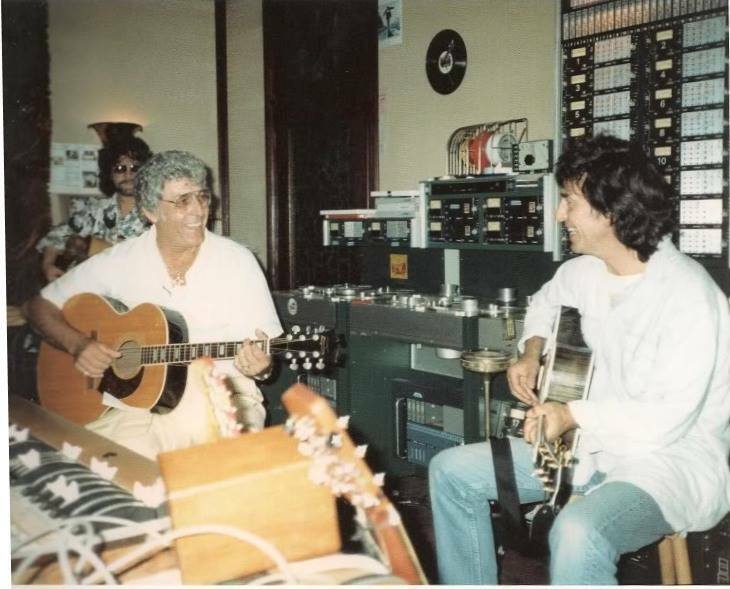 George Harrison playing his Gretsch “Chet Atkins” on the Rockabilly Session — Carl Perkins & Friends. This guitar was given to him by his wife Olivia. Blue Suede Shoes: A Rockabilly Session was a televised concert that was taped live at Limehouse Studios in London, England on 21 October 1985. 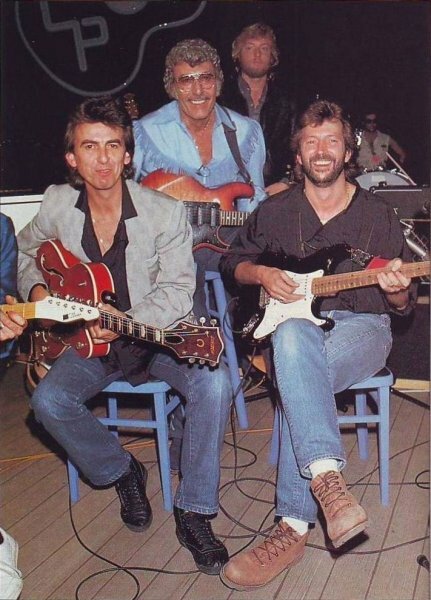 The show featured rock n’ roll pioneer Carl Perkins along with friends as guest stars, including Eric Clapton, former Beatles George Harrison and Ringo Starr, as well as Dave Edmunds who acted as musical director for the show. Most of the repertoire performed in the concert consisted of Perkins’ classic rockabilly songs from the 1950s. Luthiers Roger Fritz and his brother John, collaborated with Roy Buchanan to create the Roy Buchanan Bluesmaster guitar. Recording Real Love in 1995 for release as part of The Beatles Anthology project. 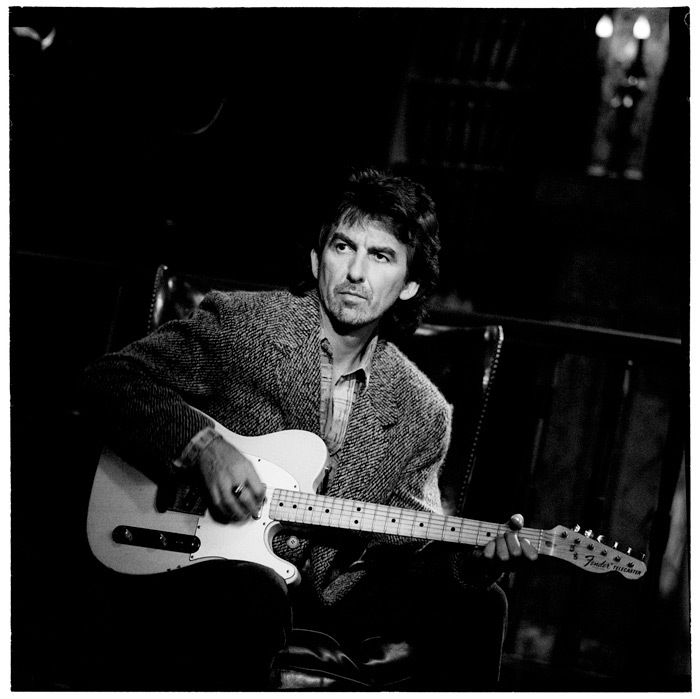 During the recording of Free as a Bird and Real Love, George used 2 Fender Stratocasters as well. A red strat and the black one pictured below. 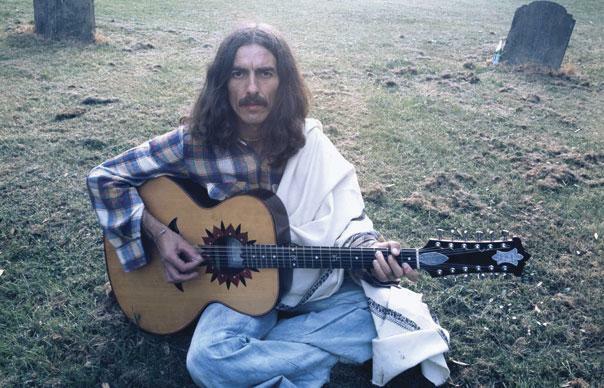 A sitar owned and played by George Harrison is going to be auctioned in the United States. 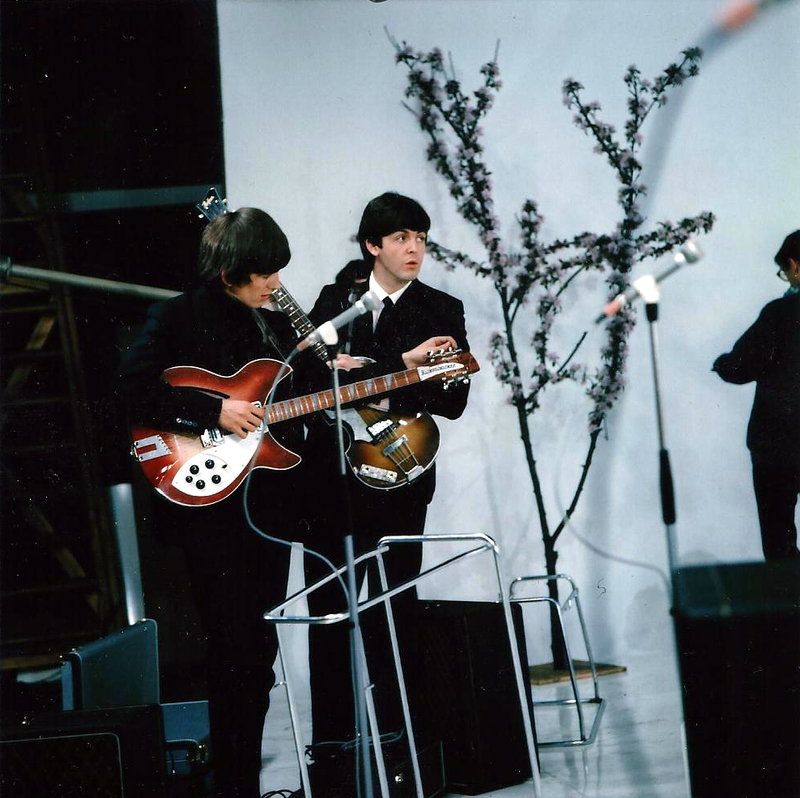 The instrument, purchased from a shop on London’s Oxford Street in 1965, was used by Harrison during the recording of the Beatles song Norwegian Wood. The Indian string instrument, crafted by a well-known music shop in Kolkata, was later gifted to a friend of Harrison’s first wife, Patti Boyd. 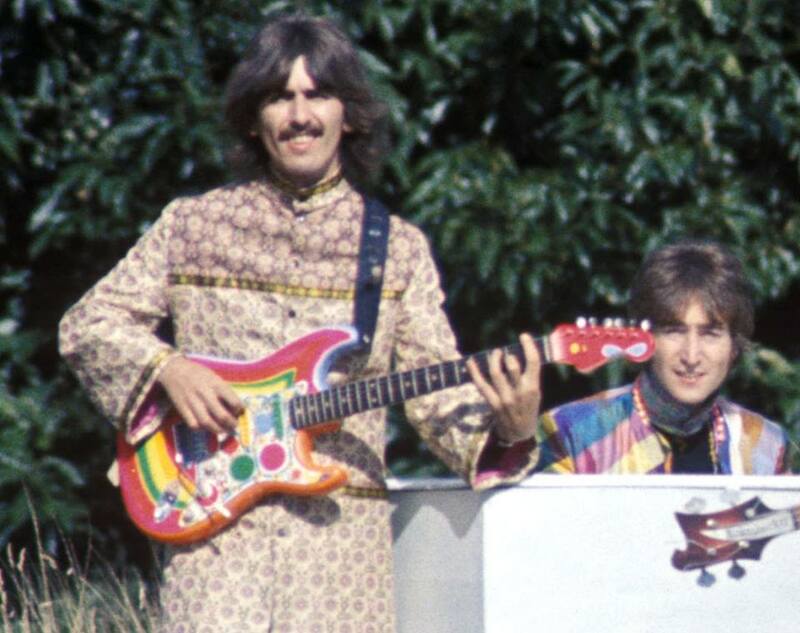 Harrison had discovered the sitar in 1965, on the set of the Beatles’ second film, Help. His love affair with oriental mysticism first made itself known in Norwegian Wood, John Lennon’s tale of an extra-marital fling. Acoustic guitar and muted bass were augmented by the Indian instrument. “We’d recorded the Norwegian Wood backing track and it needed something. We would usually start looking through the cupboard to see if we could come up with something, a new sound, and I picked the sitar up – it was just lying around; I hadn’t really figured out what to do with it,” Harrison was quoted as saying in The Beatles Anthologies. 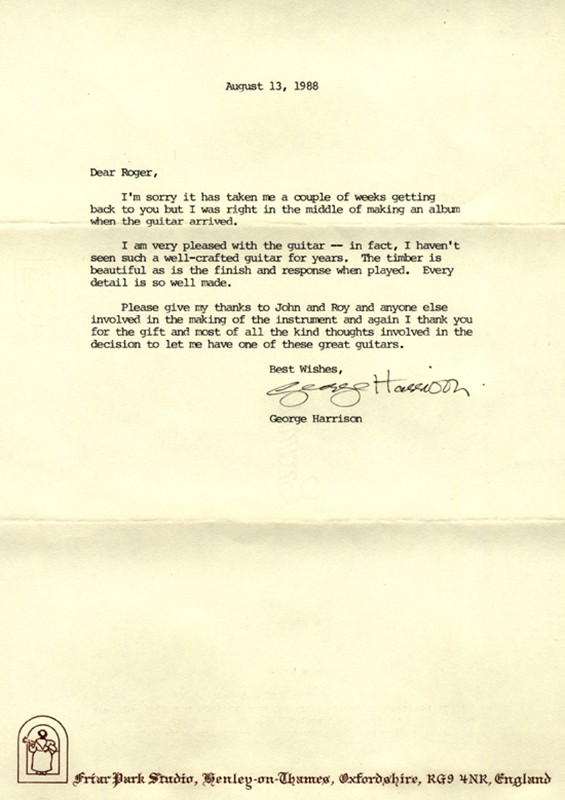 Next year, Harrison gifted the sitar to George Drummond, a friend of Boyd, during the couple’s honeymoon in Barbados. 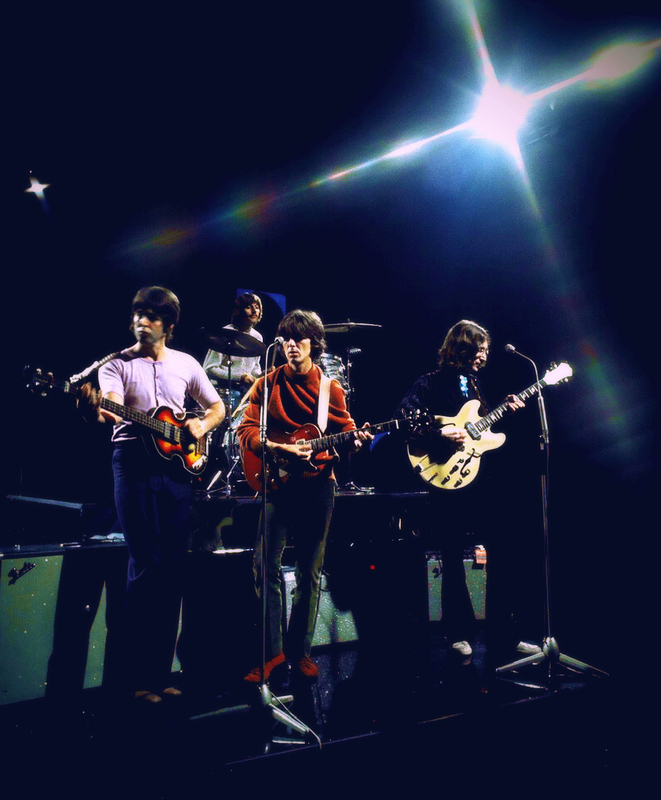 The Beatles recorded Norwegian Wood – the first Western rock band to use the sitar on a commercial recording – in October 1965, heralding a short lived “raga-rock” genre. A year later, Harrison travelled to India to learn how to play the instrument under the renowned sitar maestro Ravi Shankar. In an interview with the BBC’s Mark Tully in April 2000, Shankar said when he first heard Harrison playing the sitar in Norwegian Wood, he was not impressed. Harrison later agreed, saying the sitar on Norwegian Wood was “very rudimentary”. “I didn’t know how to tune it properly, and it was a very cheap sitar to begin with. But that was the environment in the band, everybody was very open to bringing in new ideas. I am writing about the sitar pictured here. 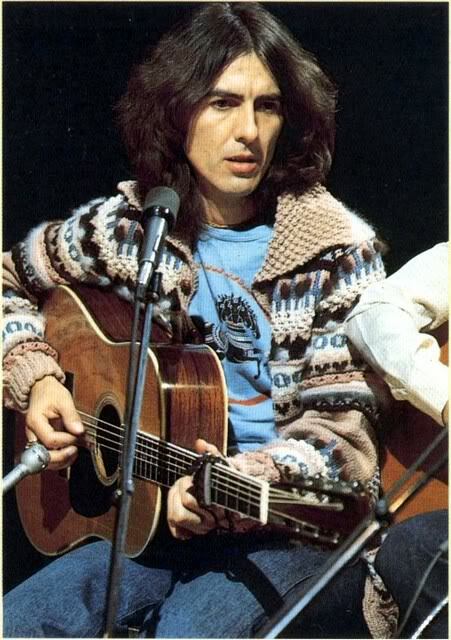 This was George’s second sitar – i.e., NOT the one that he used on ‘Norwegian Wood’, which was a cheap sitar that he bought in London. 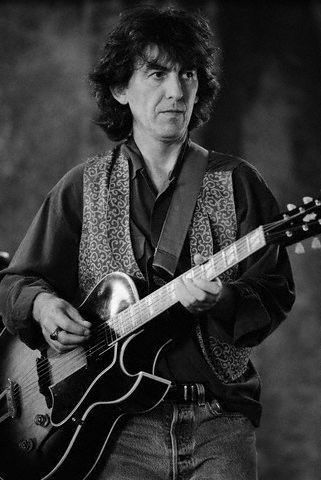 The sitar pictured on your page was bought by George in India. One of the things that is not mentioned is that the sitar is a Ravi Shankar type sitar – i.e., the type used by sitarists of the Senia Beenkar Gharana (“Gharana” means “School”); these sitars have 7 main strings, and 13 sympathetic strings, and are different from the other main type of sitar, modified by Vilayat Khan (another great sitarist, like Ravi Shankar). The Vilayat Khan sitars (played by sitarists from the Etawah Imdadkhani Gharana have 6 main playing strings, and 11 sympathetic strings, and produce a lighther, ‘thinner’ sound. Rikhi Ram Musical Instruments and the great “Beatles” now completes 45 years of togetherness. Wow! It was early July 1966, when they came to India and connected with my father late Pt. Bishan Dass Sharma at the Oberoi Hotel, New Delhi for Indian Musical Instruments like Sitar, Sarod & Tanpura. The picture on our website is taken in the Oberoi’s hotel room. 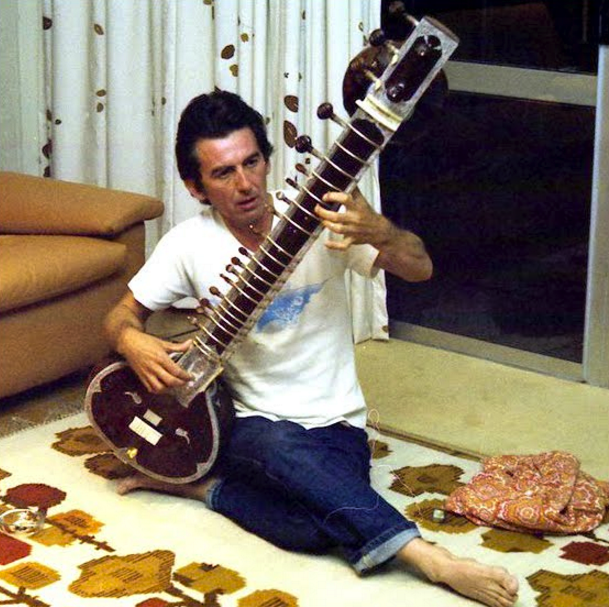 George Harrison bought sitar, my father displayed those instruments by playing each of them. What a historical moment it was for Indian Music! It was boom for Indian Classical Music in the western world. My father who had engineered George’s sitar, which lived as his favourite one in his life time. My salutations to all the great personalities. Missing my father’s humble smile whenever talked about this moment. Prayers to pioneer of musical instrument making, Ever!…..my father Pt. Bishan Dass Sharma. Also to the great Beatles members, who are not around….. “George Harrison and John Lennon. There is footage of George having a 1968 sitar lesson with Ravi Shankar on youtube, and his technique there leads me to believe that he might not have played sitar on ‘Love You To’, which of course, is on ‘Revolver’, from 1966. I say this because the sitar playing on ‘Love You To’, is more accomplished than that in the footage of George’s 1968 lesson. 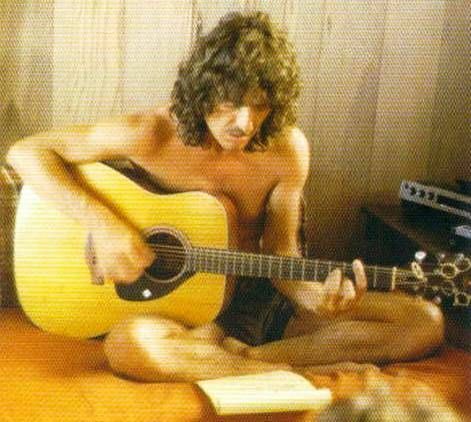 However, George may have really learned his part for ‘Love You To’, and might actually be playing the sitar on the track. 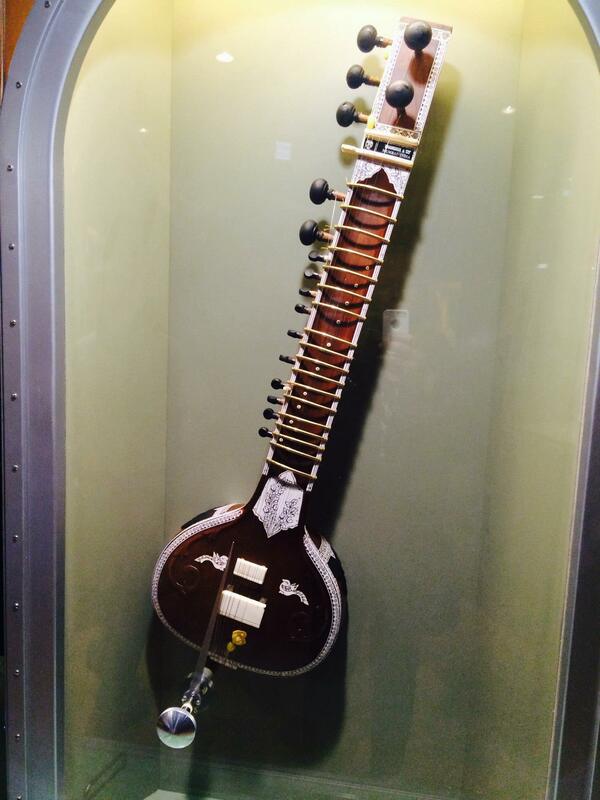 I took this photograph of another of Georges Sitars taken in Vancouver BC September 2015 at a traveling Beatles exhibit at the Pacific National Exhibition. Great pictorial of Harrison guitars here. 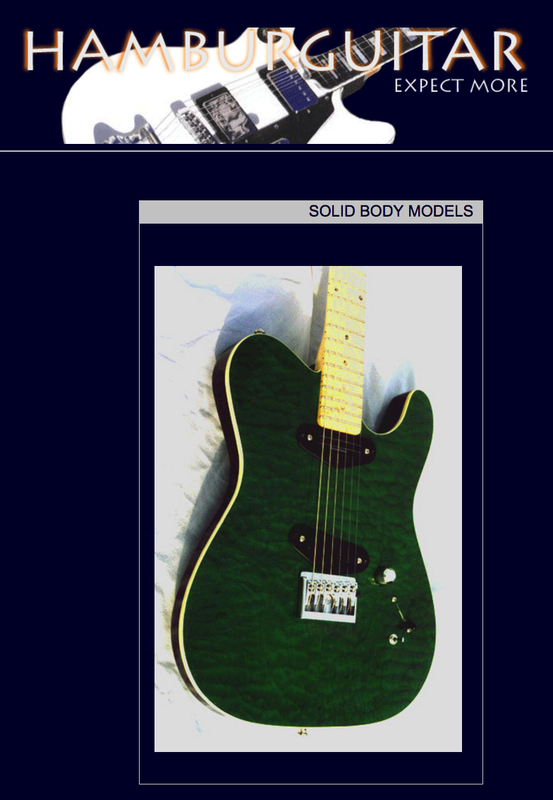 Particularly interesting is the “unknown guitar” 6 pics up … looks European to me. 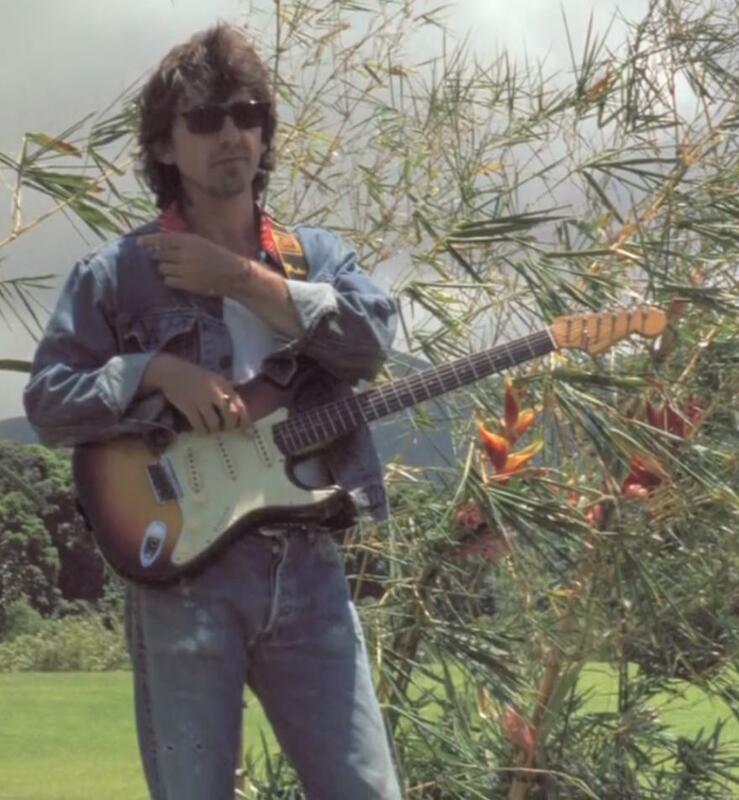 Could be wrong, but this is the first pic I’ve seen of George with it. Anyway, thanks for posting these. Your welcome John. 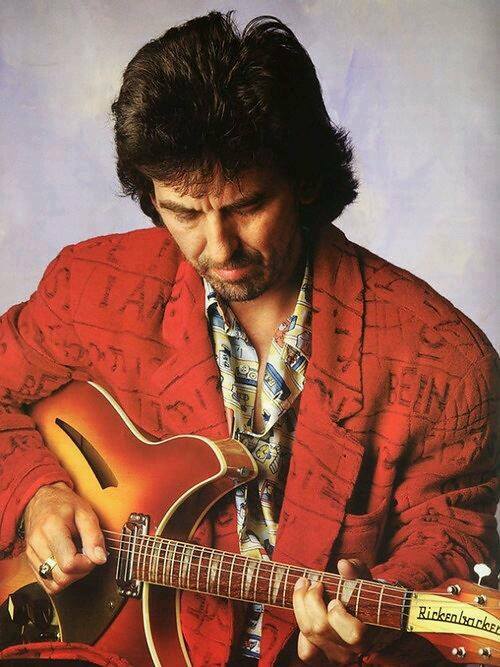 I’m glad you enjoyed the pictorial of George’s guitars. 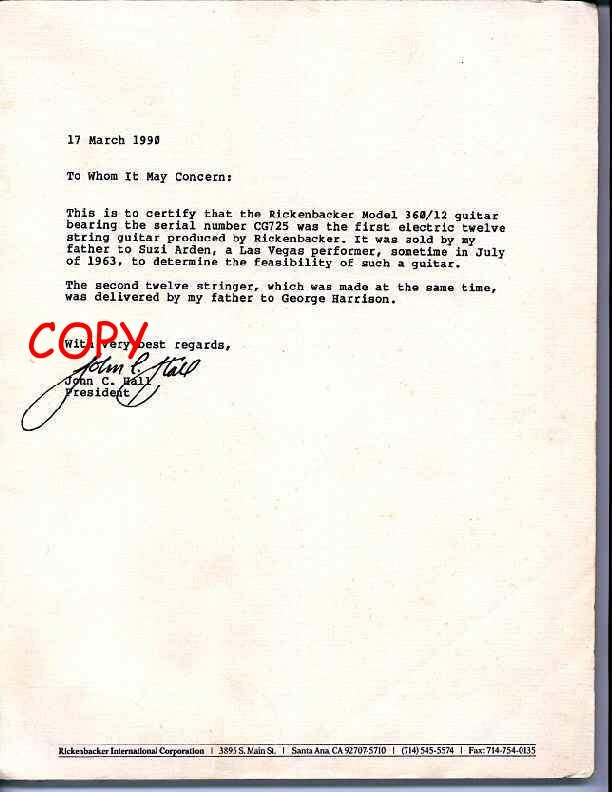 Does anyone know the serial numbers of the two 6122 Country Gents that George owned? I cannot find any information on the serial numbers of George’s gents. Maybe Ringo will show the serial number of Georges second gent someday! 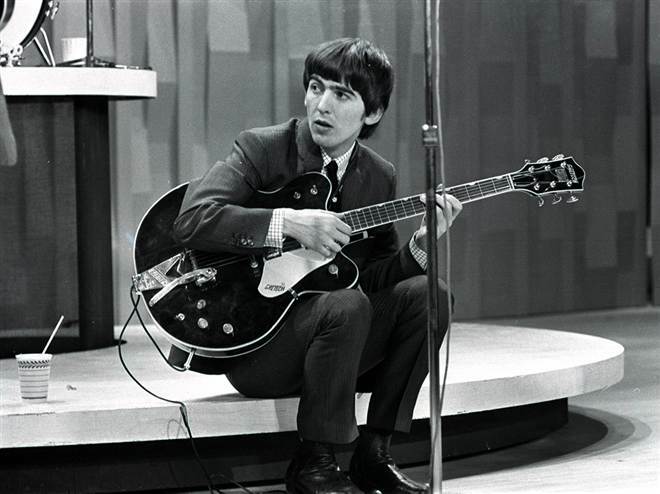 How could George use a guitar built in 1967 to record “And I Love Her” in 1964? A mine of info and more than Beatles Gear for those of us who can’t get enough of the facts.Trying to put together a homage to some of Georges early guitars for the Merseyside Guitar Show November 2014….anything Beatlesque always draws a crowd to my stand. 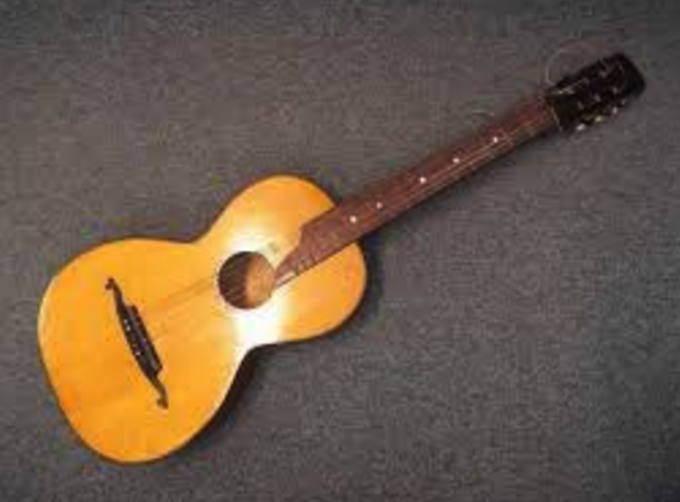 What’s pictured above as a “Blonde Gibson J-200” is actually a Gibson J-2000 cutaway. The guitar in the Jackie Lomax photos is actually a 3 pickup ES-5. Thanks for identifying the Gibson ES-5 in the Jackie Lomax photos Joe 🙂 You rock! 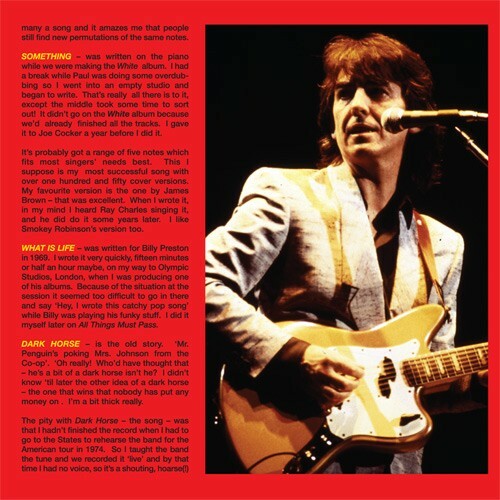 You have a great shot of George (playing his Gretch Chet Atkins ) and Eric Clapton labeled as being in Japan. I’ve seen this concert many times. It’s actually a Carl Perkins concert. Here’s some information. 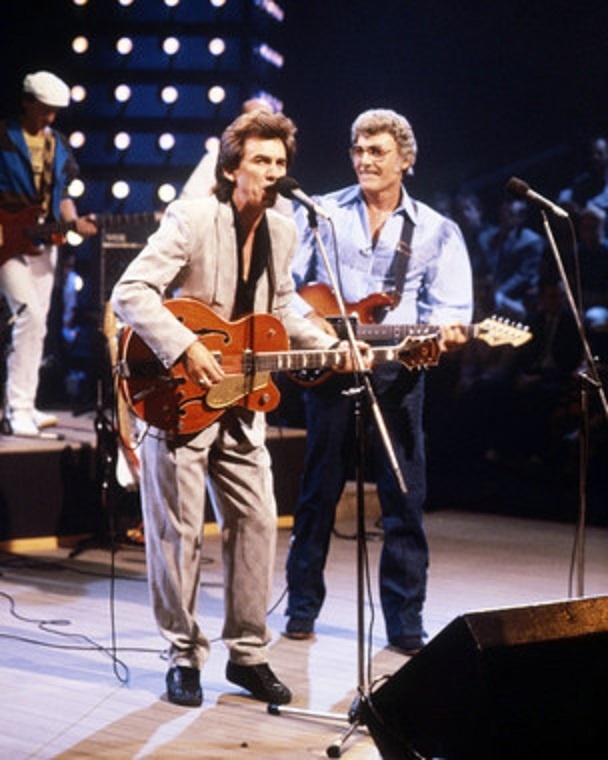 TV SpecialAlternate Title: Carl Perkins & Friends, Cinemax Sessions (01/05/86) Check Youtube! I’d also like to know what kind of guitar George has on his wall three pictures up from here.. I’m pretty sure it’s a lap, slide guitar.. It’s over his right shoulder at 10:00. Great site! Any plans on doing Pauls guitars? Thanks for the feedback Buddyhoot! I do appreciate your help with corrections. I am working on Pauls guitar page and should have it up in a week or two. The logo on the ’69 Rosewood is often incorrect. In MANY instances you will see a more spaghetti logo in silver. And in some instances a truss rod plug. 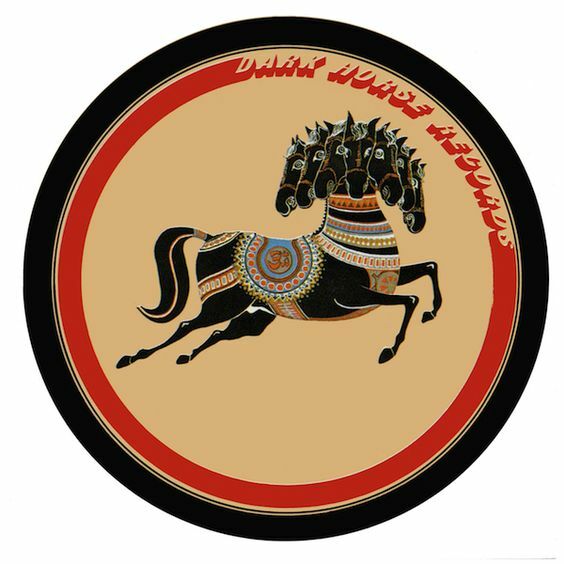 George’s logo is gold, and is not like the one’s often used. It also does not have a truss rod plug or skunk stripe. The Fender Custom Shop has made these guitars with the names “60’s Rosewood Telecaster NOS” NOS meaning New Old Stock. 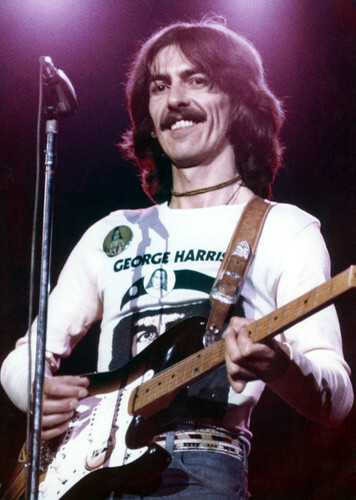 The Master built models however are more closely aligned with George’s guitar with the original gold logo and the COA reading ’69 Rosewood Telecaster NOS. The neck plates are often different as well. Some having the Custom Shop stamp, while others are original to Georges F logo stamp. 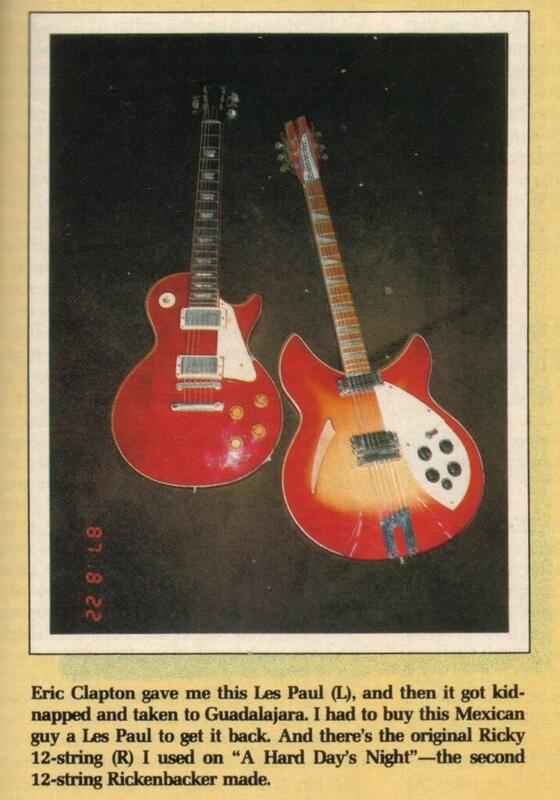 The large picture in Andy Babiuk’s book is not in fact George’s original guitar. 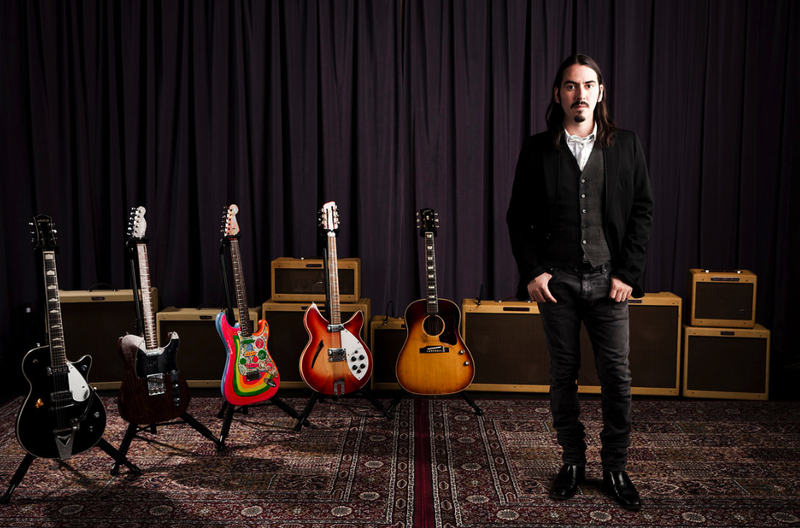 This has since been proved with the Dhani Harrison Apple App. of his fathers guitars. 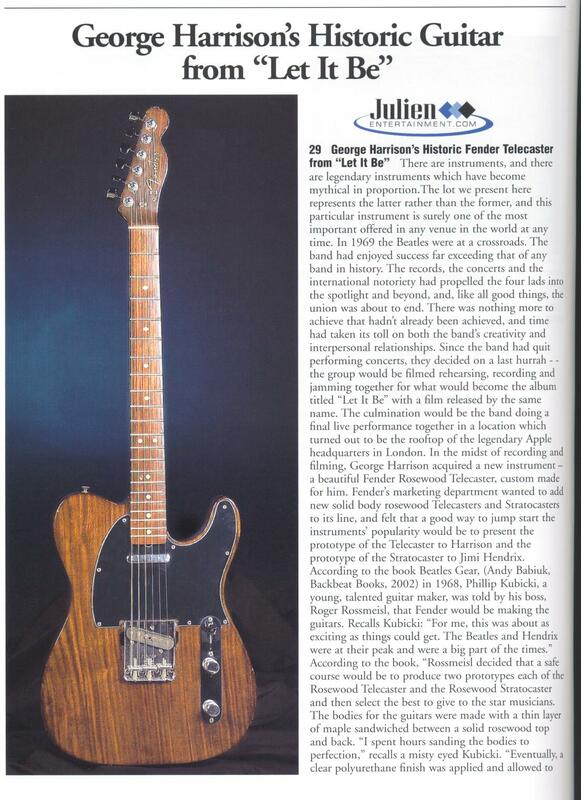 Thanks for the mention in the Rosewood Tele section. The sale of the guitar turned into a bit of a challenge for me. I had brokered a deal with Norm Harris of Norm’s Rare Guitars and at the last moment, Delaney decided to back out. I was upset at the time; not for any loss of a sale, but for the embarrassing chore of explaining to Mr. Harris the unfortunate circumstances. He too was initially miffed but we all got over it and Delaney is gone now. I tried getting the guitar back into George’s hands by writing his office but the lady I had dealings with (NOT Olivia by the way) was extremely rude and demanding. She could have arranged a sale through me and saved a lot of money. 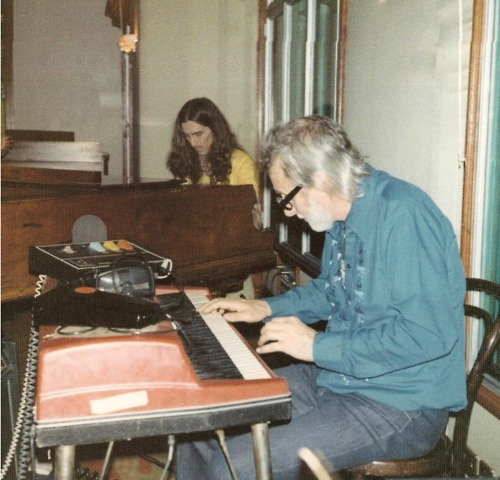 Be that as it may, the instrument ended up in the right hands, with George’s son, Dani. 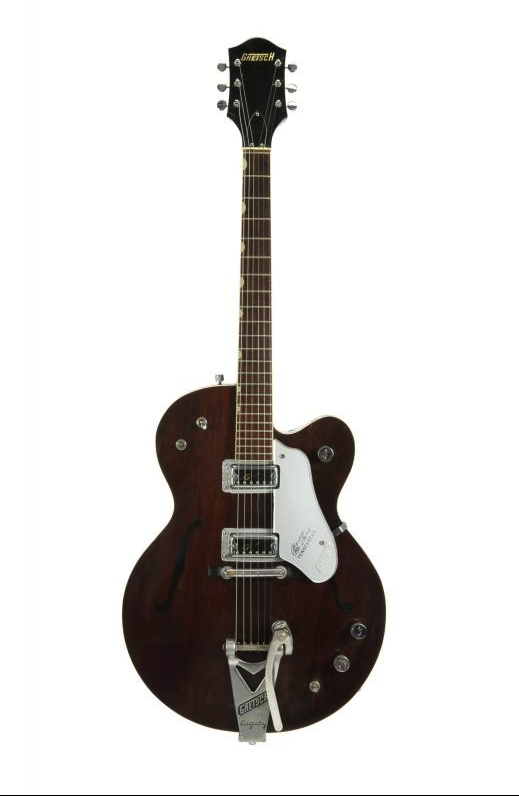 The Gretsch Tennessean in Ringo’s auction is not the one George used with the Beatles. Really, Please tell me more. I would like to have the correct information on my page. Awesome job! 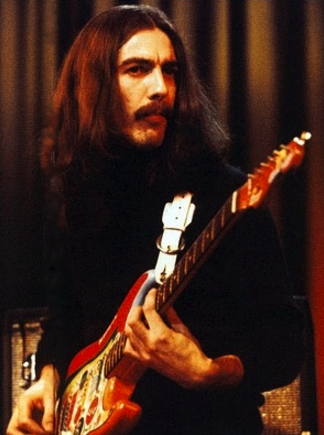 Do you know anything else about the Black Fender Strat George is playing? 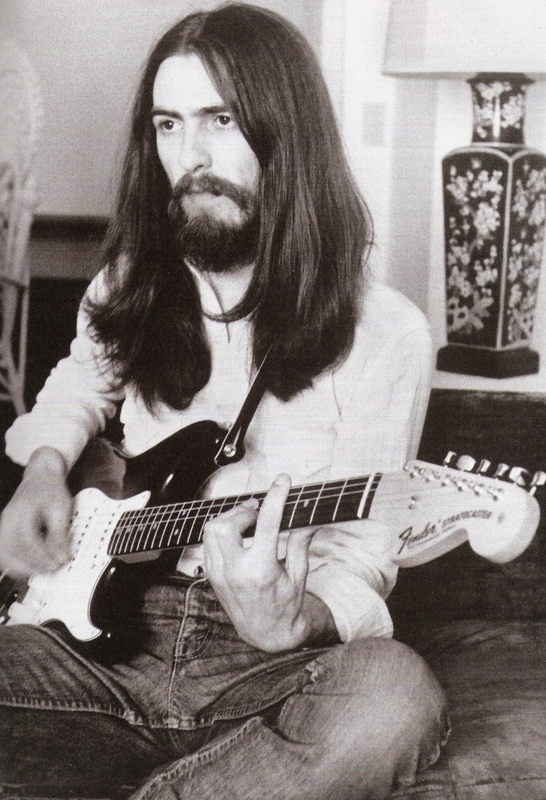 The picture is from his “All Things Must Pass” era….Bearded and long hair. Strat looks 60’s, no,truss rod on the top of neck….. I don’t know anything about it other than the era it came from All things must pass. 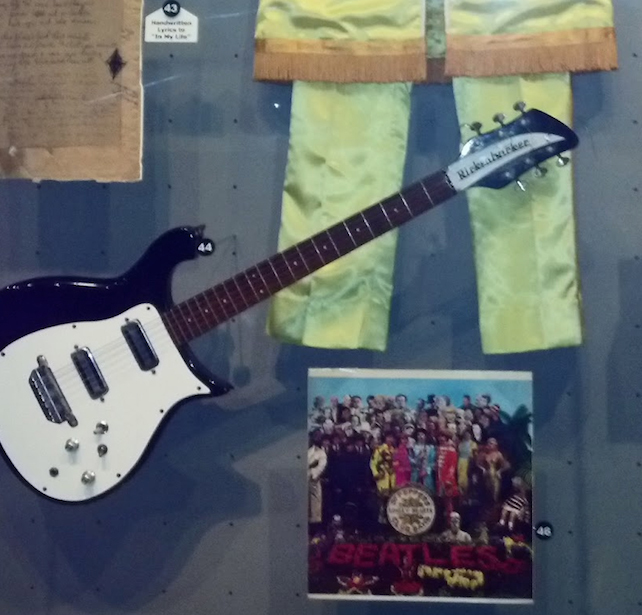 It does appear in the pictures of Georges guitar collection, hanging beside the dark horse strat. Thanks for your work and effort. This is very nice stuff, and a a great expansion of the “Beatles Gear” books. Never forget the night show in Memphis (66). Seats behind the stage and Mal brought out the SG & Rick 12 and just laid em down on the stage behind the drums while Bobby Hebb was still doing his set. 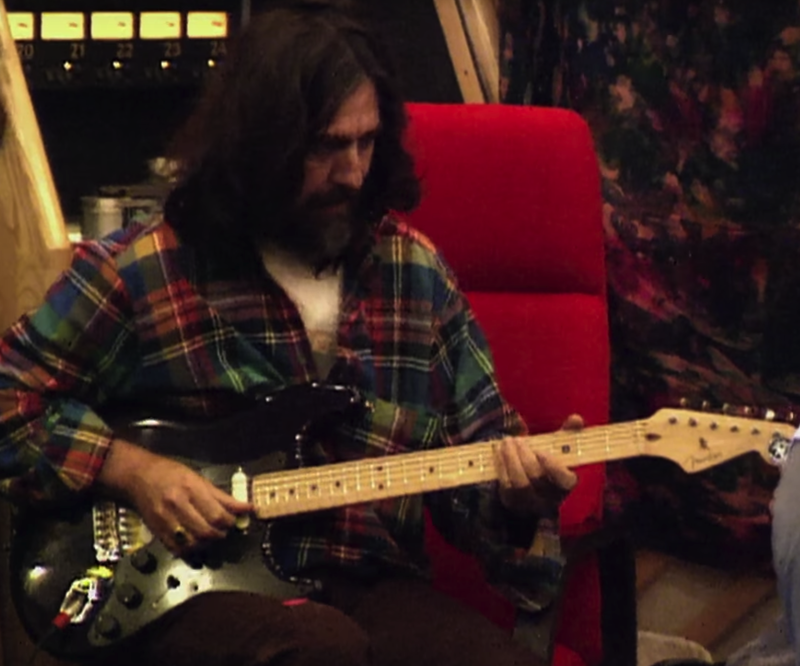 Of course George didn’t use the SG. But interesting as i don’t think it’s recognized he brought it on tour, only Casino. Under the photos for “1957 Gretsch PX 6128 Duo Jet. 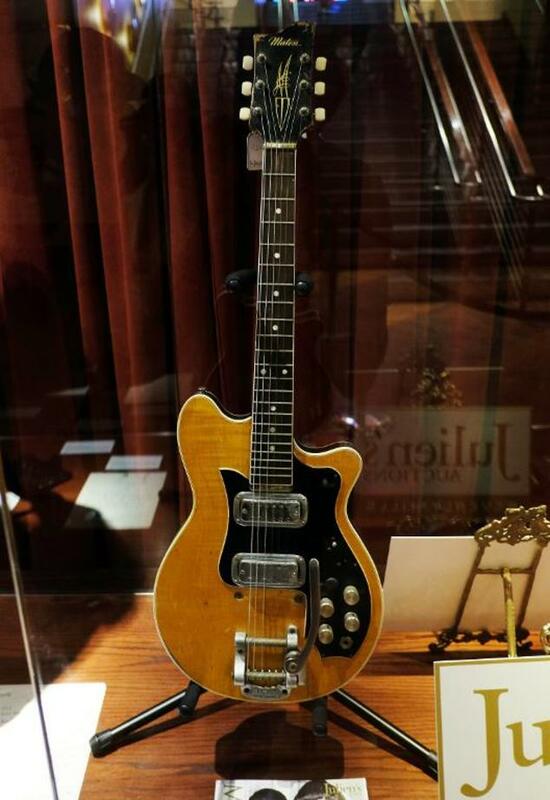 First American Guitar” it says……..”Stats: Rickenbacker PX6128 Duo Jet, a late 1957 model, featured a solid body, “cloud” inlays, a Bigsby® vibrato, black finish with a silver pick guard, and two DeArmond pickups.” Shouldn’t it have Rickenbacker replaced with Gretsch? Thank you Peter, Yes of course you are right and i will fix that immediately! Beatles Fans Rock!!! Hello, the picture of the Tennessean given to Ringo for the concert for george is not the same one used at Shea stadium or Help! for that matter for the simple and obvious reason the “F” holes on that guitar does not have any white binding around it . It must have been a second one he owned but never made public. Very nice stuff! Lot of details! Very cool! Thanks from France! Thank you Axel 🙂 I’m thrilled that you stopped by. 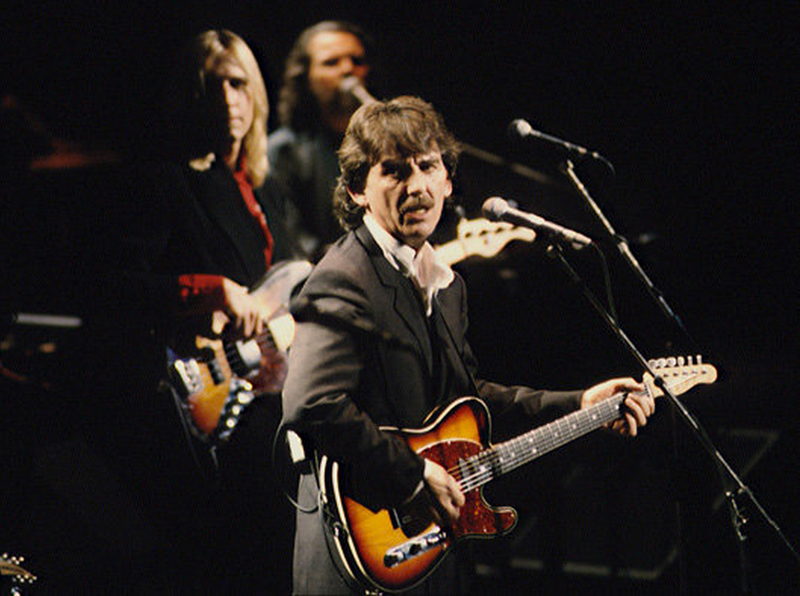 In the picture with Paul Simon, George is playing a Martin D-35S. The “S” designation is for “slotted headstock”, a feature on their 12-fret models. Thanks for this fun page! Ooooooo, that’s awesome. I’ll look into that more right away 🙂 Huge thanks Eric. 1982 Takamine F349 Acoustic. Do you have copies that don’t have Maverick Music.com imbedded in them? I do have on the picks but not the guitar. Thats cool too. Alvin Lee was a fave of mine too! Got to see him at the El Macambo in Toronto. Small venue – 5 feet away from the stage. Hell ya, you always need more guitars Phil! The Sonic blue vs Daphne blue has been a topic of conversation forever it seems. I find it’s impossible to be sure. I posted a colour comparison with both colours but they do fade and so i put this up for all to debate. Great site!!! I have a question that I can’t find the answer to anywhere. 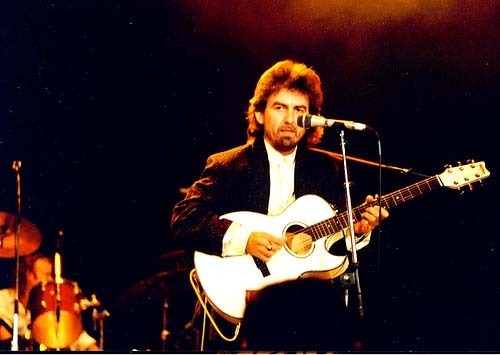 Were either of the Gretsch Country Gentleman guitars that George owned black in color? Hey Joe, George’s Country Gentleman guitars were not Black. 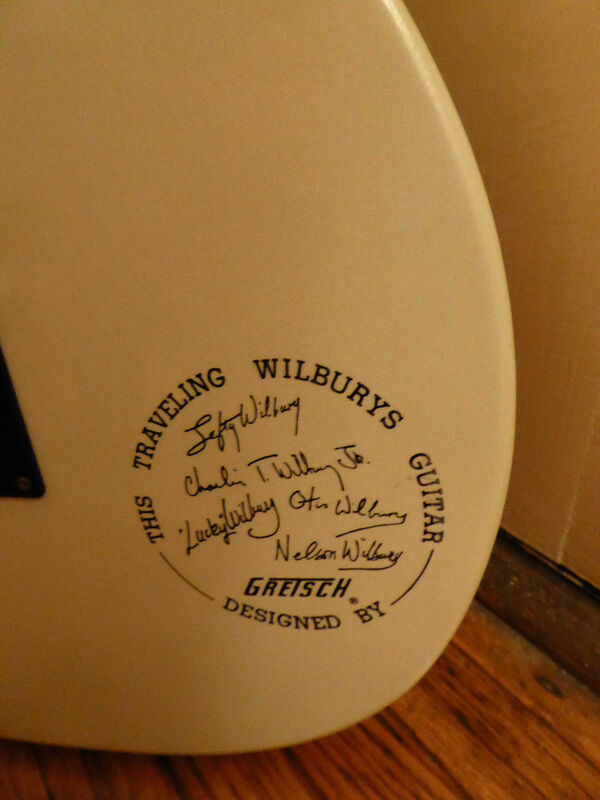 According to Gretsch, they were walnut stain. 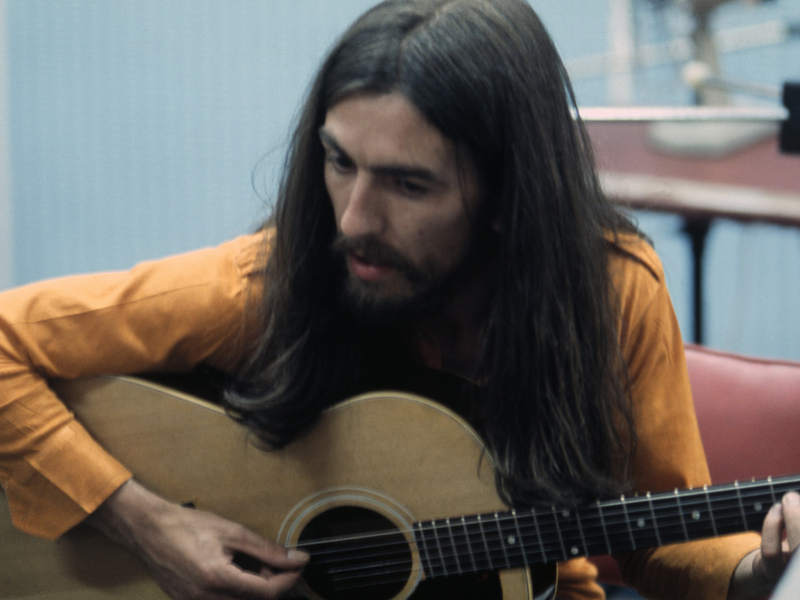 Thanks for the great article of George and his beloved guitars! Your scholarship is excellent (and so are the pictures). George never felt that he was a virtuoso. He once said, “I can’t put two notes together”, which was an exaggeration, to say the least. But he was comparing himself to the older guitarists that he admired, like Chet Atkins and the “gods” of his era, Hendrix, Clapton, Beck, etc. 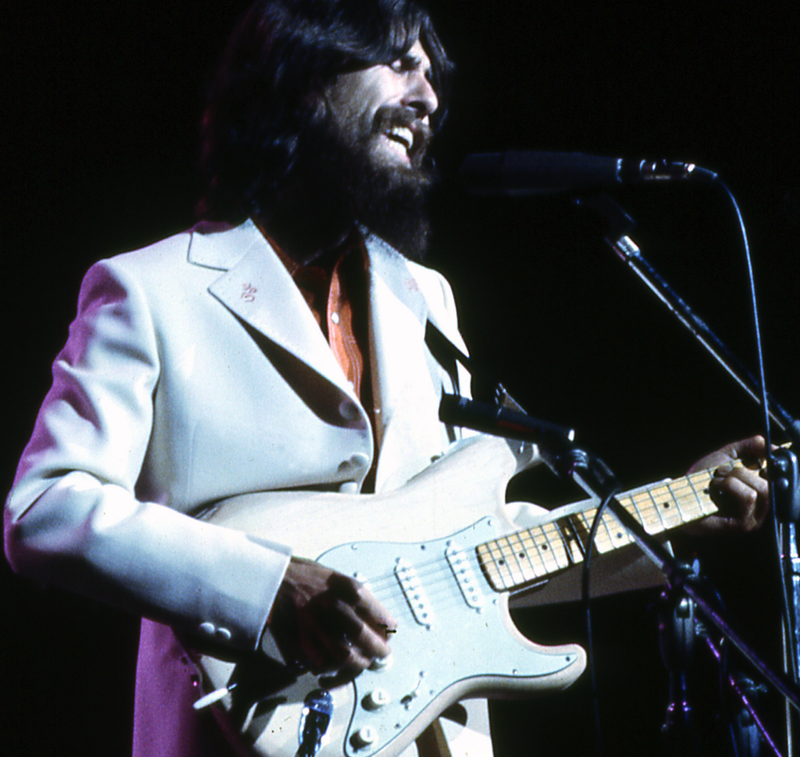 George’s gifts as a guitarist went beyond the ability to improvise an impressive solo. His sheer musicality is what helped to make the Beatles records so special. My only issue with your article is the comment “history shows that George was every bit the songwriter and musician that John and Paul were”. 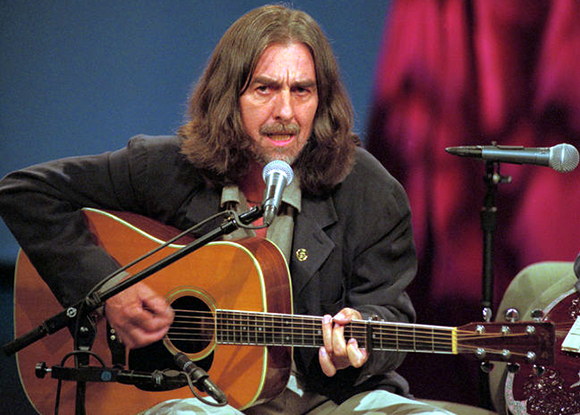 We love George, but there was no songwriter like John, not even Paul. John’s best songs have a depth of feeling that are unequaled by any songwriter, before or since. They touched the heart, mind and soul. That’s why he was John Lennon. I know you’re right. 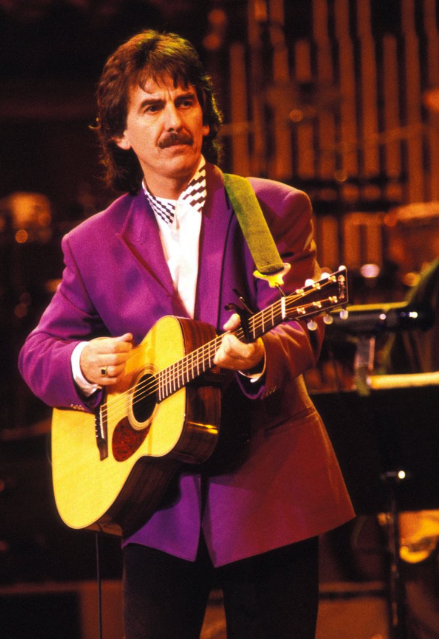 George was a solo writer and could never reach John or Paul’s songwriting ability, but he did pen some iconic songs and we love him just the same. I read somewhere that John aspired to be the philosopher/artist, while Paul was the more disciplined/accomplished musician. Georges contributions were minimal, but still important. Saying that history showed that George was every bit the songwriter and musician that John and Paul were, was of course stretching it. Great article. Us mere mortals can only dream about the perks of being a Beatle although dealing with theives must have been horrible. I love your website, and the passion you put into it and into your respectful replies to people who have posted here. Many thanks for this. There is footage of George having a sitar lesson with Ravi Shankar on youtube, which leads me to believe that he might not have played sitar on ‘Love You To’, which of course, is on ‘Revolver’. Oh you made me laugh Geert :-), I feel the same way about Glam Rock. My friends called them haircut bands. Just couldn’t get into the overwhelming and mind numbing use of synthesizers and synthetic drums beats and i turned away from that very quickly. I was born and raised in Toronto too. I know exactly what you mean about finding information about any band in the 60’s and 70’s. I remember trying to get lyrics off of new records by lifting the needle off the record and listening over and over and over to figure out what they were saying. 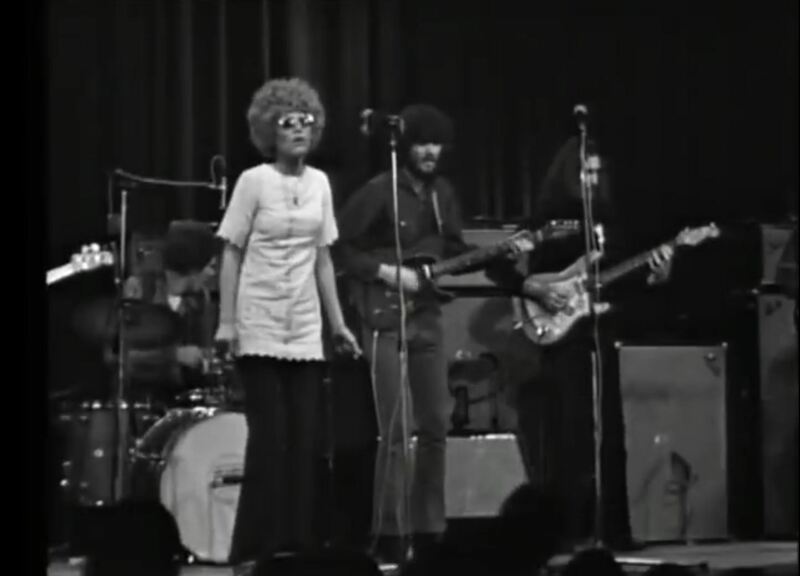 (Long Cool Woman by The Hollies is a perfect example). Thankfully, the fabs put the lyrics on the back cover of Sargent Pepper! When the internet came along i was like a sponge. I needed to know as much as i could about the Beatles, mostly because they were the absolute one thing that affected every part of my life after that February night in 1964. I saved about a bajillion articles and pictures and then i found the fan websites really contained a lot of the same information as expected, but i wanted to go deeper, so i built this website. There is a lot of history in those guitars! Hi Cara,I hope that you are well. Just posted in the George (and then tried to post in the John) section regarding the news today that John’s J-160E has been found, and is ‘alive’, well, and has been appreciated over the years since it went missing. I also just read your page about yourself, and I was drooling over some of those wonderful former/present guitars of yours. I have a mere twelve or so at the moment, but I love almost all of them. If ever you are in a jamming mood, I am at Bathurst and St. Clair, and can easily jump in a cab or on the TTC to get to most places. I am not all that great – still scratching around the blues scale after all these years – but I find it so hard to find people to play with these days. I gave up long ago booking rehearsal rooms because my friends would always pull out of the arrangement at the last minute. Anyway, all the best to you for the holiday season. Geert. 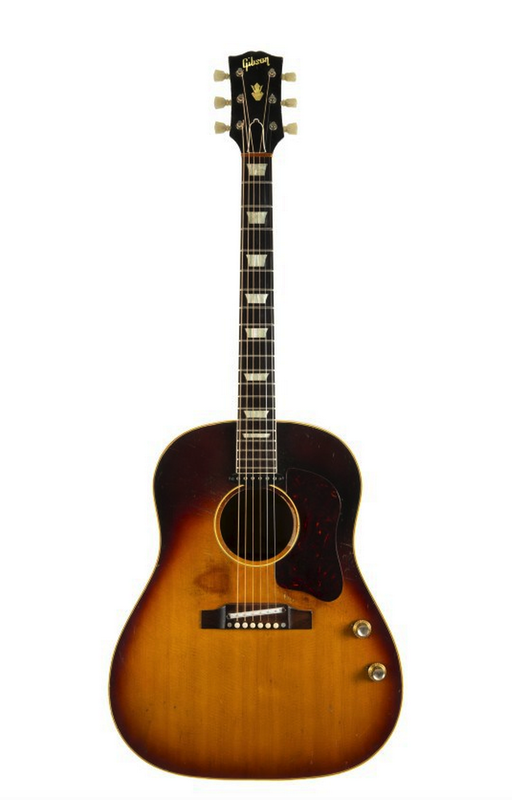 Breaking news – John’s ‘missing’ Gibson J-160E acoustic guitar found. It is good to know that John’s guitar has been looked after and appreciated all these years. And that it has now been found! 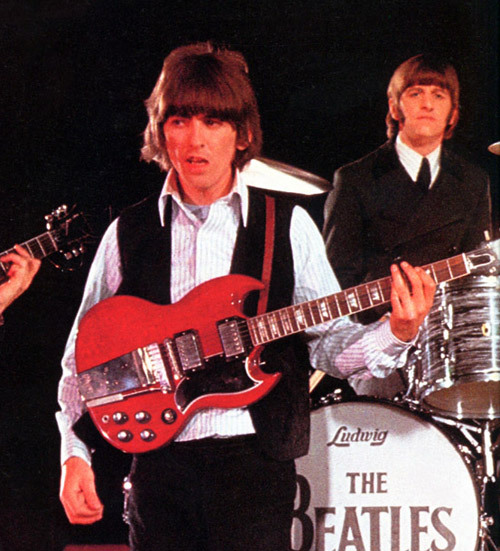 That Harptone L /”12NC 12 string….I’ll bet it’s the same guitar Ringo is holding on the “It don’t come easy” 45 pic sleeve..? There are not a lot of comments from George that i can find, but i will do some more research and send anything i can come across. How do you like the guitar? Thanks for stopping by Kerry. This is an excellent and fun as reading on information that guitar geeks, like myself, can enjoy as well as fill in gaps in our knowledge about such things. Thank you. One piece of information I am curious about is the year the sunburst strat with the Darkhorse sticker is?? Can’t find this info anywhere and was wondering if you had something on that. On the several pictures one can find, it almost looks to be a pre-59 as far as the sunburst goes…..almost looks two-tone and then other photos it looks more three-tone but it has no bullet truss-rod and a small-head with spaghetti logo….Just curious. Great work BTW! Hard to tell if this is one of the Strats from Sho-Bud that Eric Clapton gave him in 1970. George said “I don’t have a whole lot of Strats. I’ve got a sunburst one, one that Eric gave me quite a few years ago. There was one that was stripped to the wood that I gave to Spike Milligan. 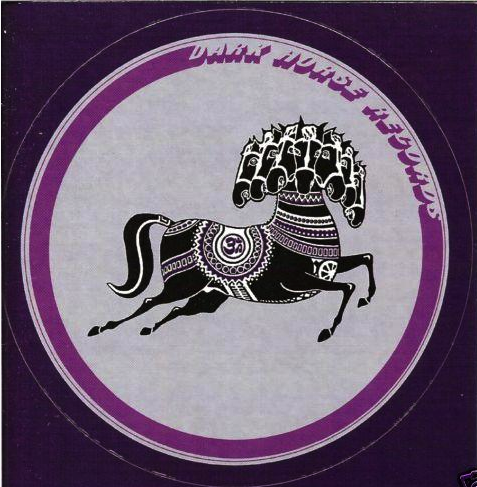 I looked for a few years for information on the Dark Horse Strat, but no info has come forward. 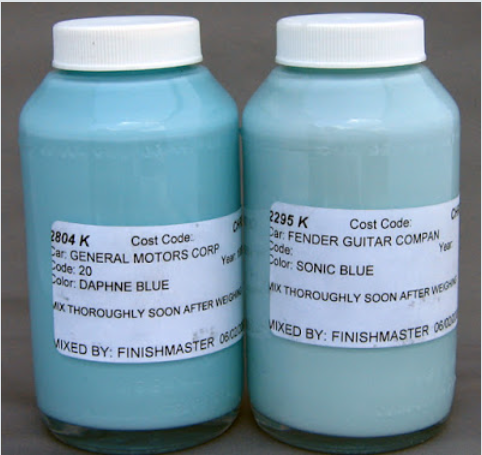 Definitely, the Blue Fender Stratocasters were ‘Sonic Blue’ …I own a vintage Fender Musicmaster which is ‘Daphne’ Blue – it is a richer, deeper blue with hues of turquoise, it is no where near the powdery Blue like the ‘Sonic Blue’ Stratocasters. I bought a Squire Strat a few years ago specifically because it was Sonic Blue with a rosewood fingerboard…it’s a cool color, sometimes looks light green depending on the light in the room. Also have a Gretsch Pro Jet (like George’s Duo Jet and a Country Gentlemen…I once owned a Tennesean but sold it to my drummer when I needed cash…would love to have that back! Clearly influenced by George.